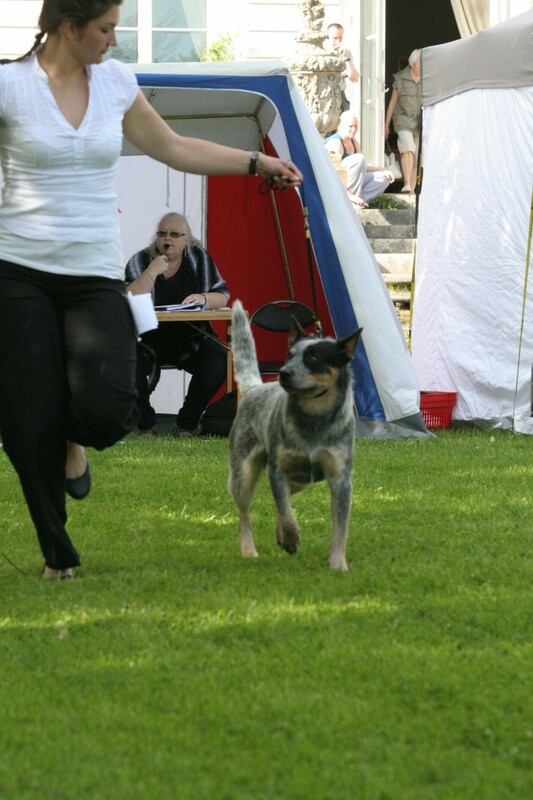 Today Working Mates Another Dewil "Junior" debuted in starters class in tracking (apellen) - 14 months of age. 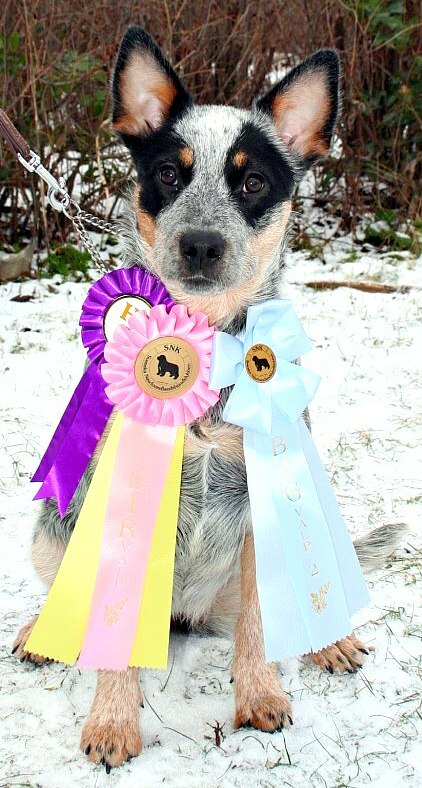 He did really well! 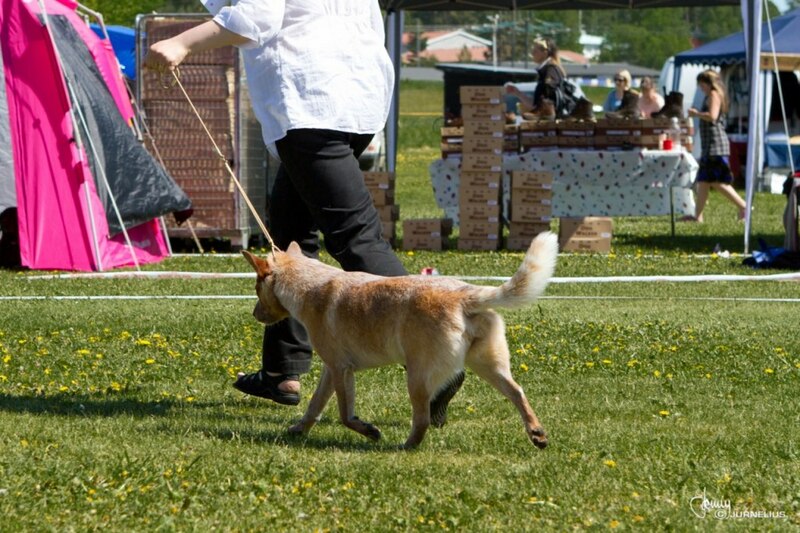 9.9 /10 on the tracking and passed! 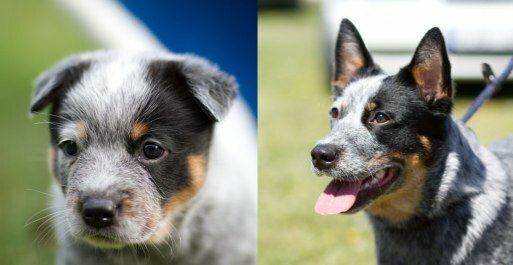 X-ray results and they couldn't be better! A/A Hips & 0/0 Elbows! 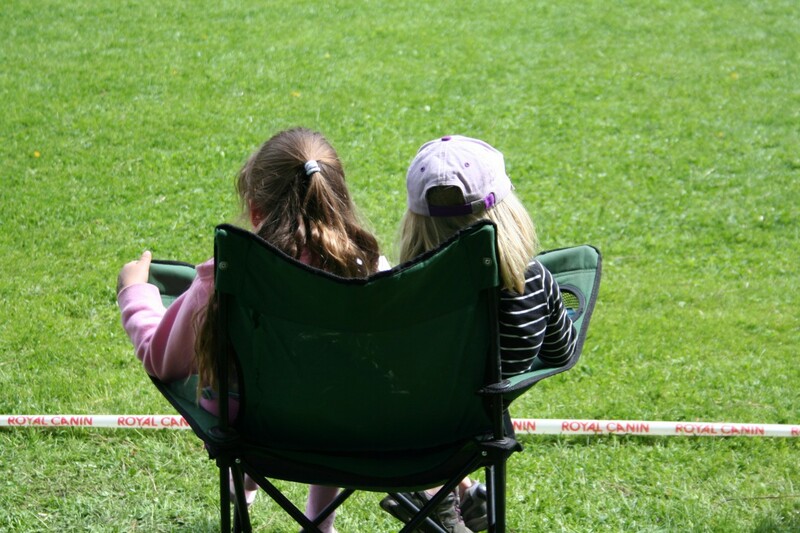 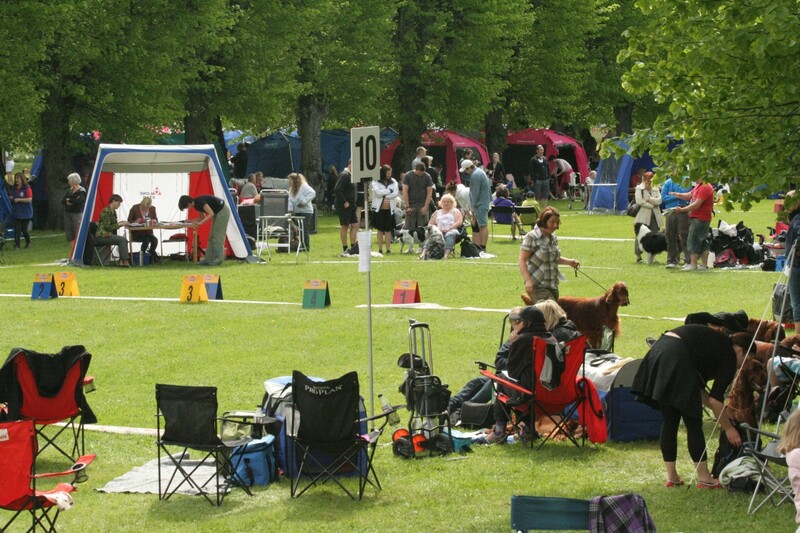 This weekend I left for Karlshamn (7 ½ hours drive) to judge freestyle & HtM. 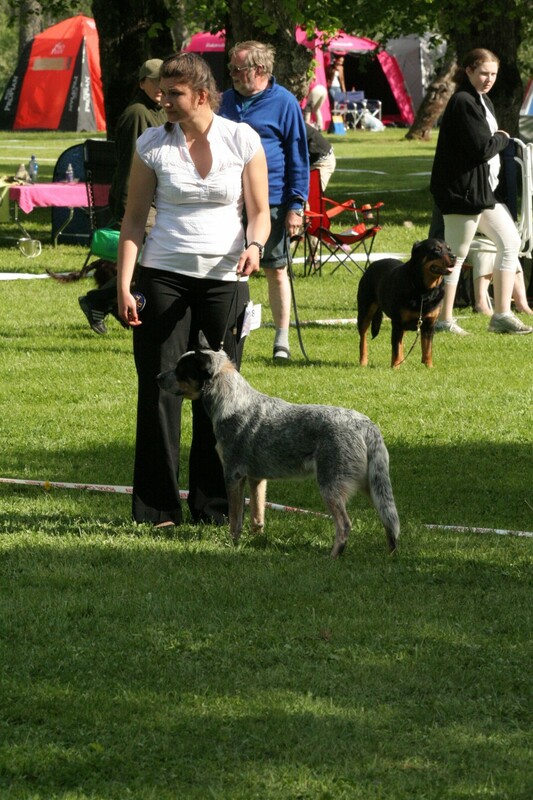 Before that I competed with Sydney & Queenie in Rally obedince- beginners class. 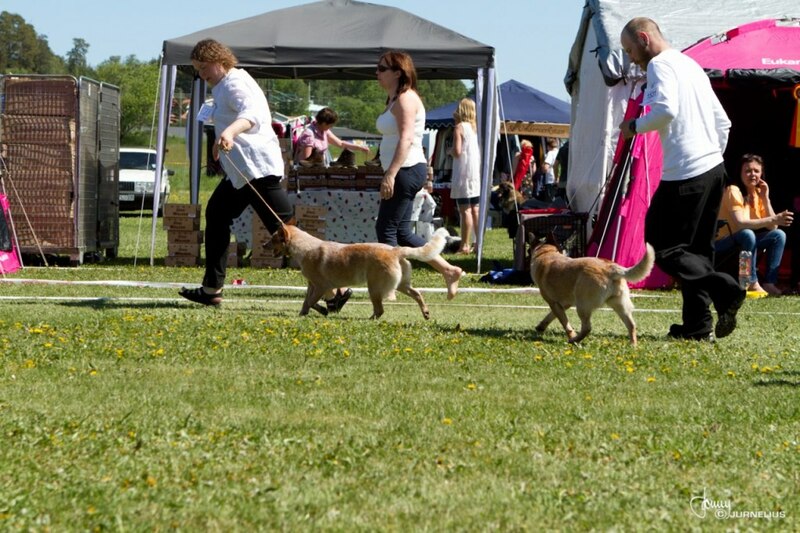 Both Sydney & Queenie did great I on the other hand missed some of the signs... Sydney got 89 points and got her title RLD N (rally obedience diploma- beginners), Queenie got 86 points on her debute! 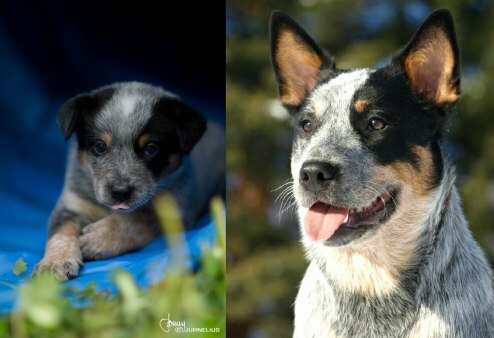 My beautiful A-litter are one year already! Time flies! 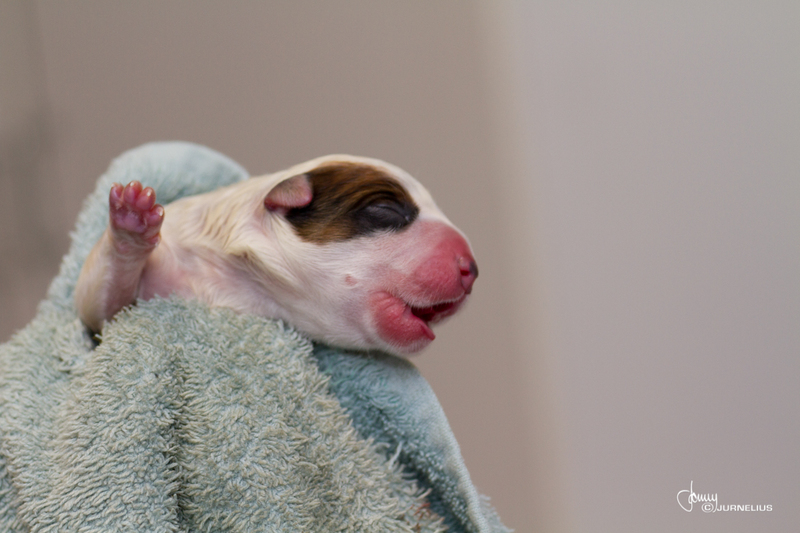 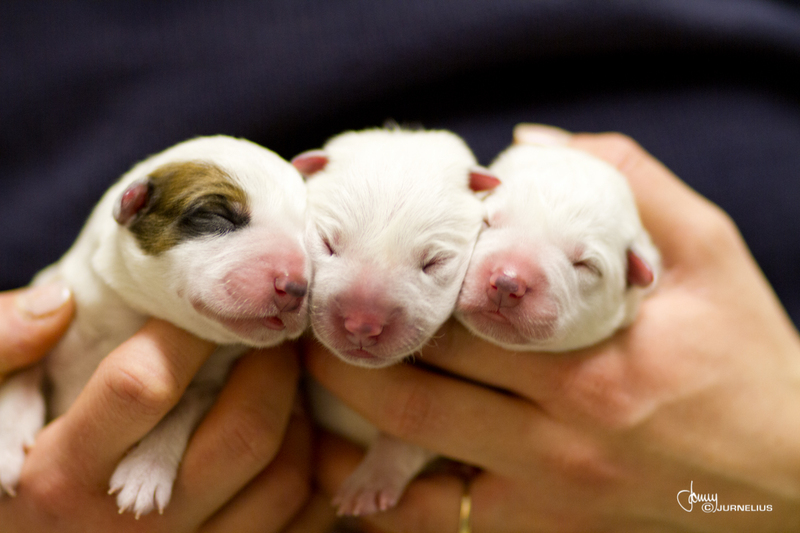 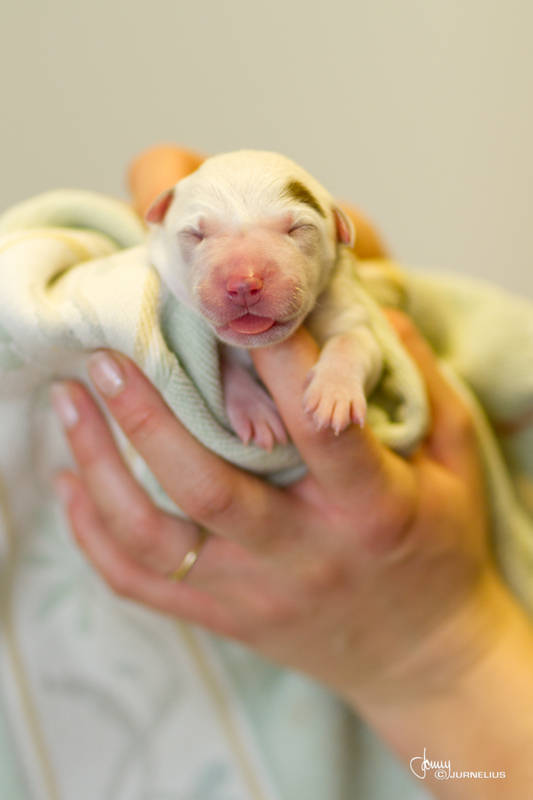 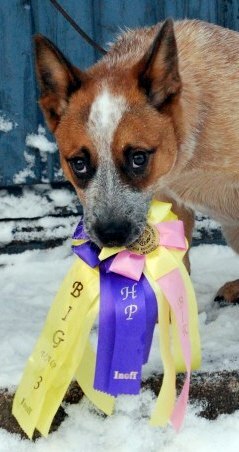 I want to thank all of you puppy buyers for taking such good care of my babies! 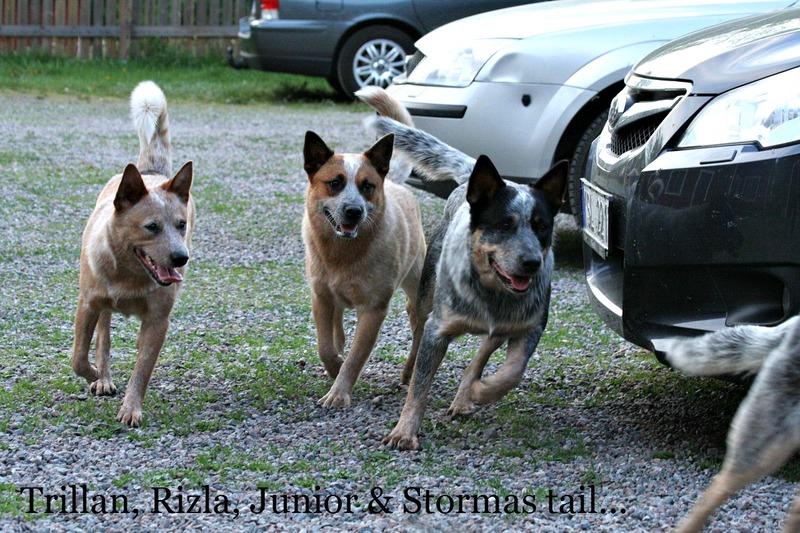 Visit their page to read more about them. 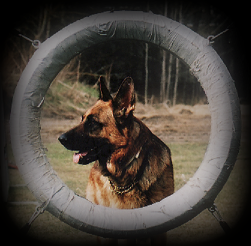 Was replaced at 10 months & renamed form "Myran" to "Nim". 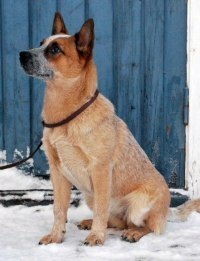 She is now living with the Krusic family in Stockholm. Lives in Malung with Rebecka and Arnout. 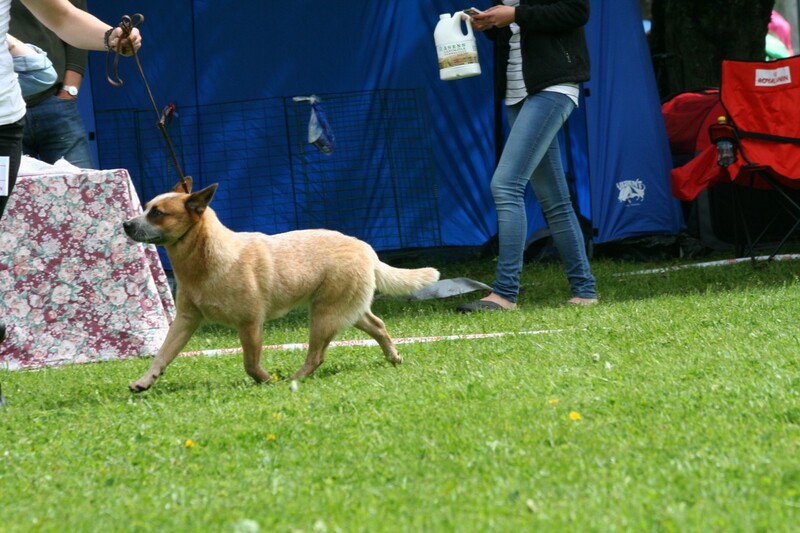 She has so far become BIG- 3 in a puppy show, recived one CAC & BOB & yesterday she and Arnout made their debut in obedience class 1. 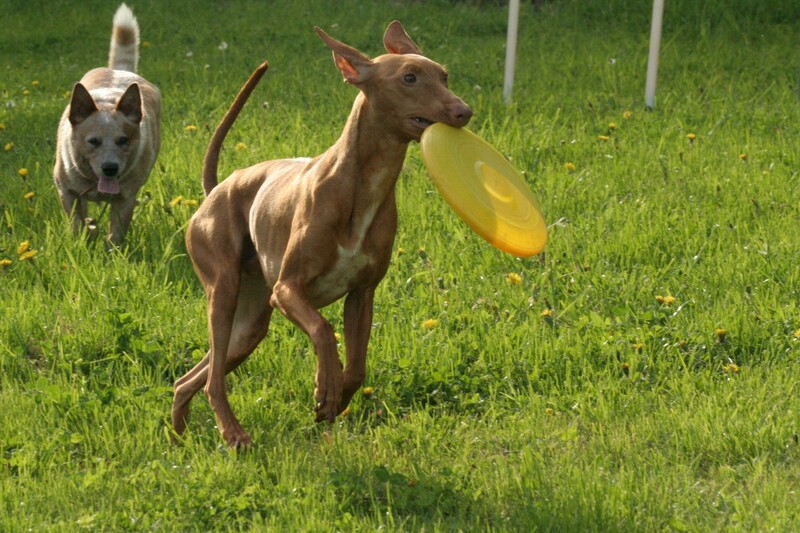 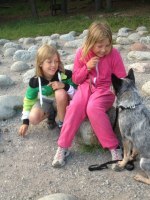 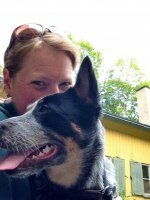 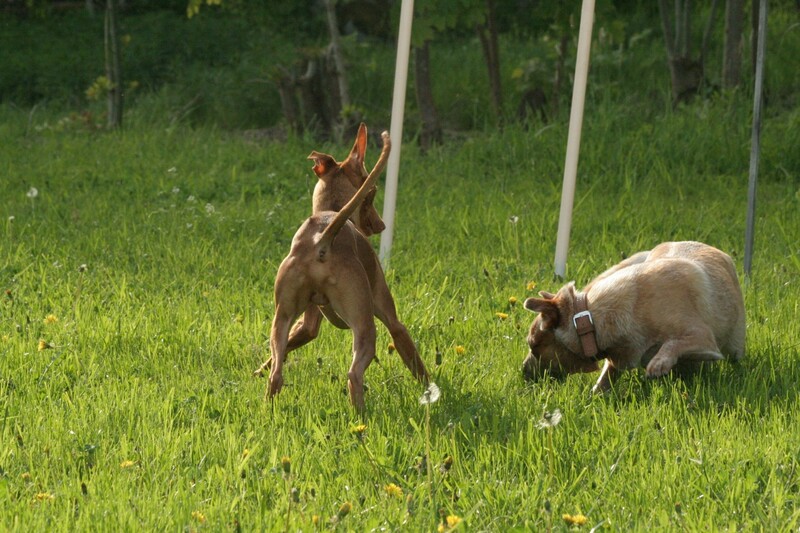 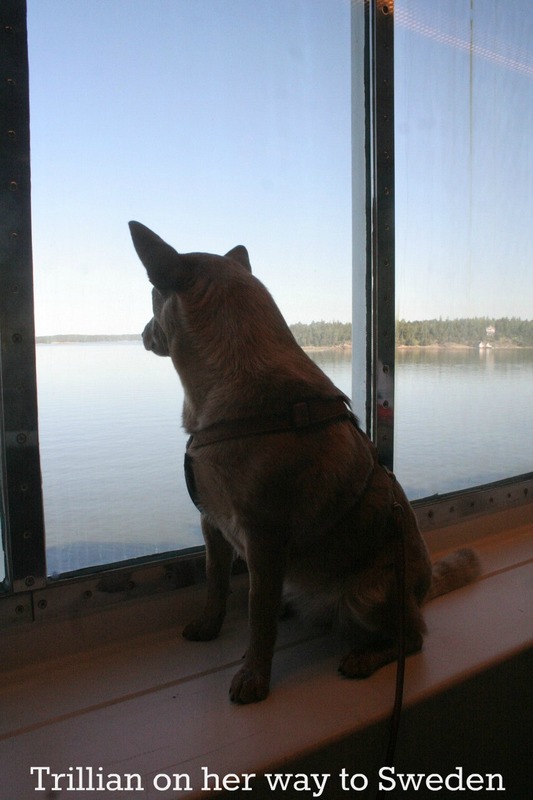 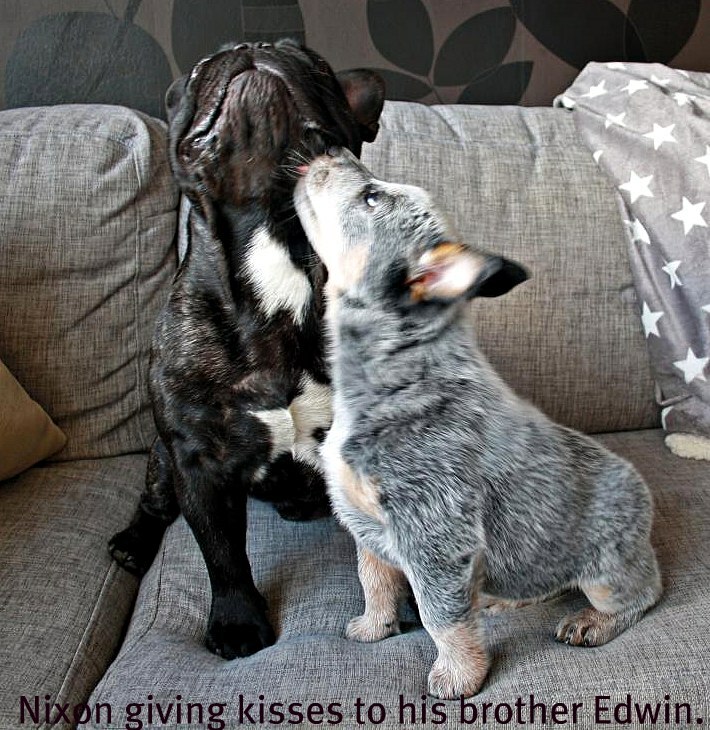 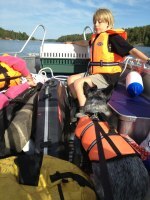 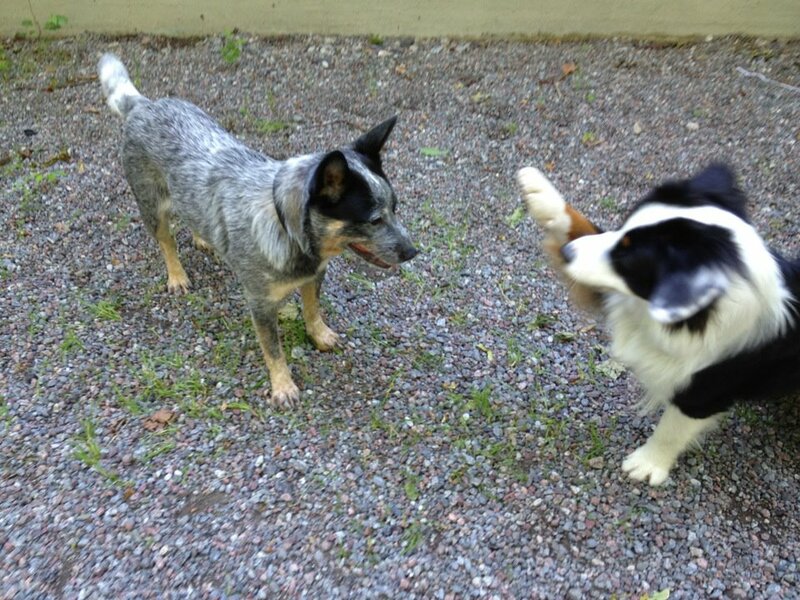 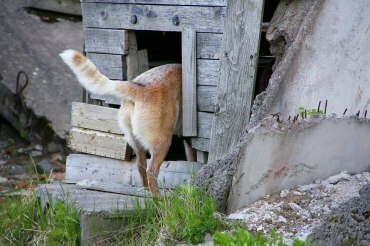 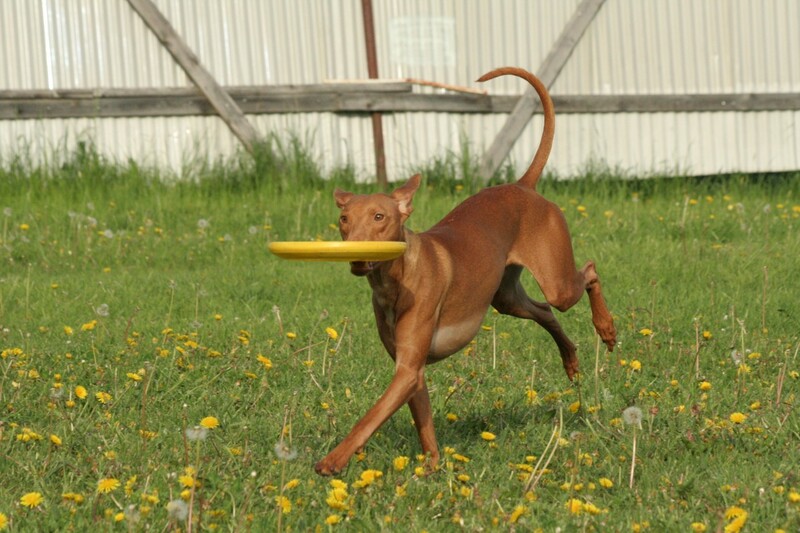 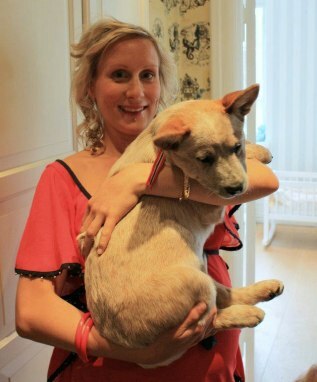 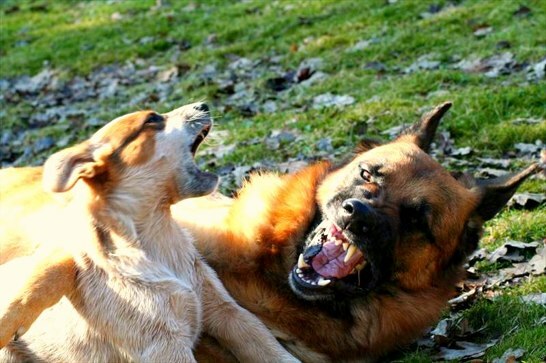 Is one of my breedingterm dogs, she lives with Emelie in Stockholm. 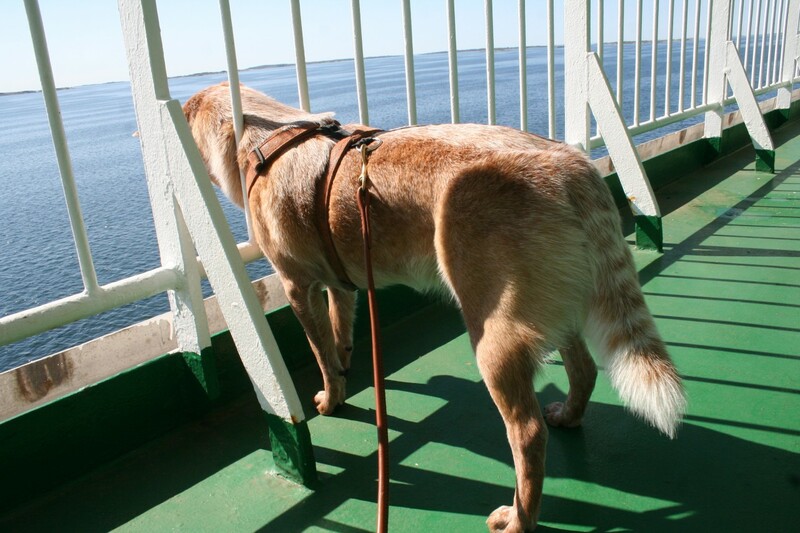 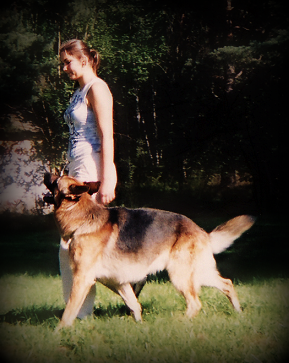 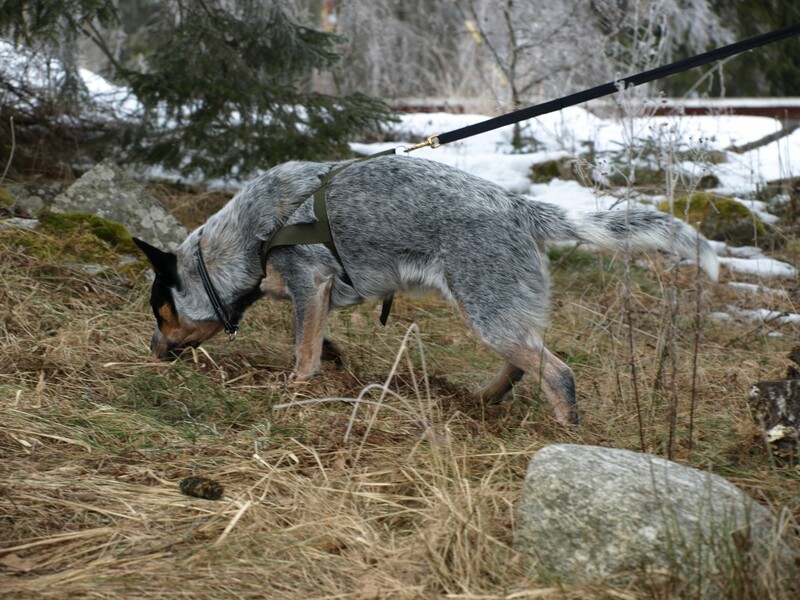 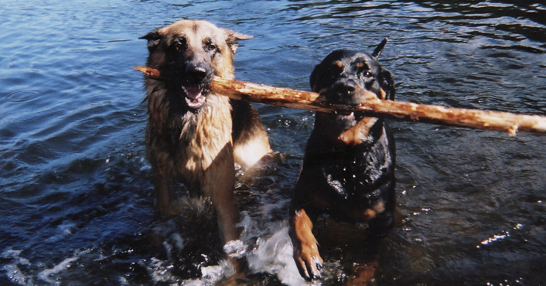 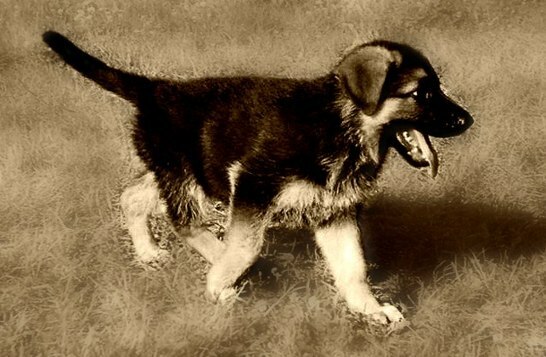 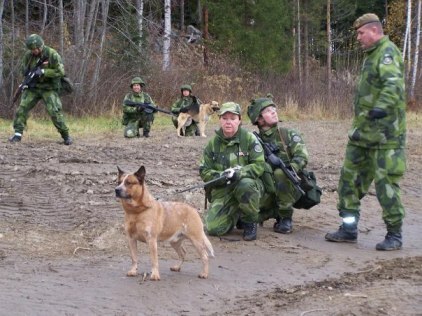 She has been training in Search, Tracking, Obedience & IPO. 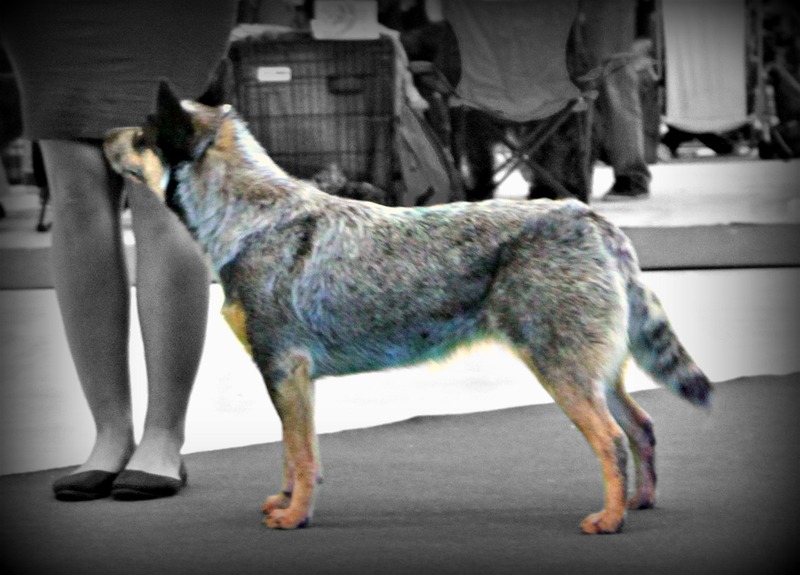 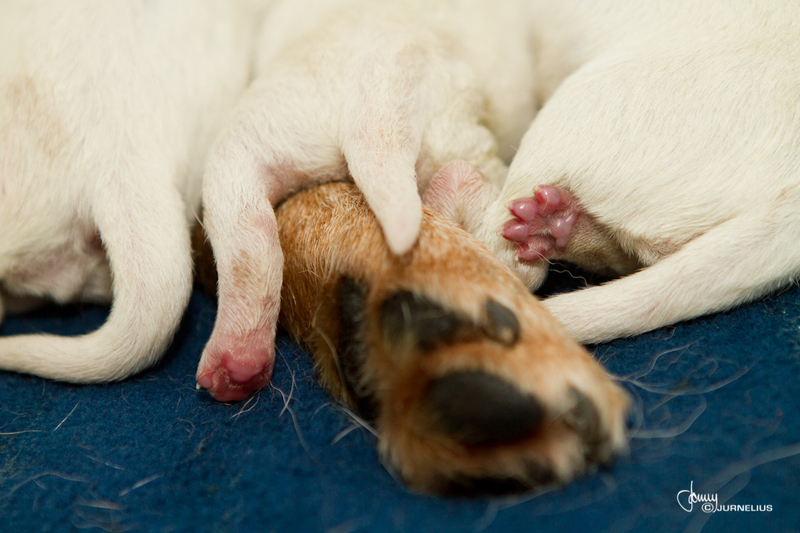 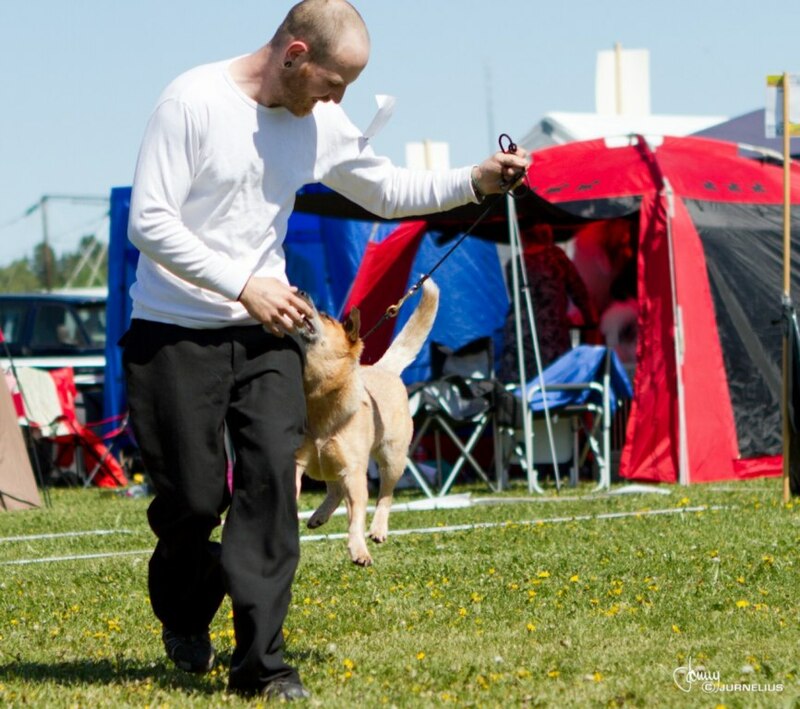 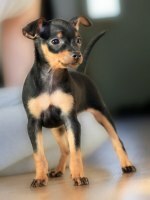 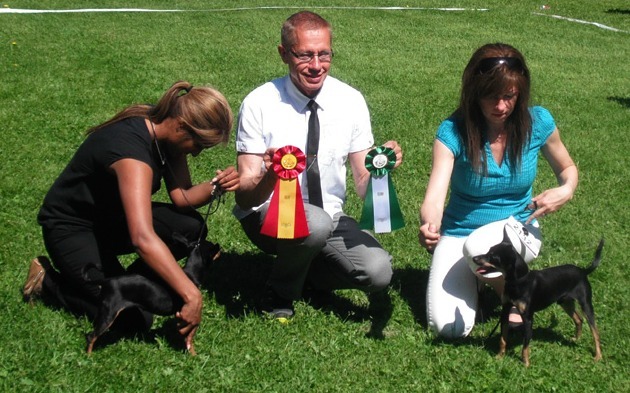 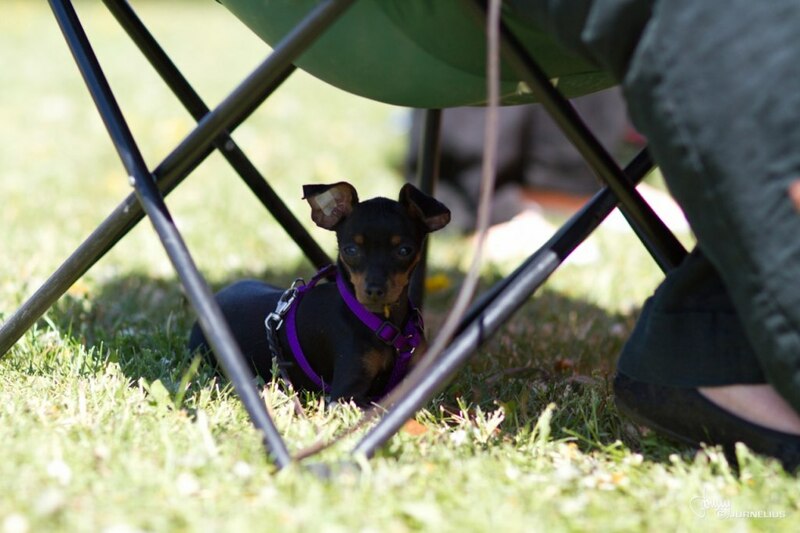 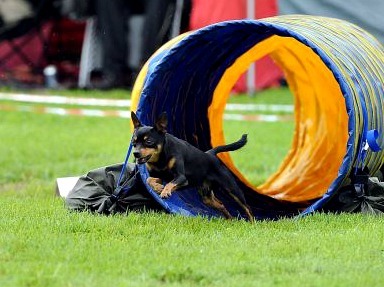 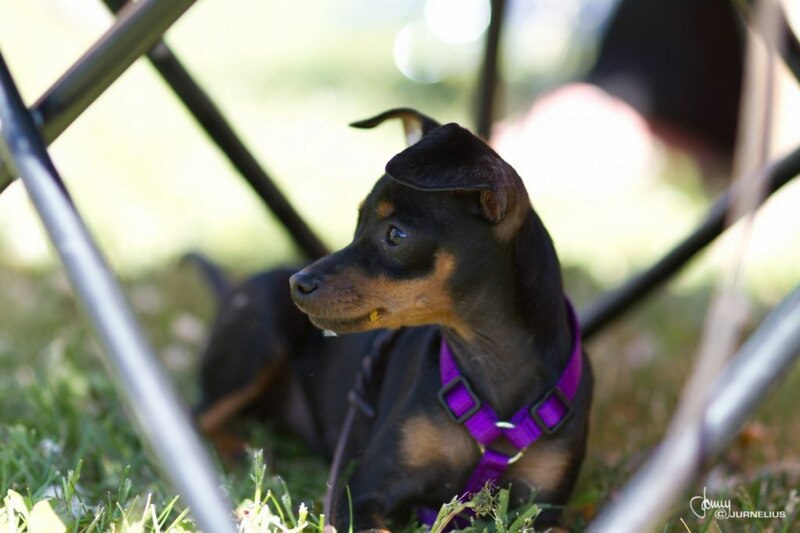 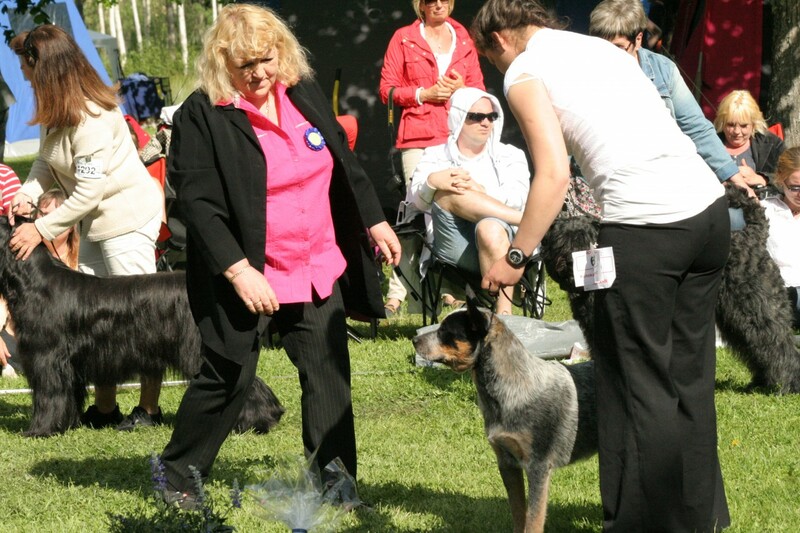 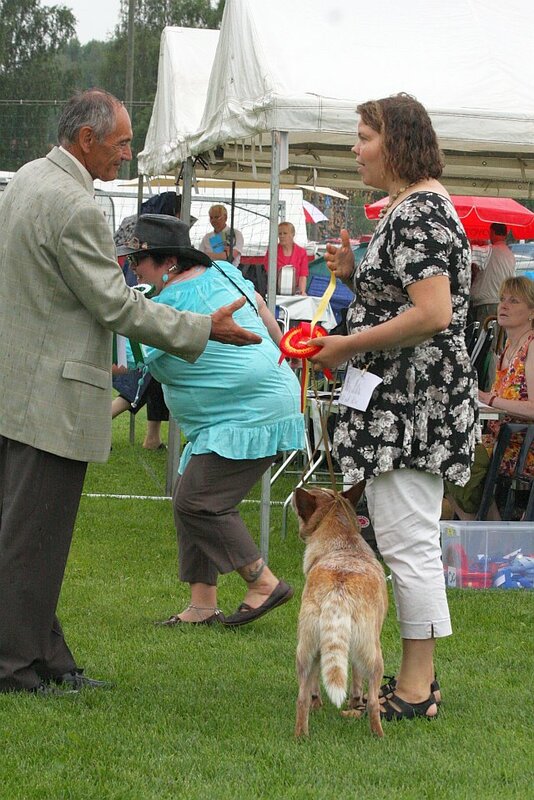 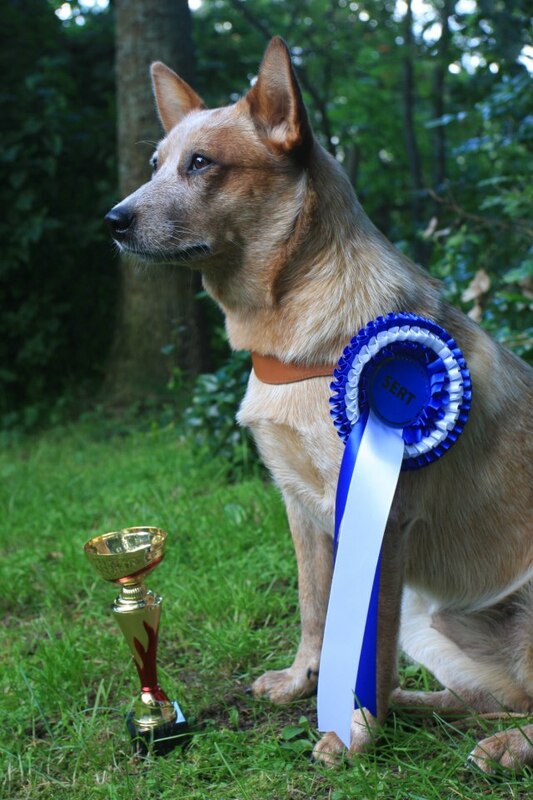 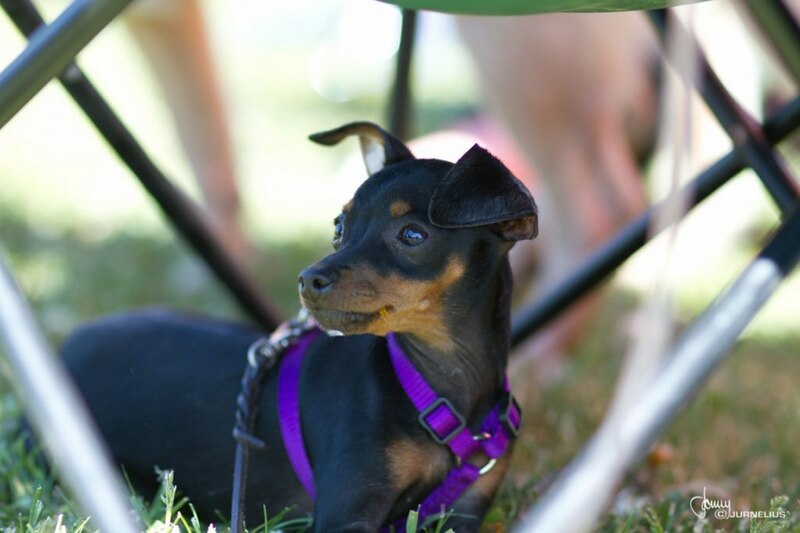 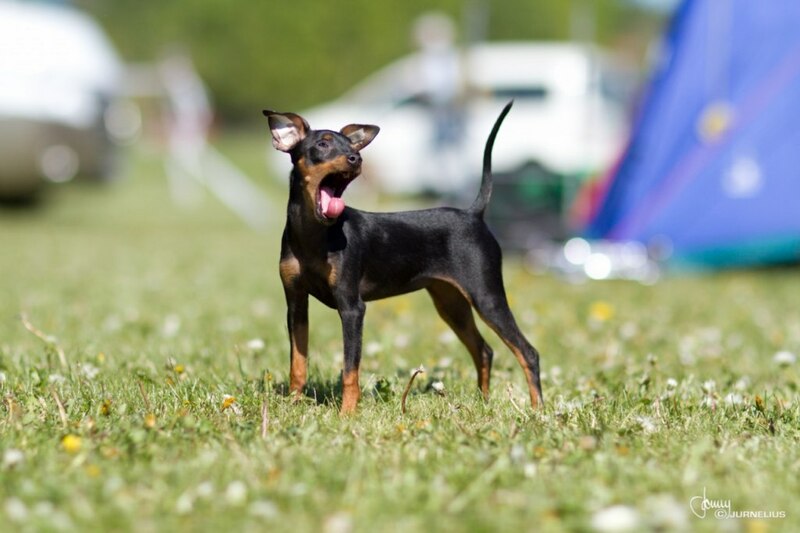 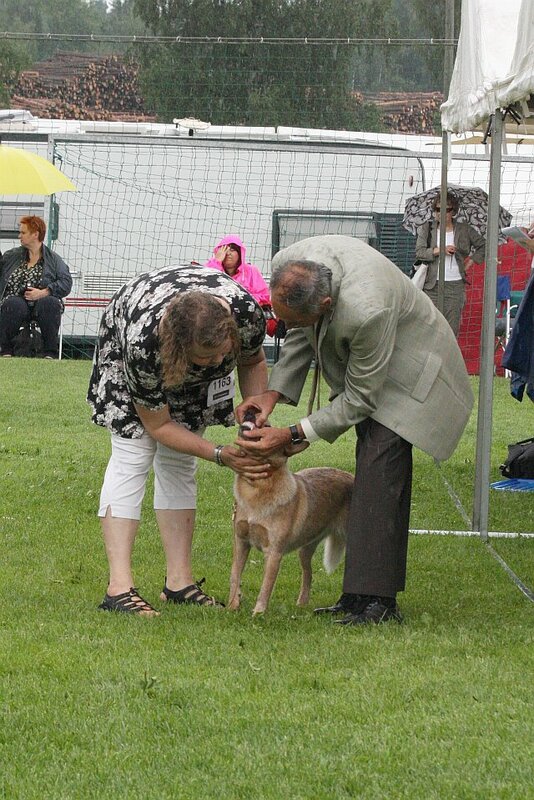 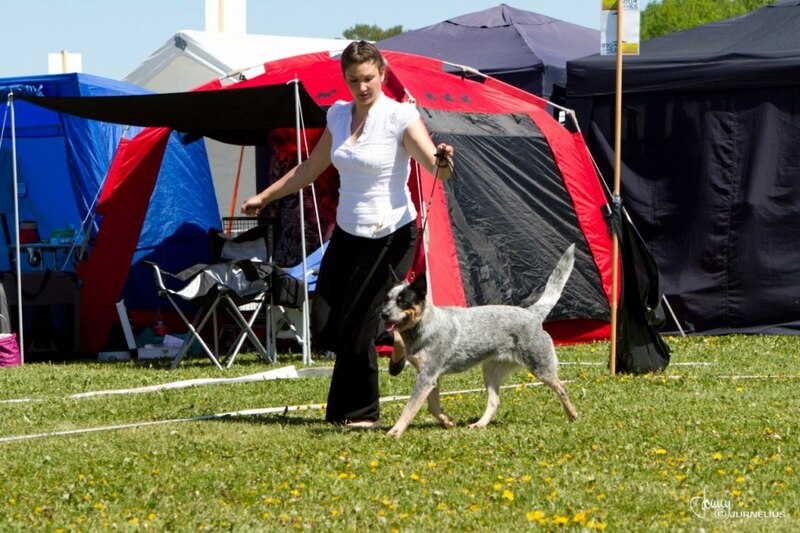 Storma has so far become BIG- 2 in a puppy show, receved 5 CAC, 4 BOB & 1 BOS in junior class. 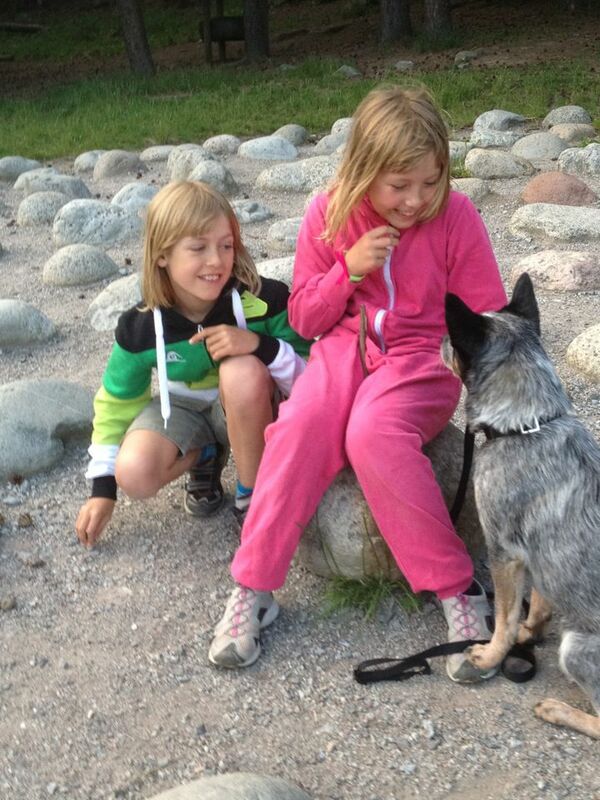 Working Mates Admire My Fire "Trillian"
That lives in Finland- Åbo with Hanne, Kalle Tuulos & family. 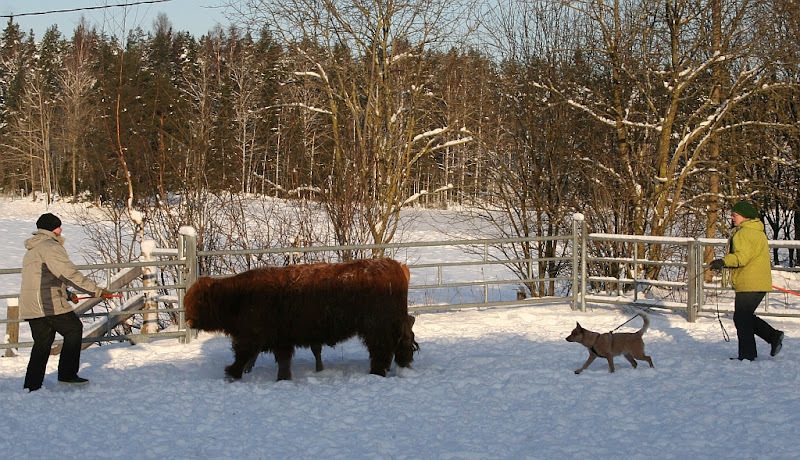 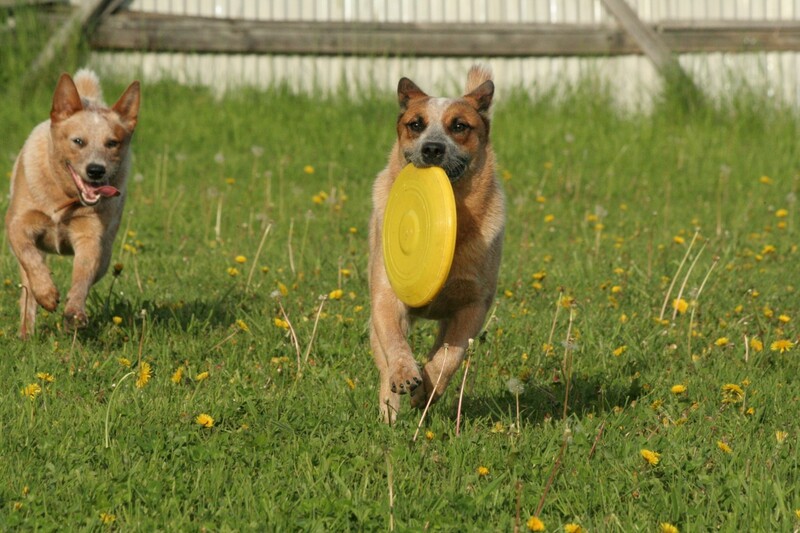 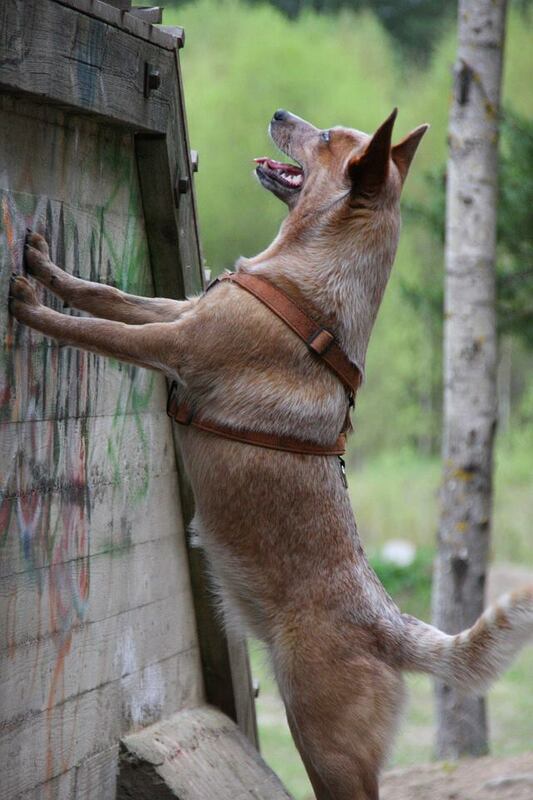 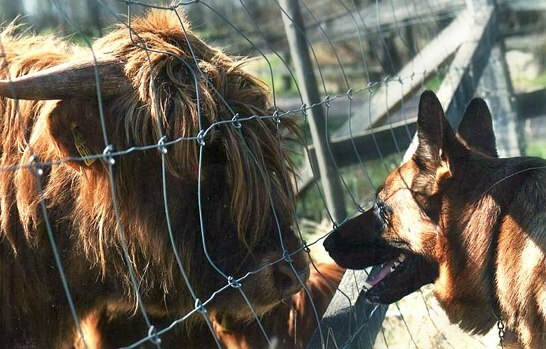 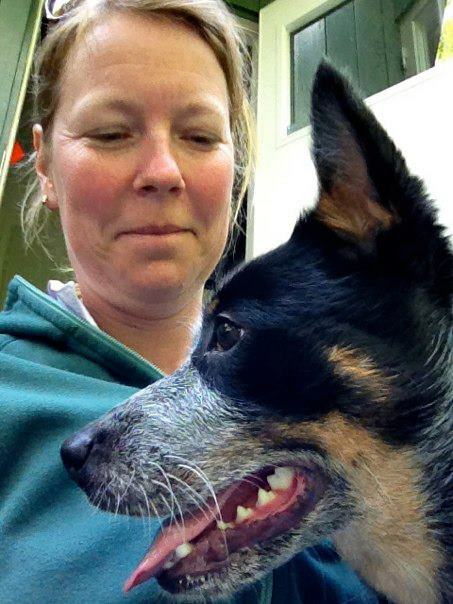 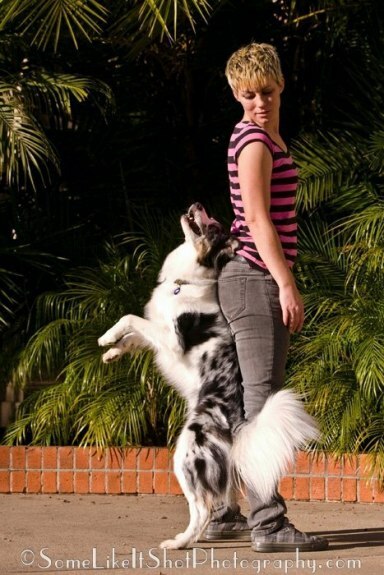 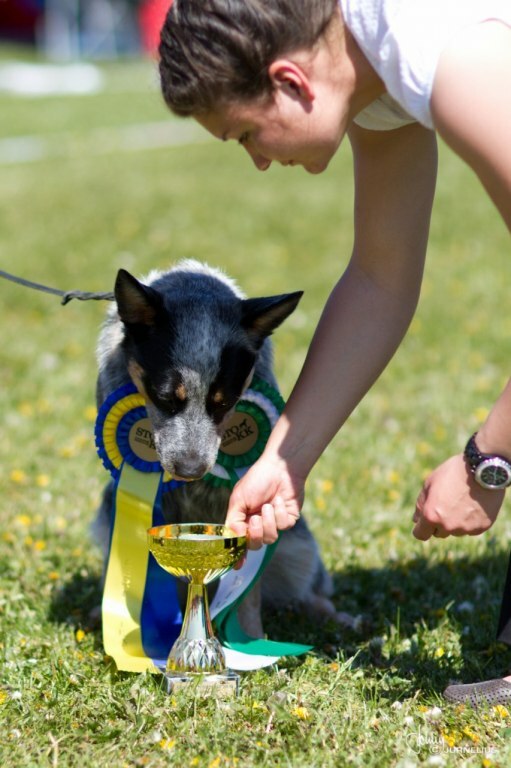 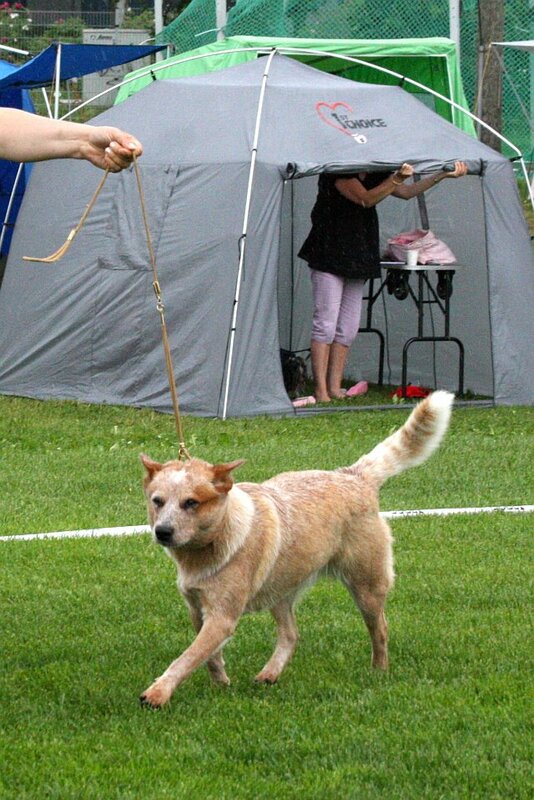 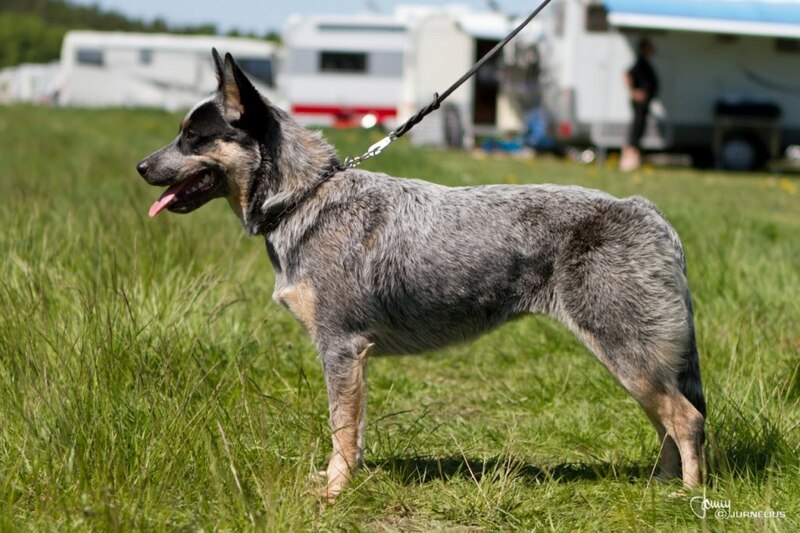 She has been trained to become an rescue dog and also some obedience, freestyle and herding. 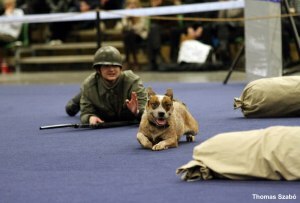 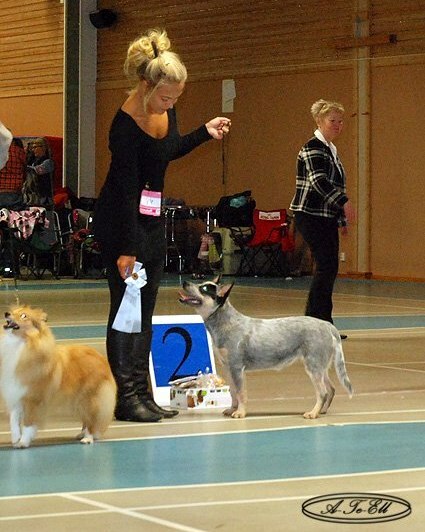 She has recived 1 CAC & BOB in Finland. Lives in Sundsvall with Christina Näslund. 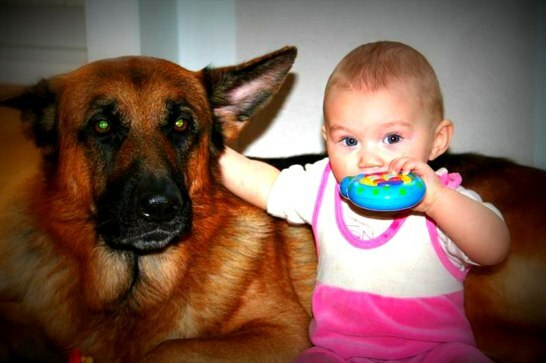 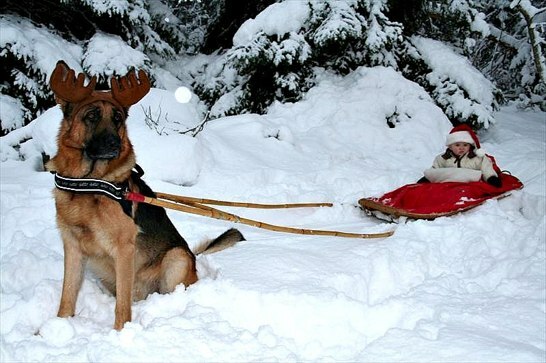 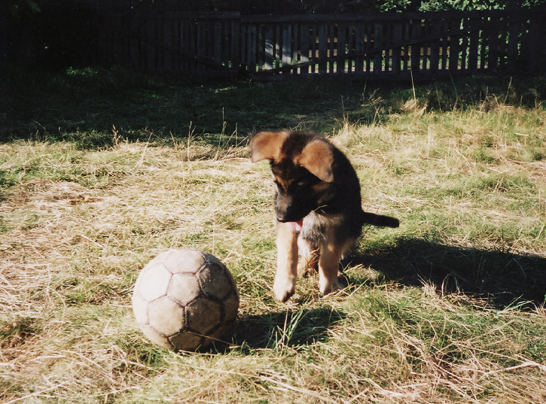 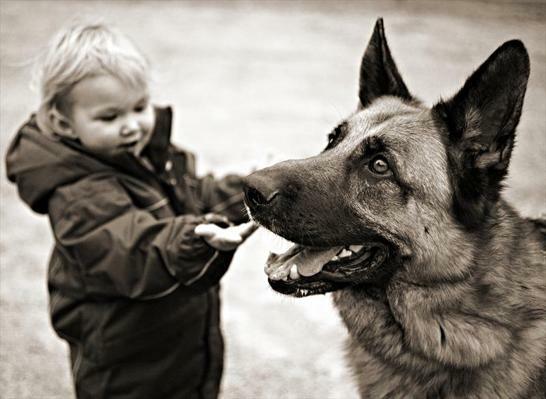 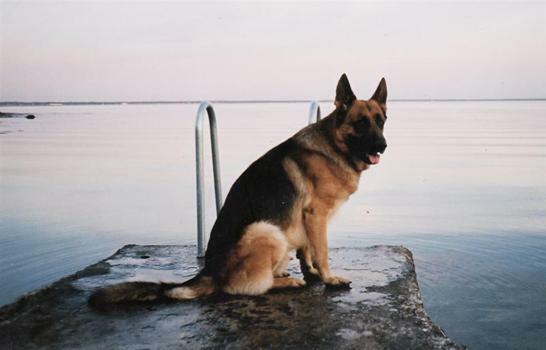 He has been trained in Obedience, Tracking, Search, Freestyle and also to become a Patrol dog as his father. 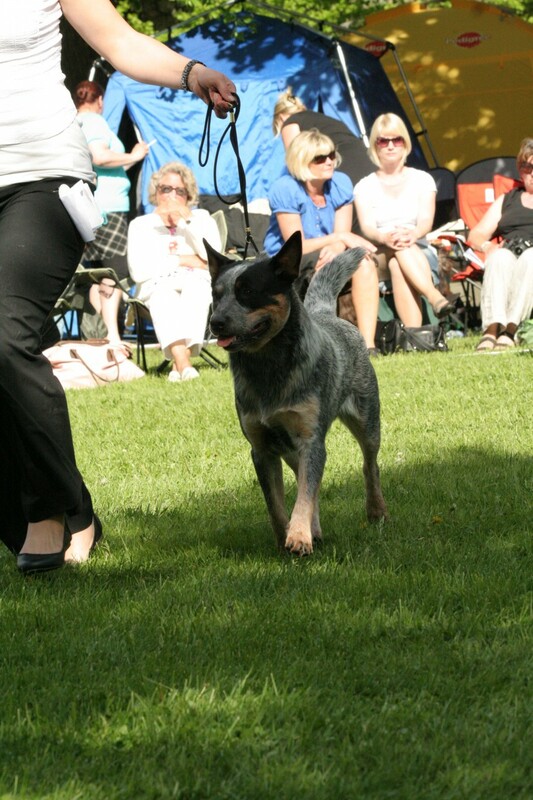 He has so far recived 4 CAC & 3 BOB and also shortlisted in the Group at 10 months. 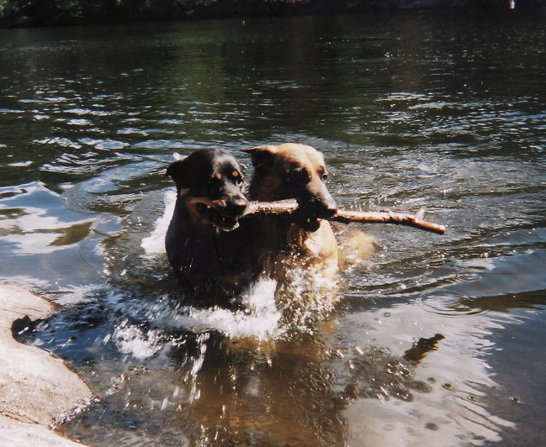 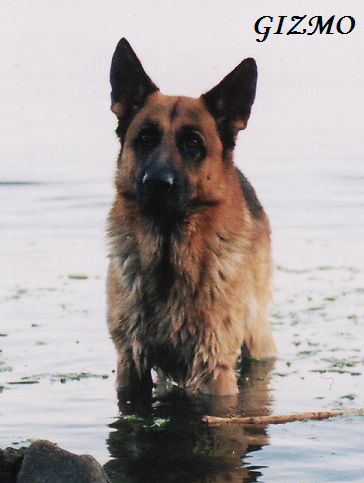 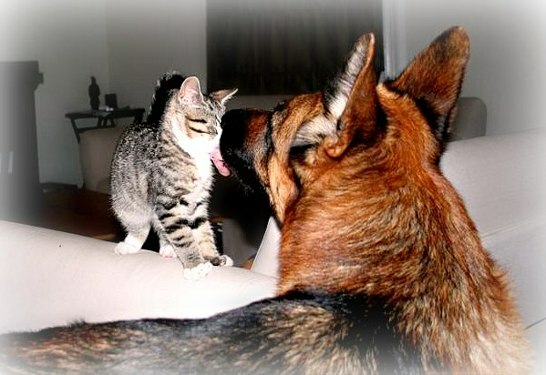 We will always remember this charming, playful, intelligent & loving boy who has given us 10 wonderful years together. 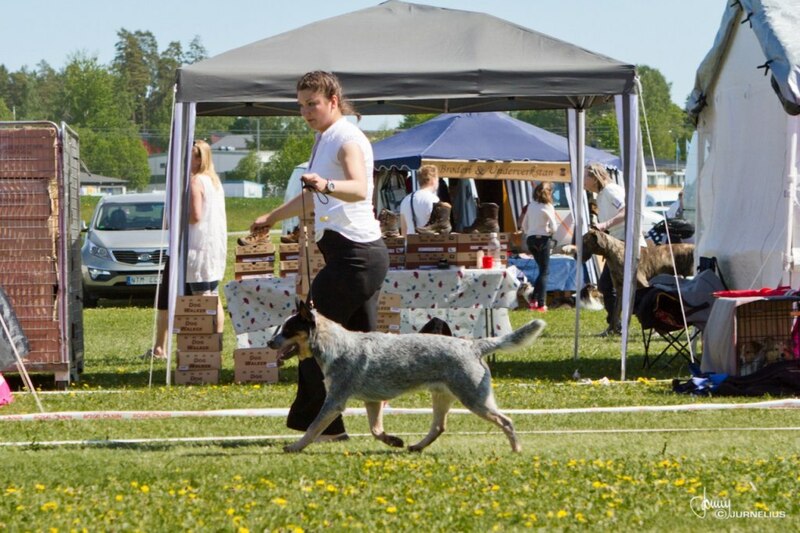 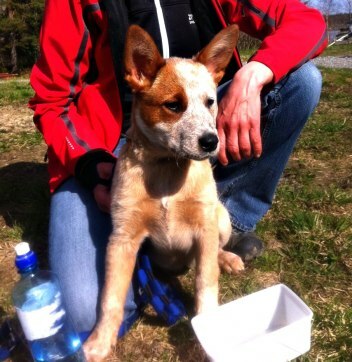 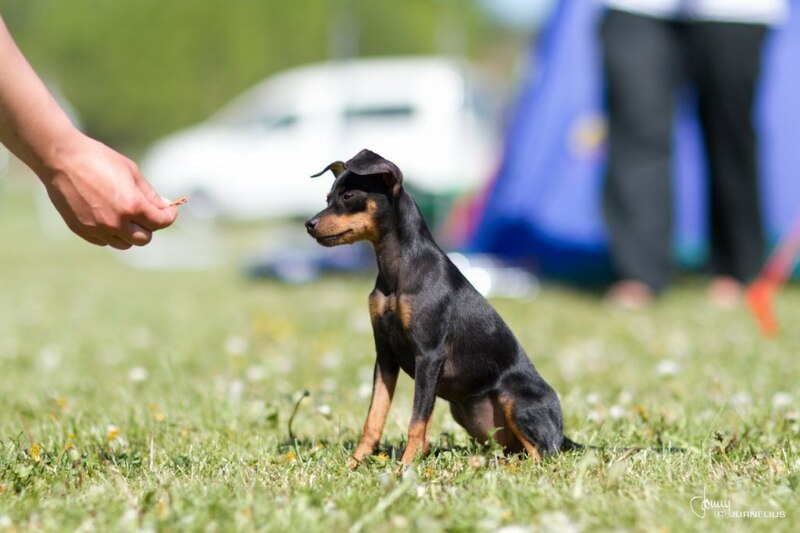 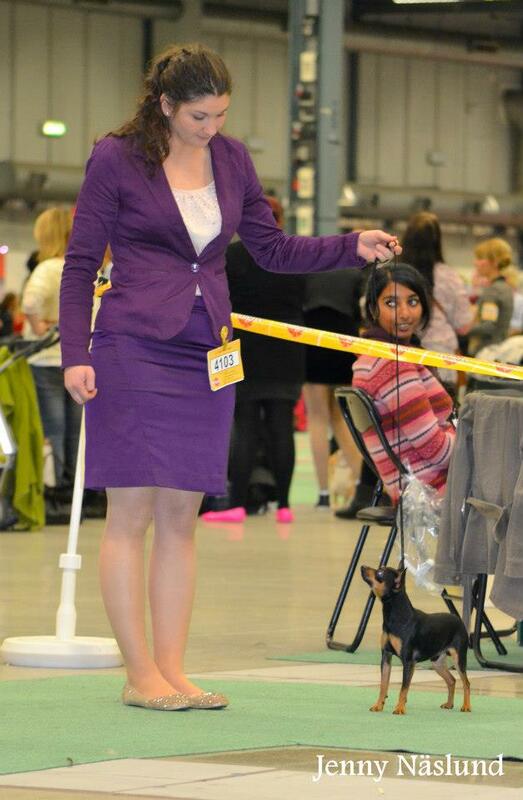 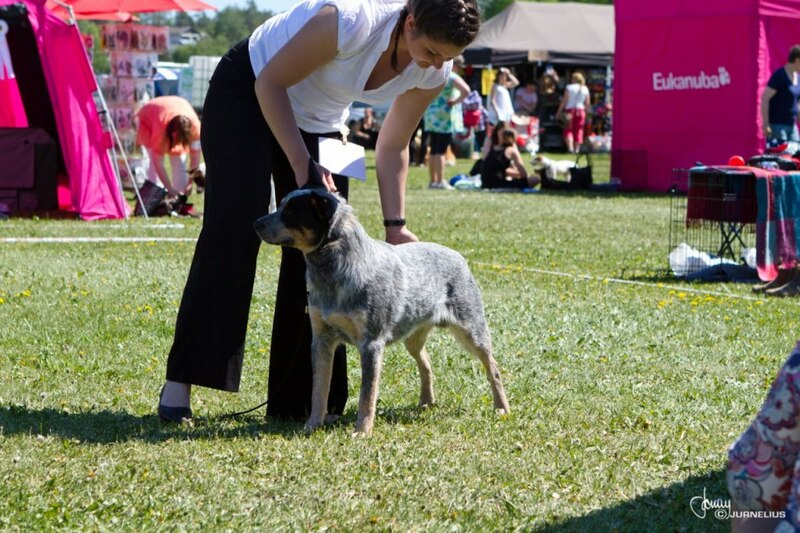 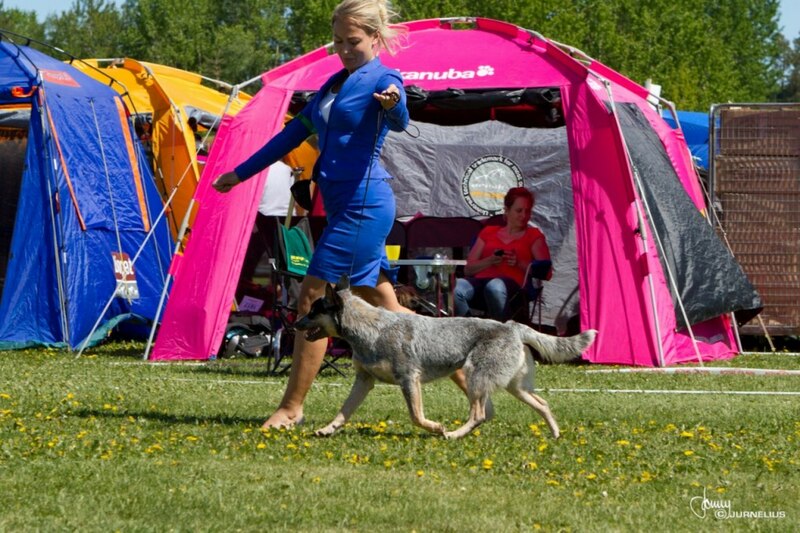 Working Mates Breaking The Rules "Rejza" at her first show 4 months and 2 days old in Piteå. 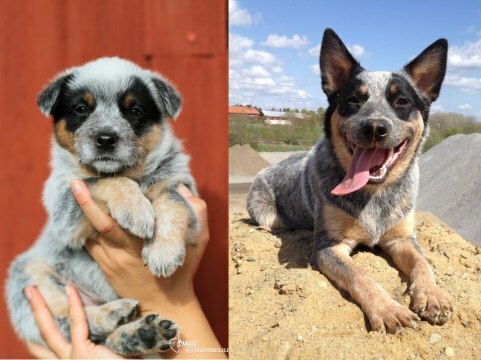 She became BOB and then BIS-1 puppy! She competed against much older pyppys, up to 9 months. 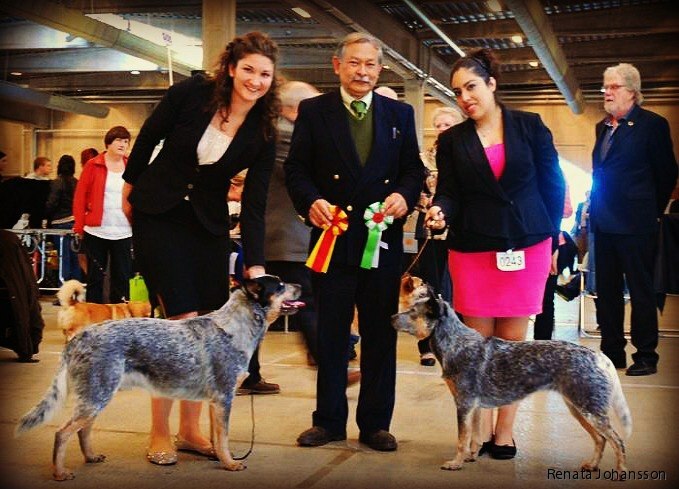 Huge congrats to owner and handler Jonna Almänes! 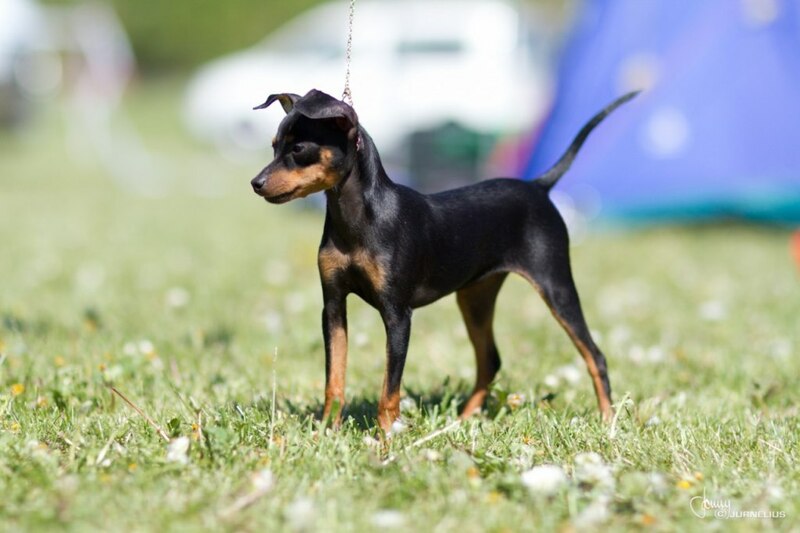 Critic: Very nice puppy, excellent head and expression, good eyes, excellent proportions, very good angles, excellent movement for her age. 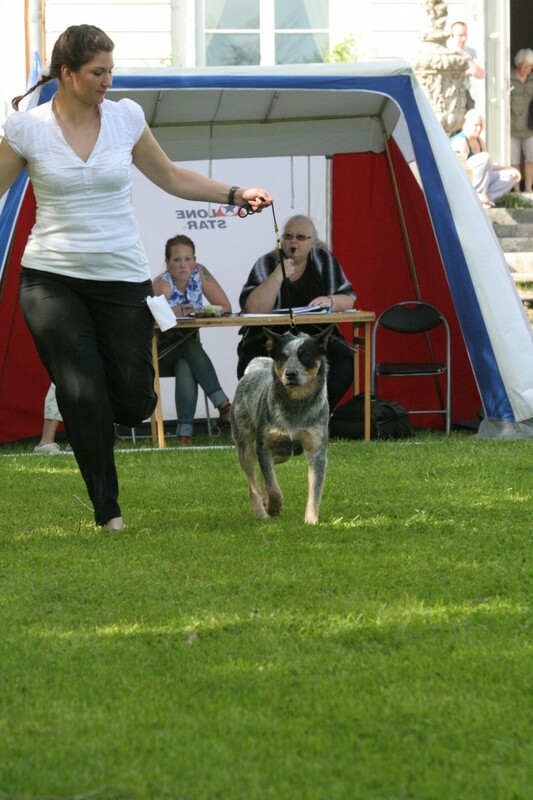 Working Mates Action My Attraction "Storma" was also shown today, but in Norrköping. 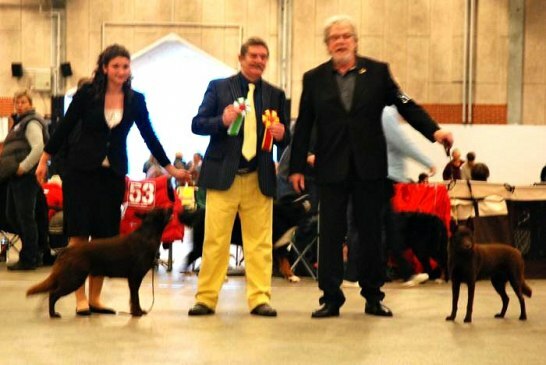 She became BOB and got her 4:th CAC in junior class! 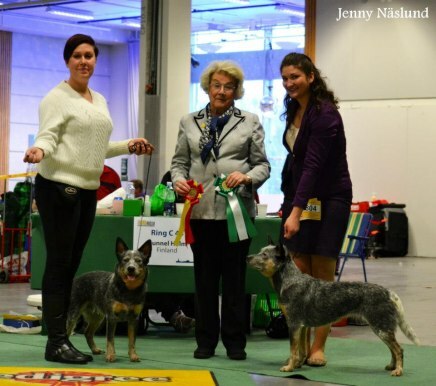 Congrats & thank's to Emelie Dahlgren! 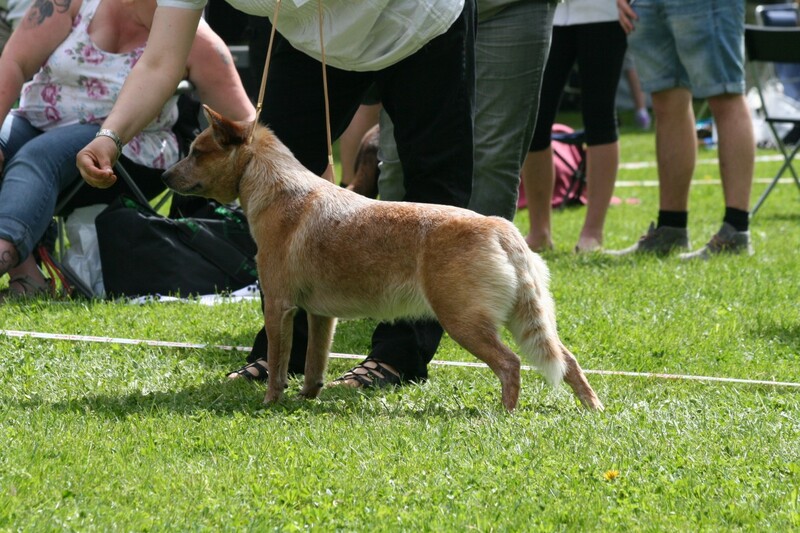 Critic: Good proportions of the head with good pigmentation. Proper neck. 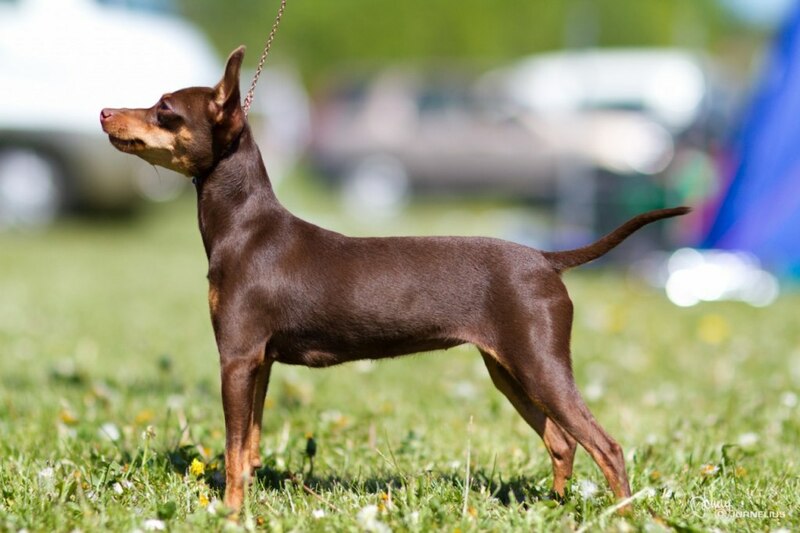 Well developed and strong body. 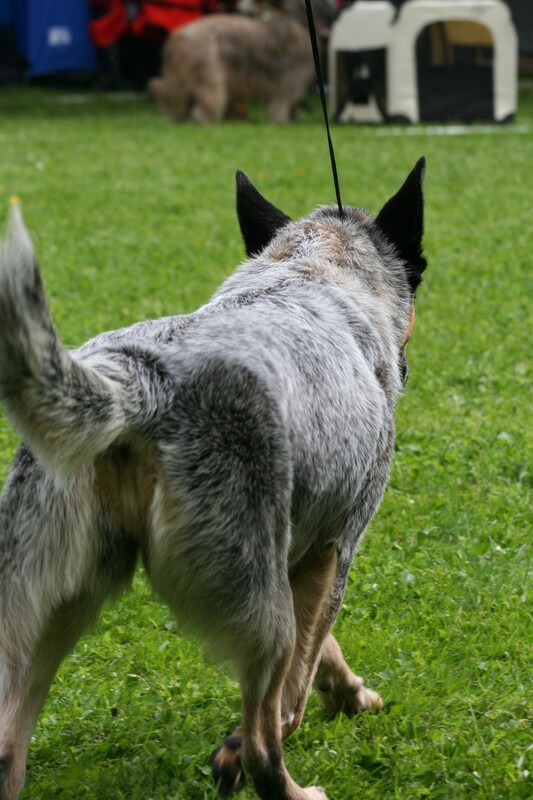 Good angles. 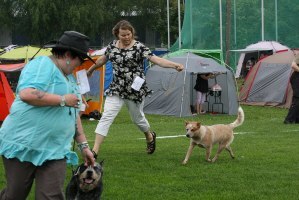 Good movements with lots of energy. 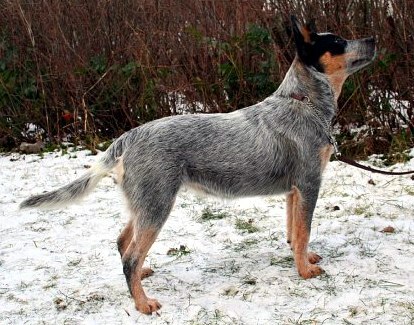 Good coulor and coat quality. 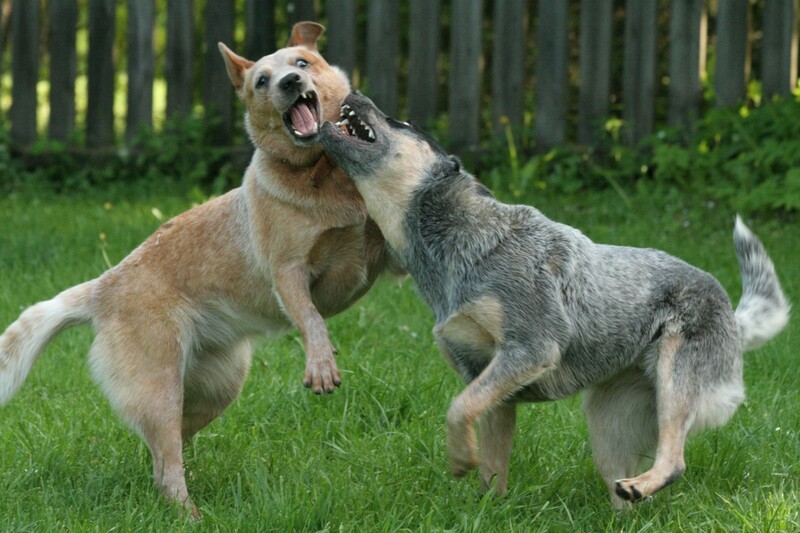 Very good temperament! 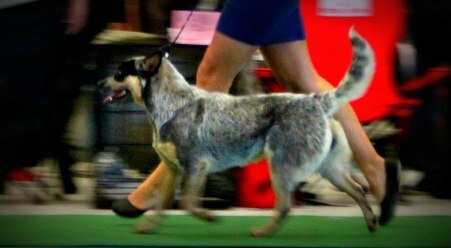 2 days of show with the A- litter - 10 months old. 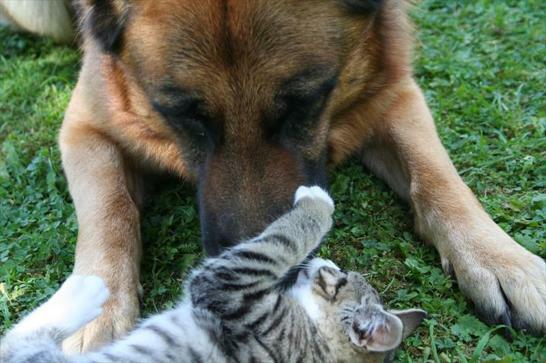 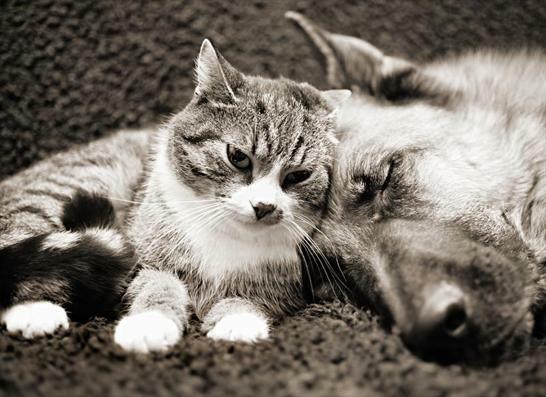 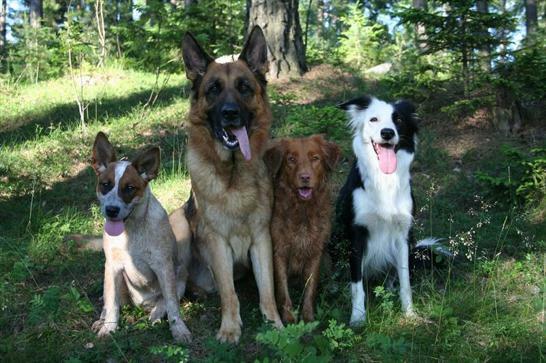 Great to see them and their owners together again! 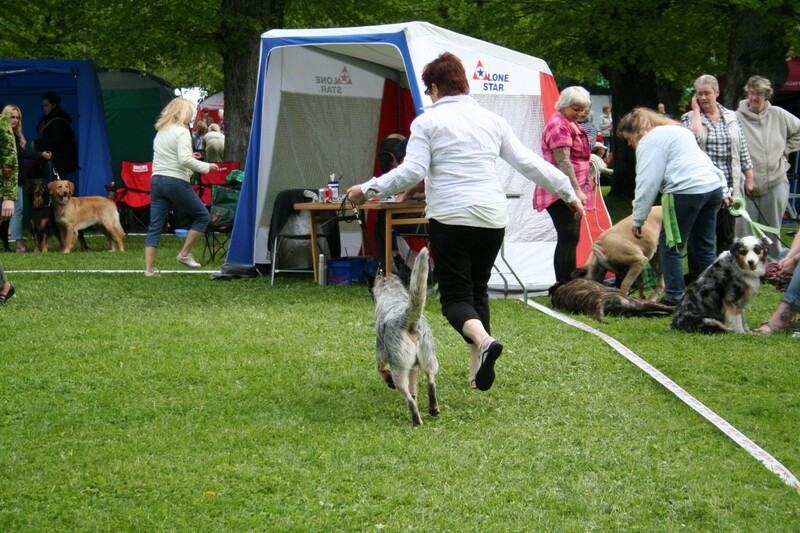 Saturday 26/5 we where at Österbybruk INT. 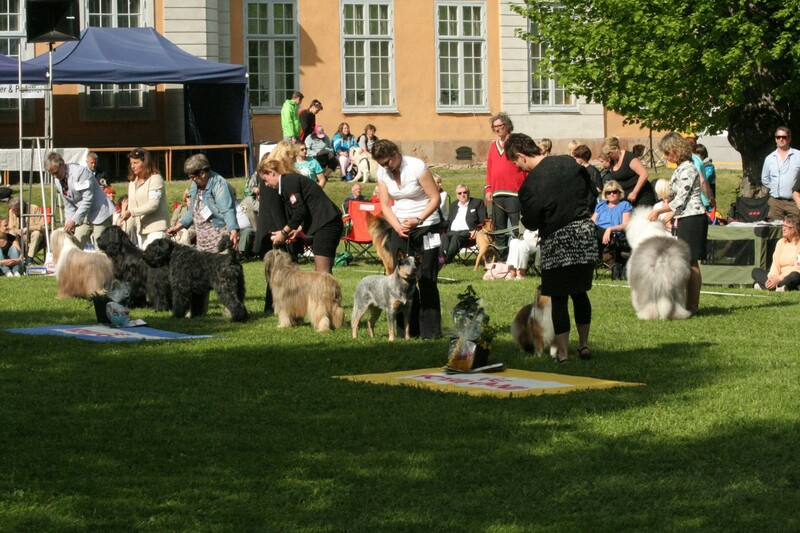 - Uppsala. 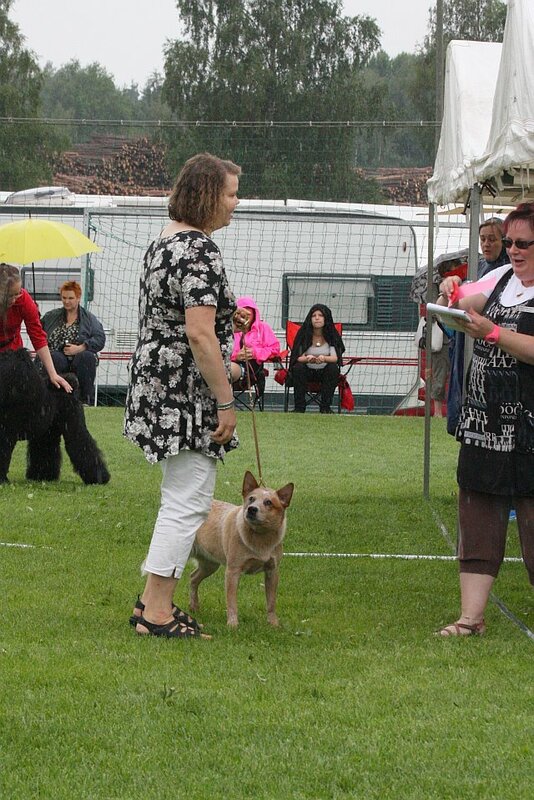 Judge for the day was Butkiene Jurate, Litauen. 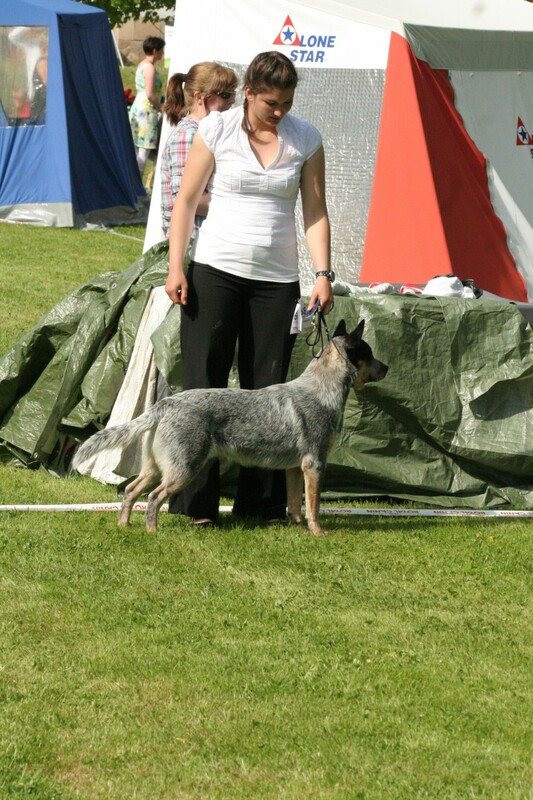 All got Excellent with CK, WM Another Dewil "Junior" became BOB with CAC and WM Absolutely Spot On "Rizla" became BOS with CAC. 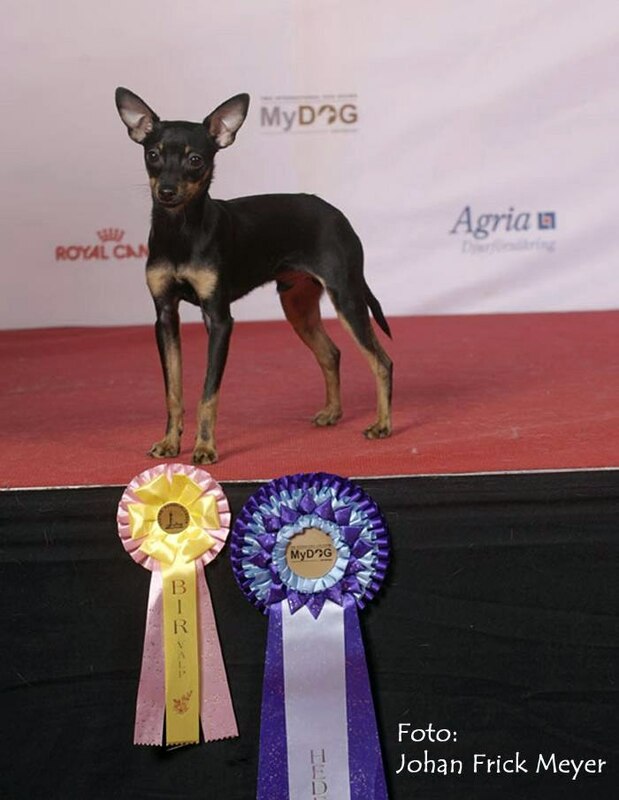 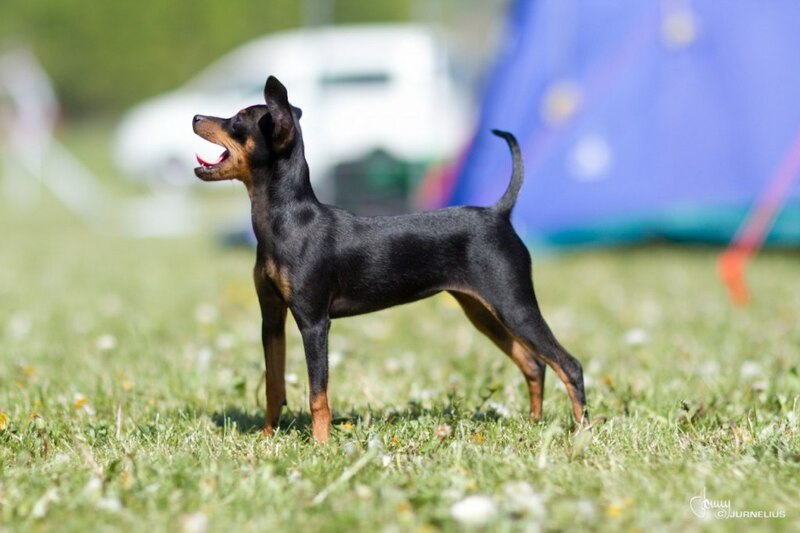 We also showed them in breeders group: All 4 dogs looks very similar, all have correct expression for the breed, excellent dark eyes, excellent ears, sound bones, correct toplines, enough strong chest and forechest, good movers. 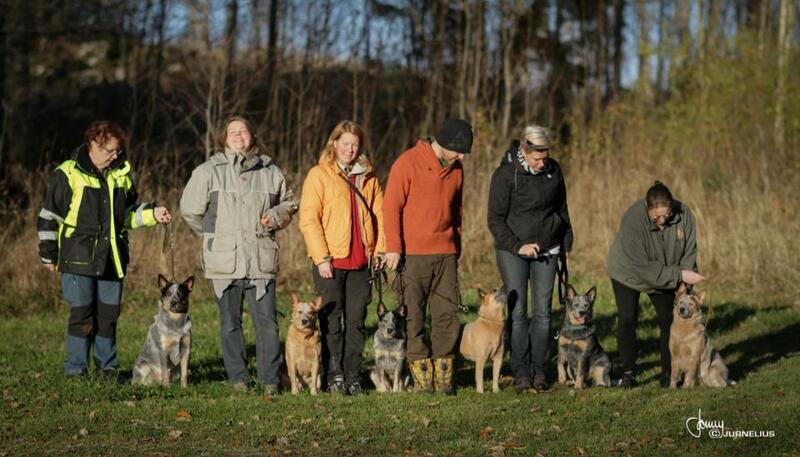 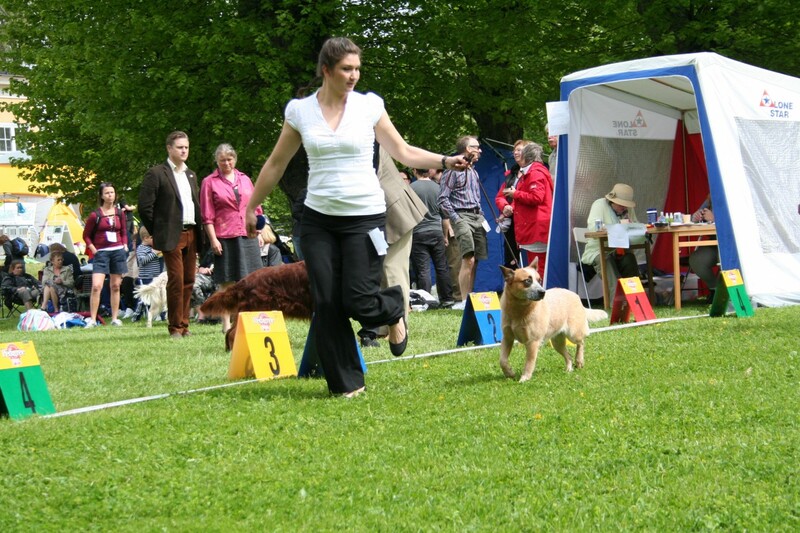 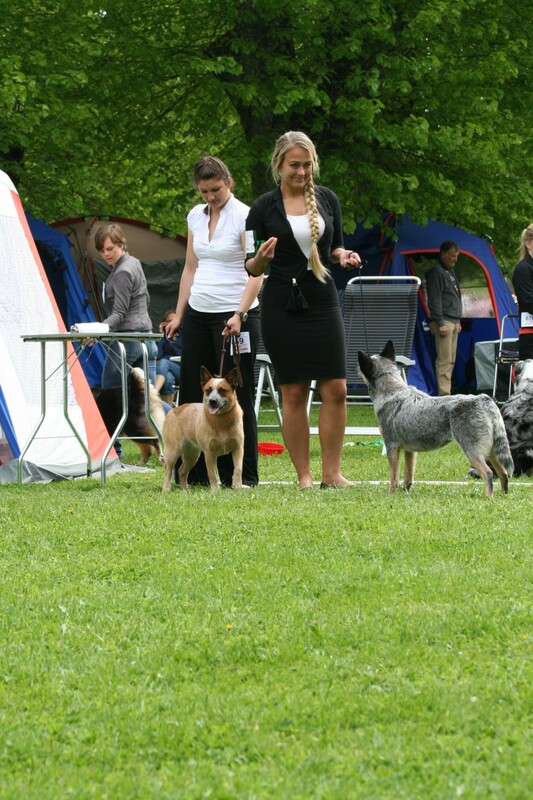 Junior and I in the group among the 6 dogs that where shortlisted. 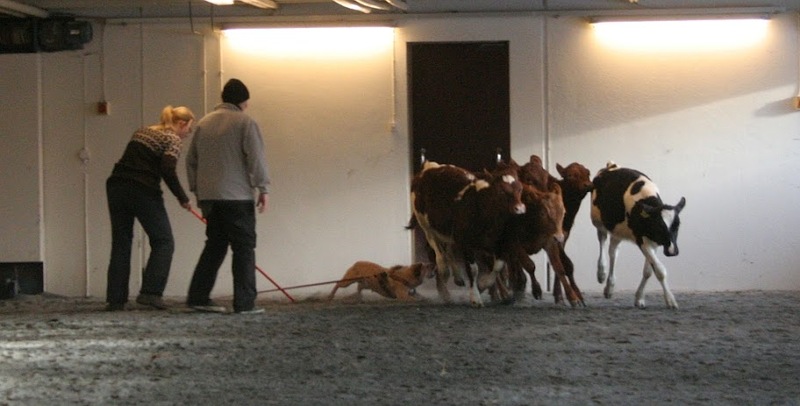 Sunday morning we left for Vallentuna INT. 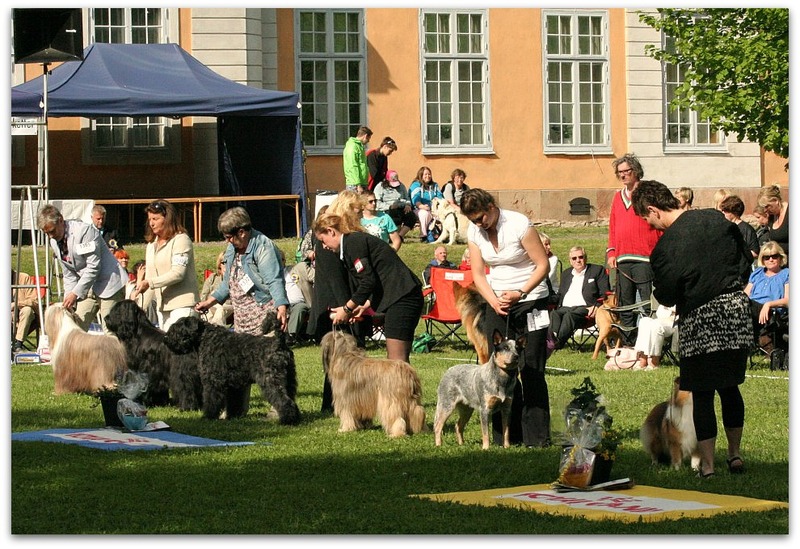 in stockholm. 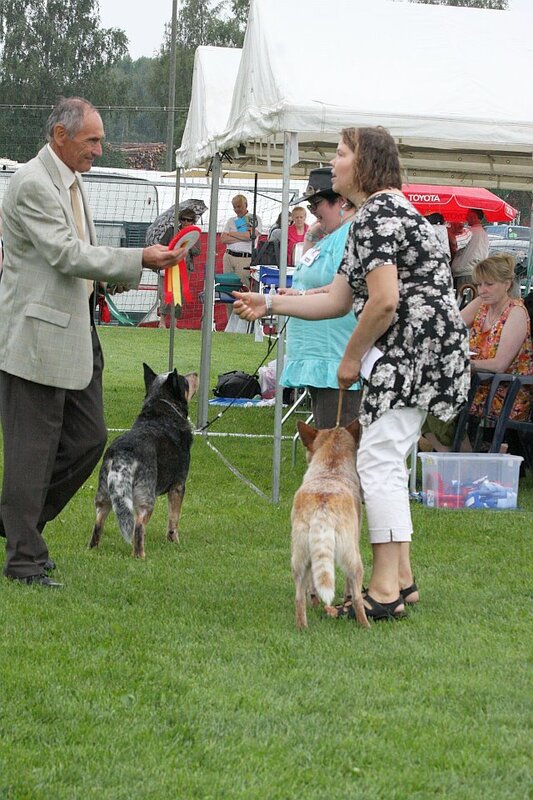 Judge for the day was Strachan David, Australia. 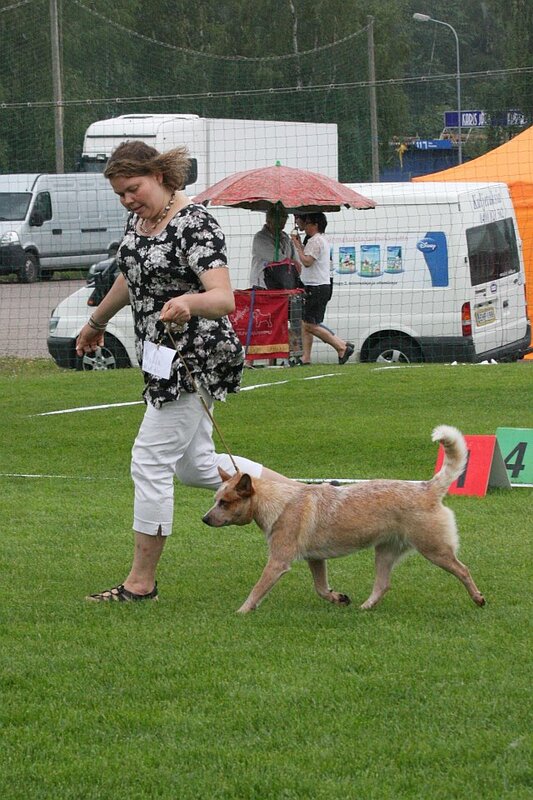 All got excellent with CK exept for WM Ants in the Pants "Myran" that got VG but with a very nice critic, she has a slightly reversed scissor bite. 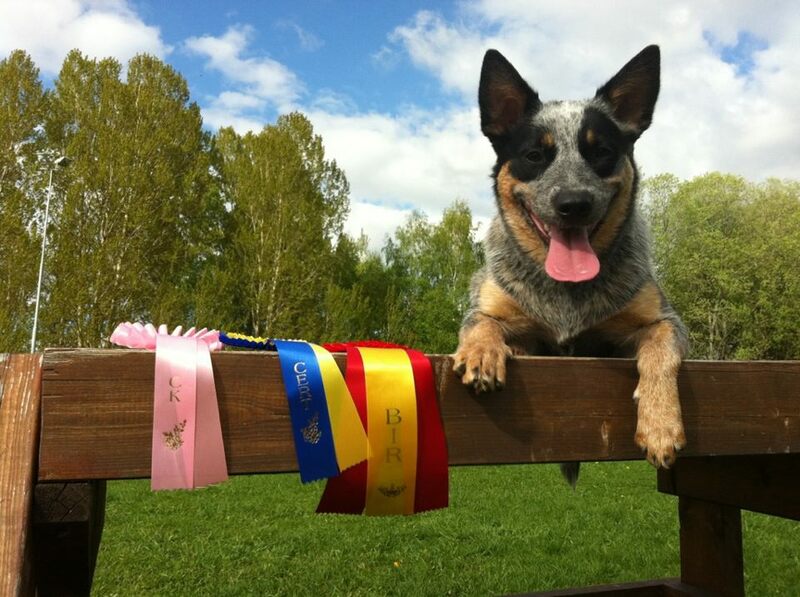 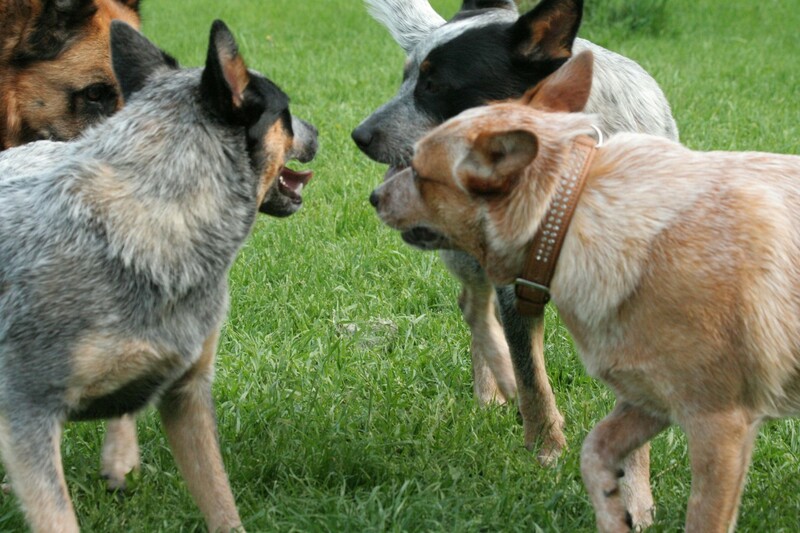 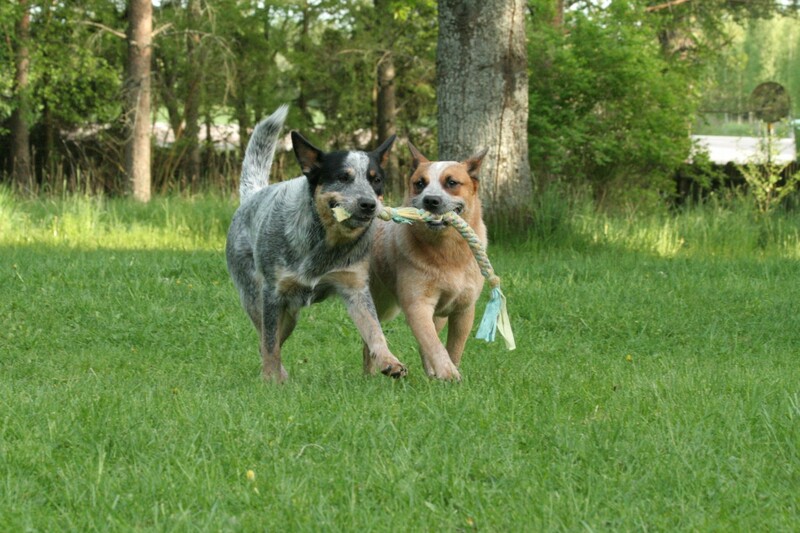 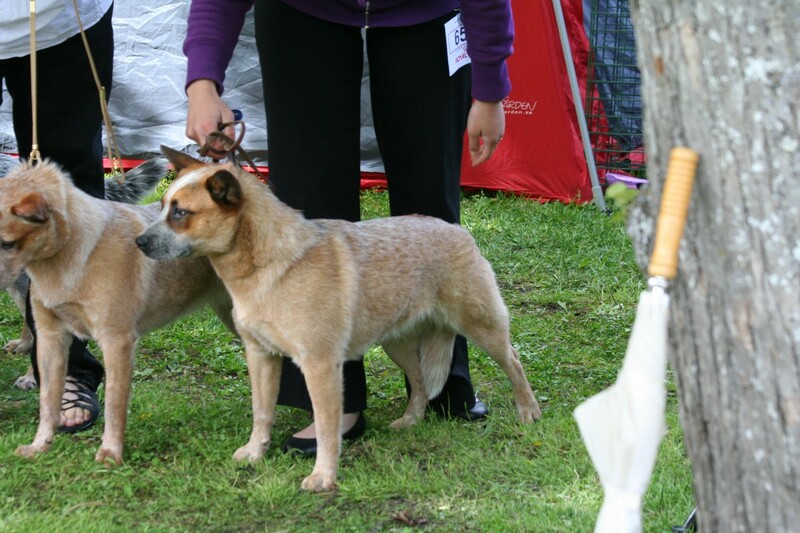 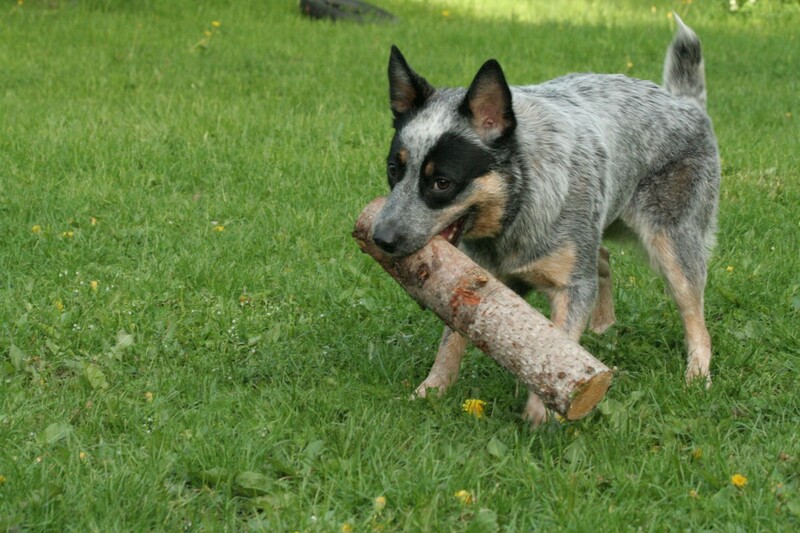 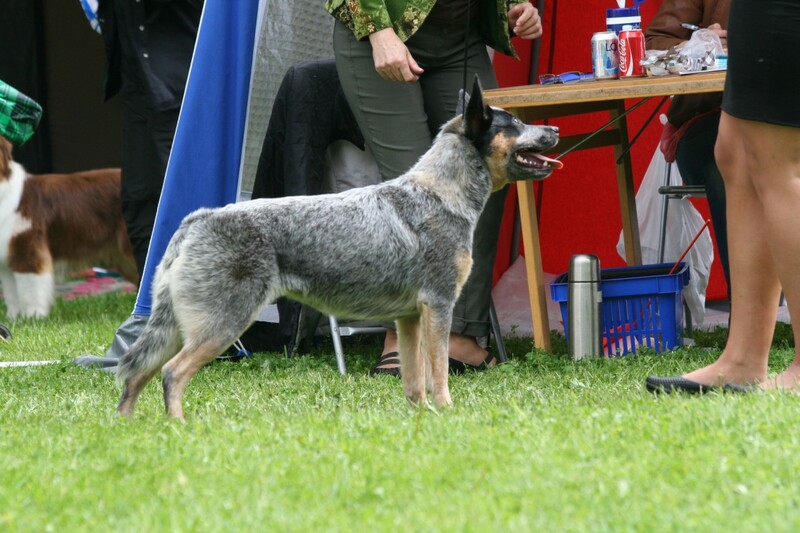 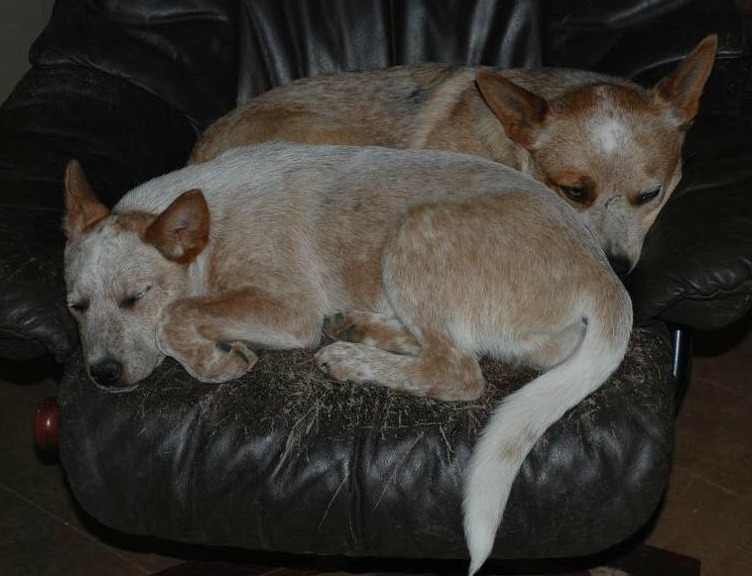 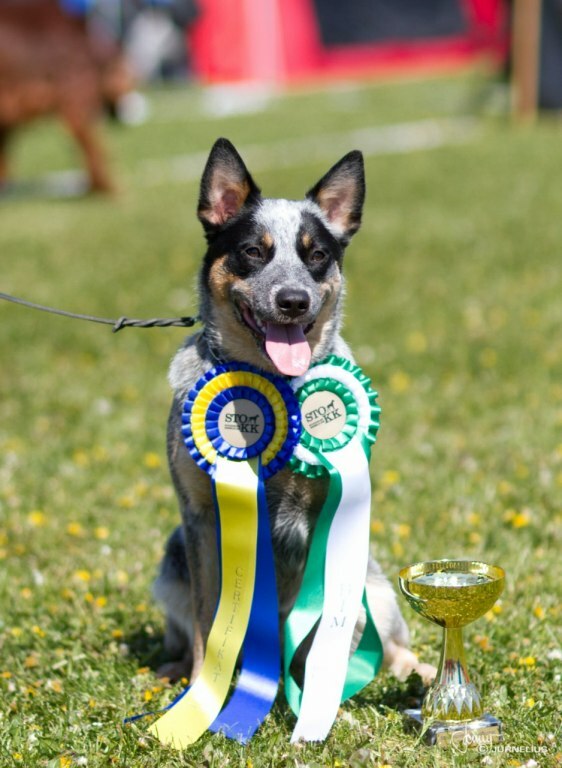 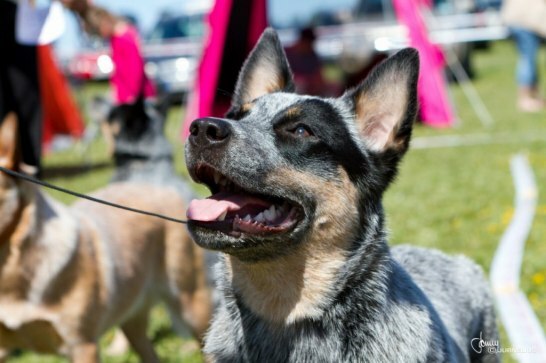 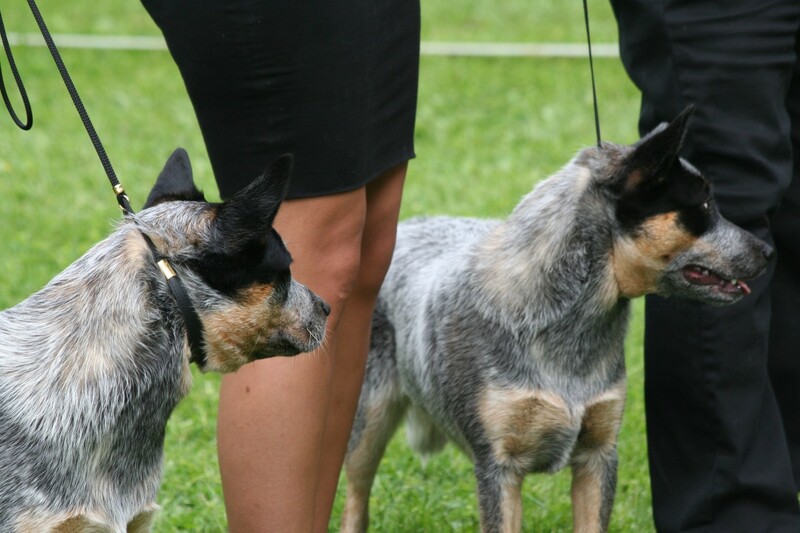 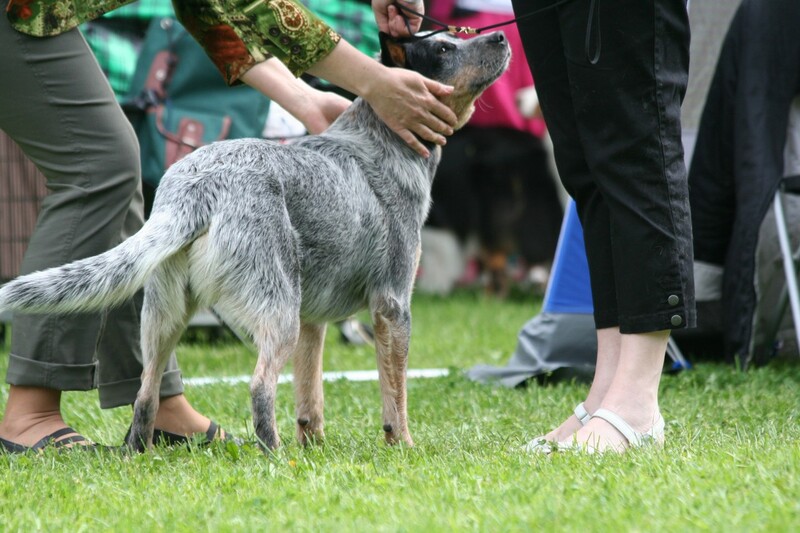 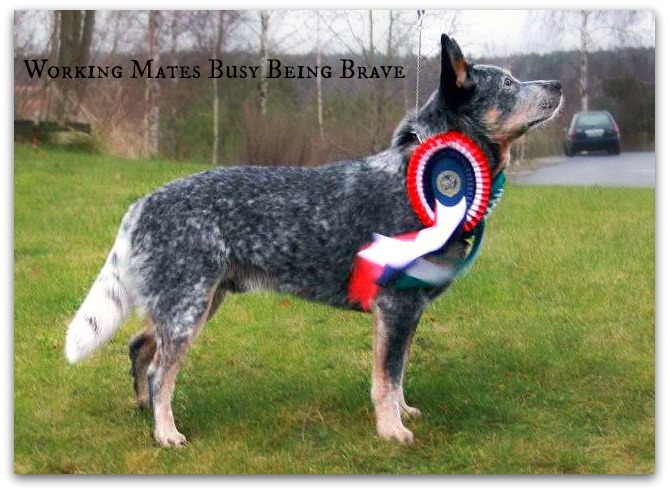 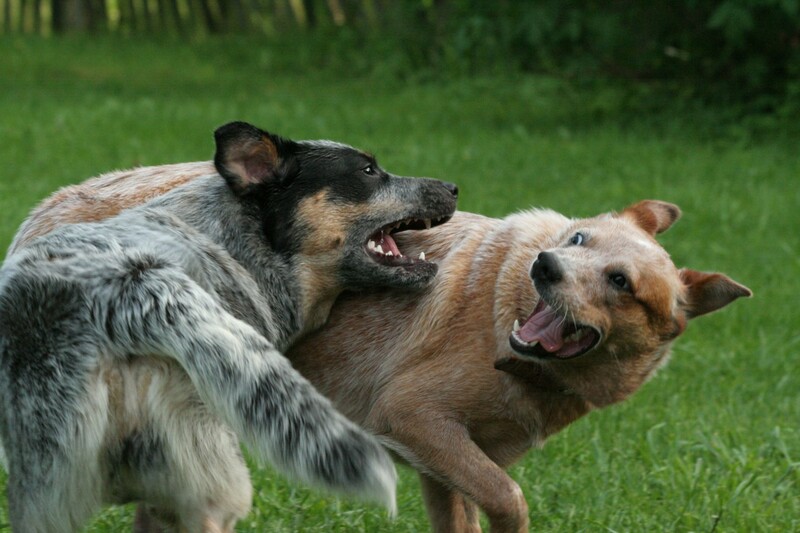 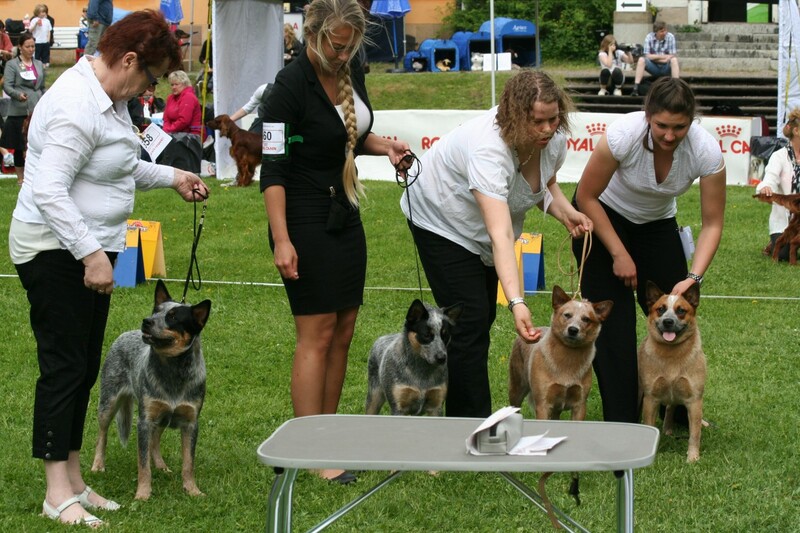 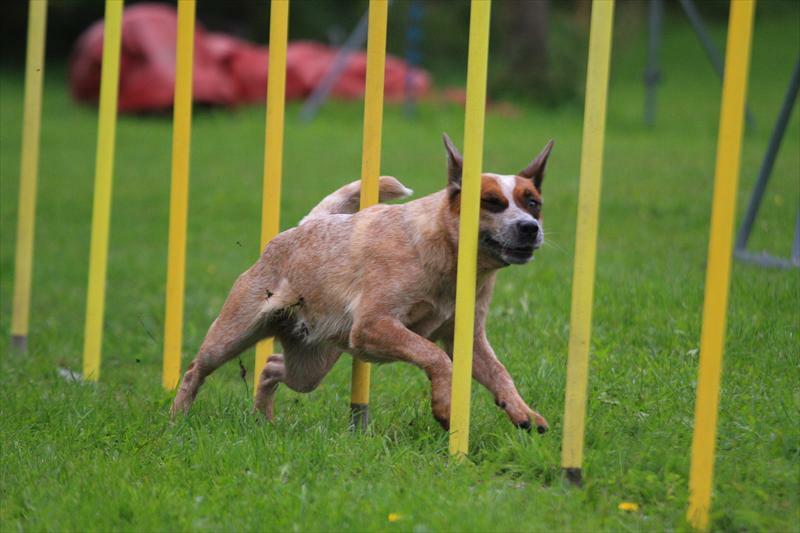 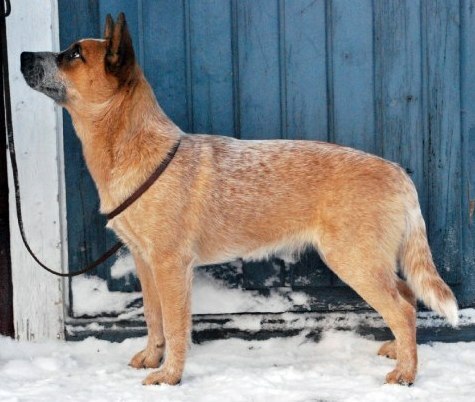 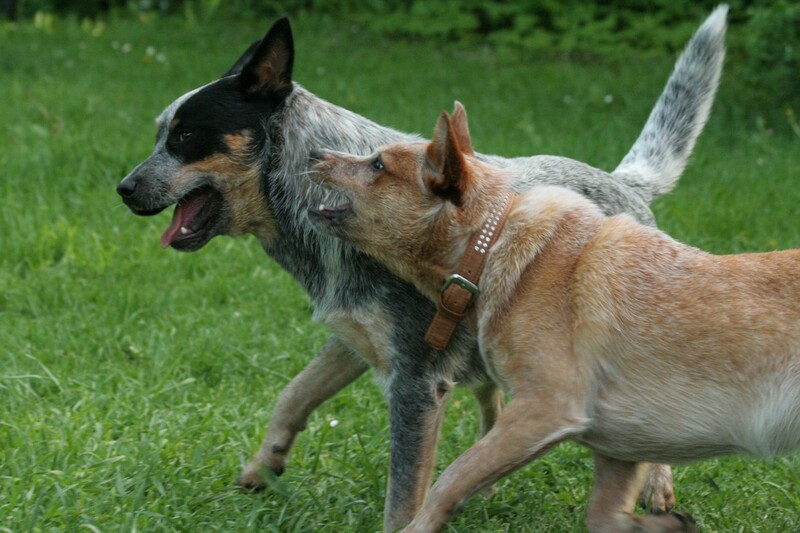 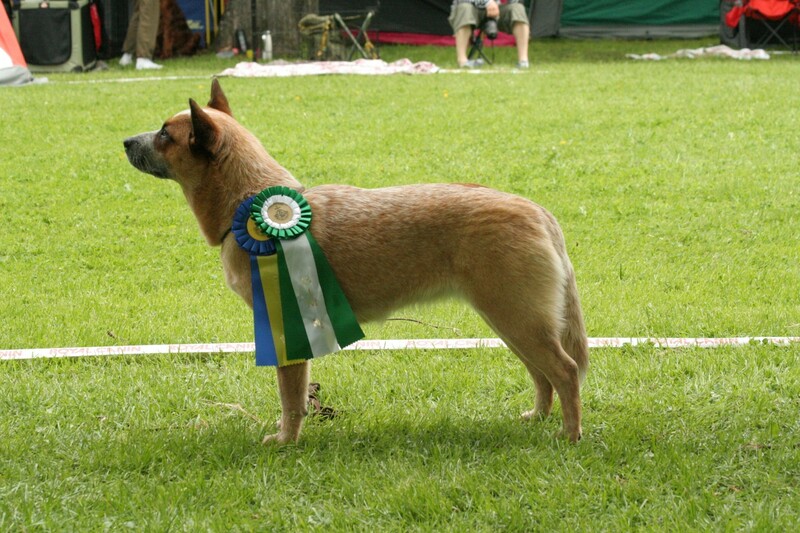 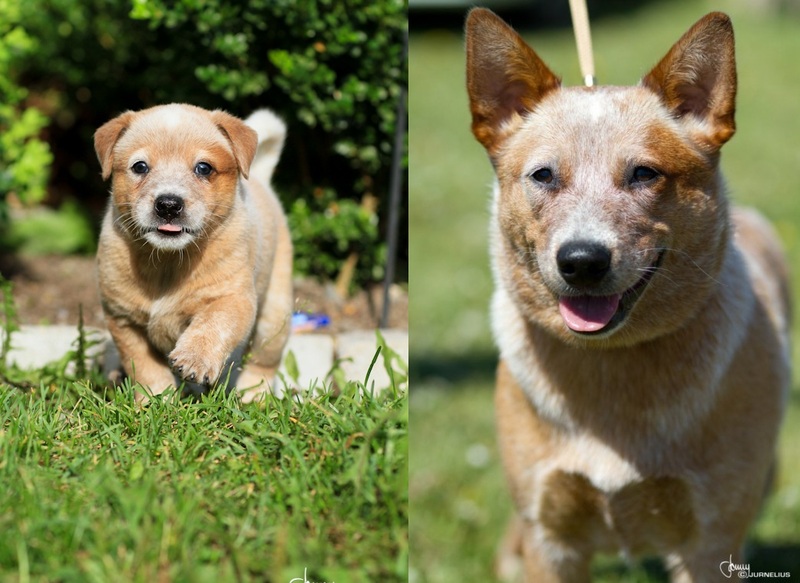 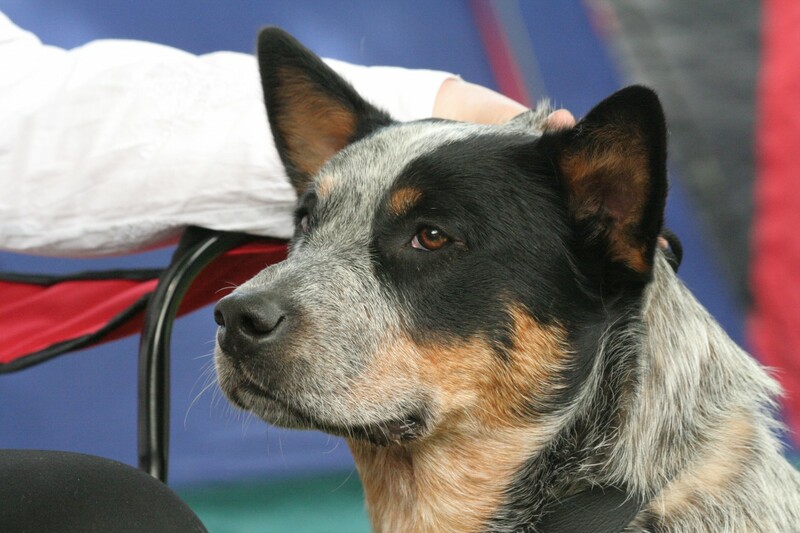 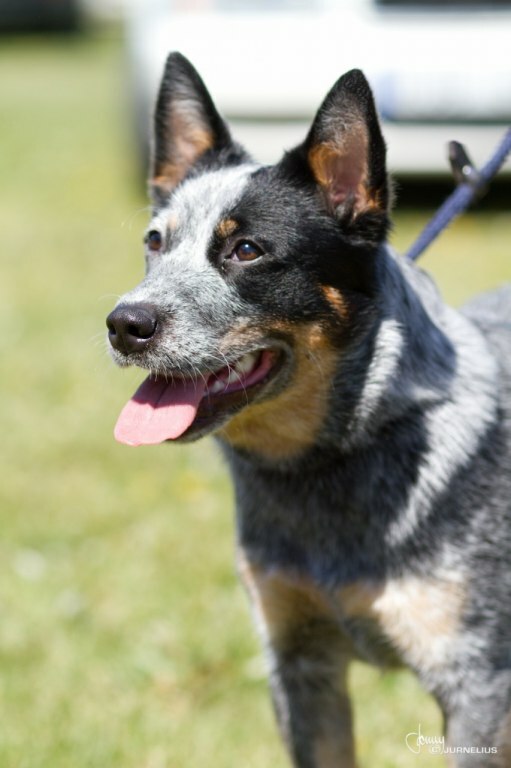 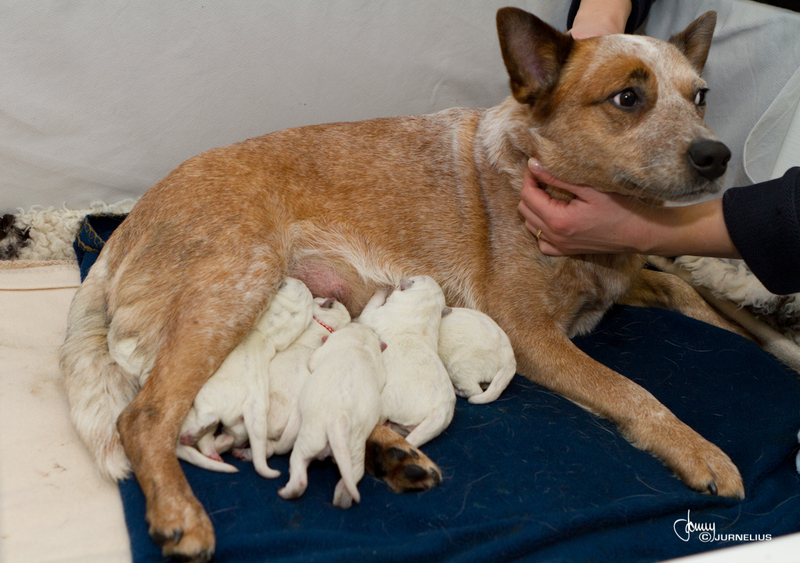 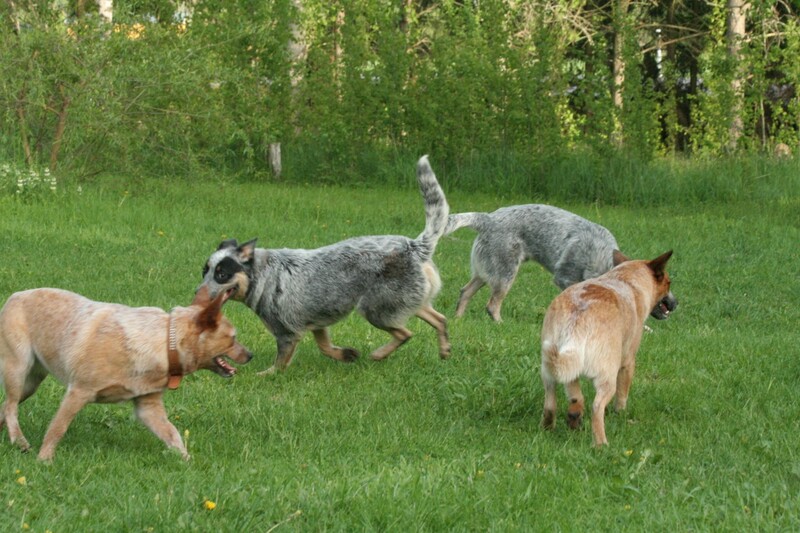 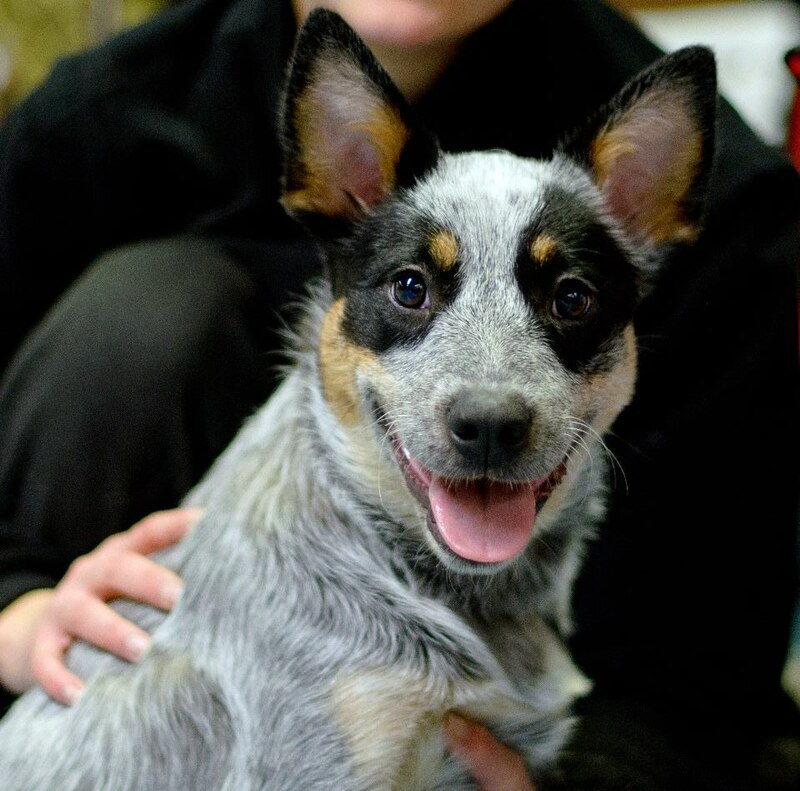 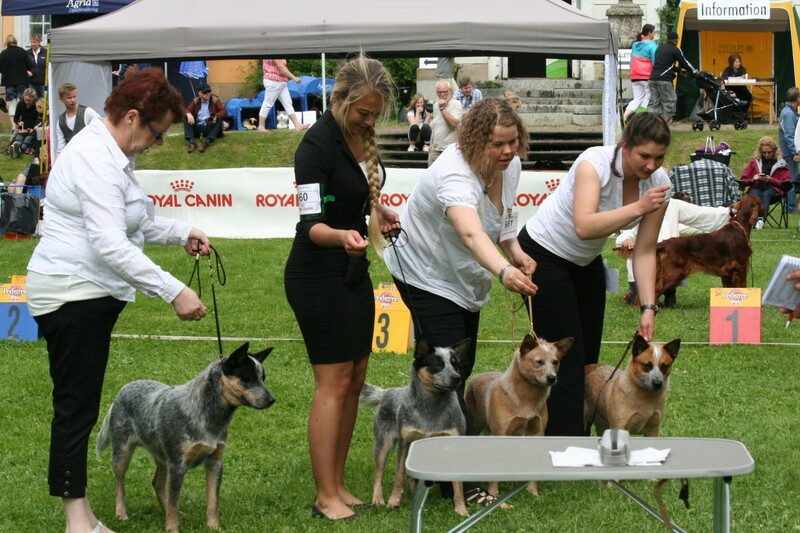 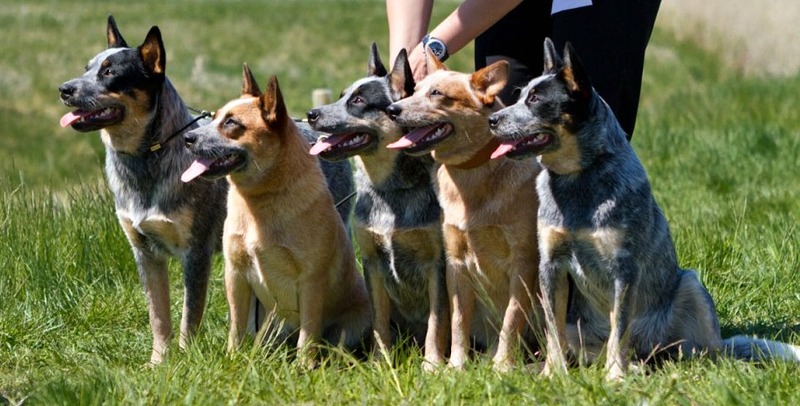 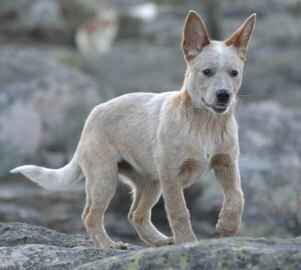 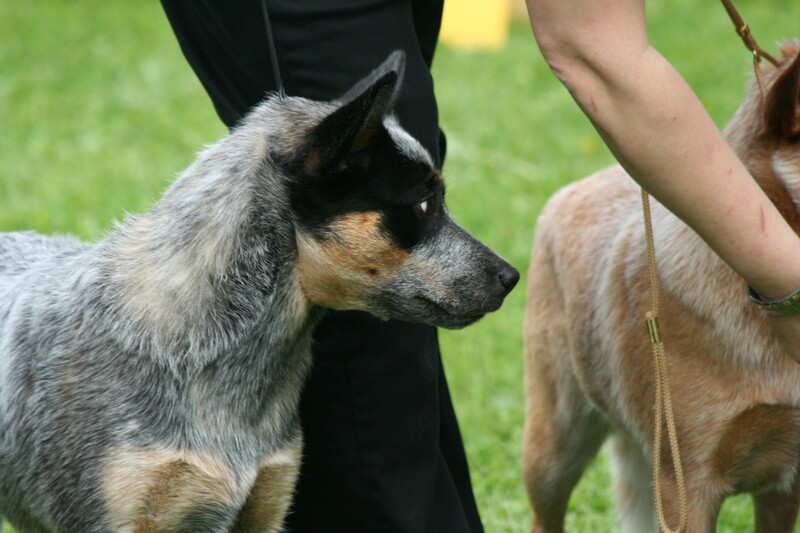 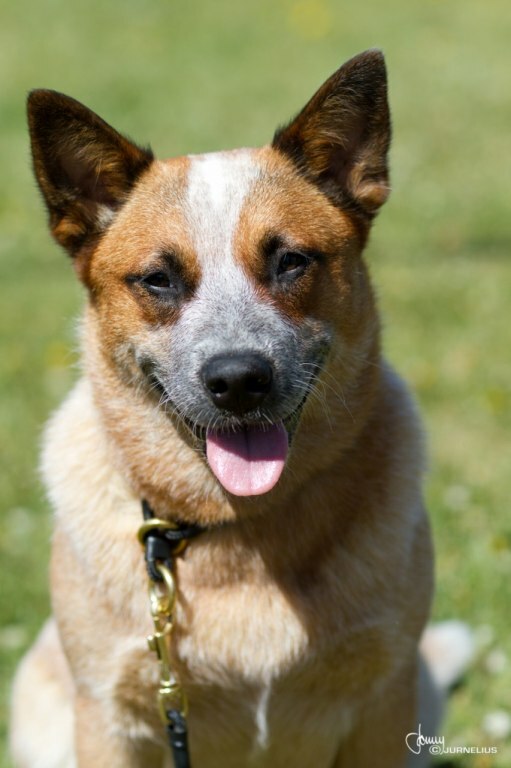 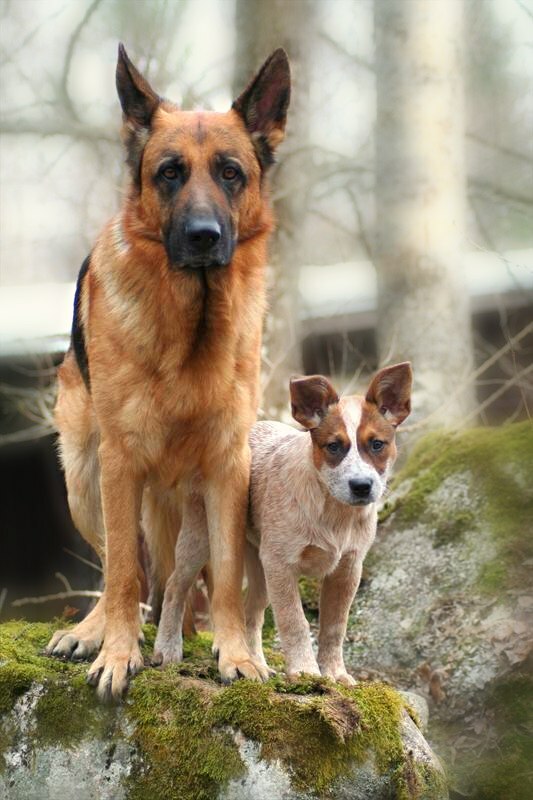 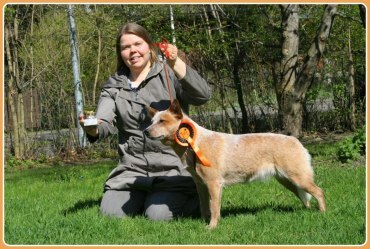 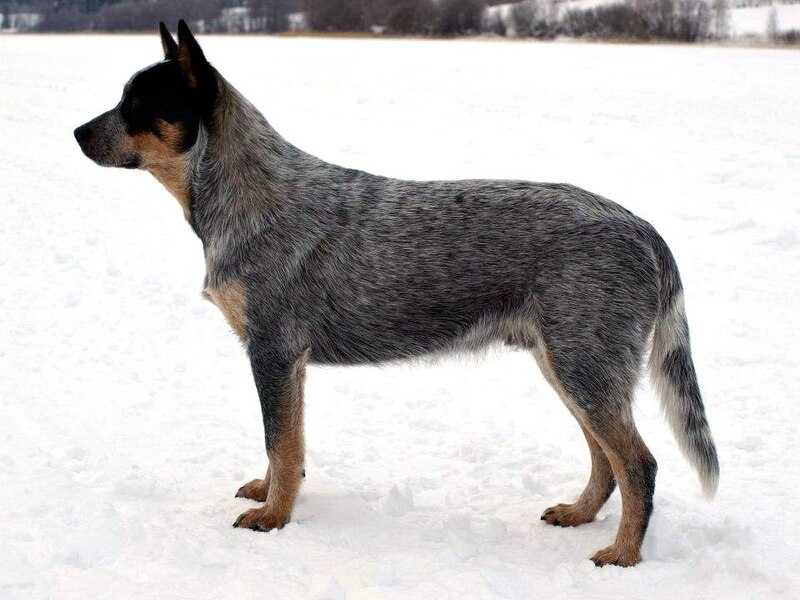 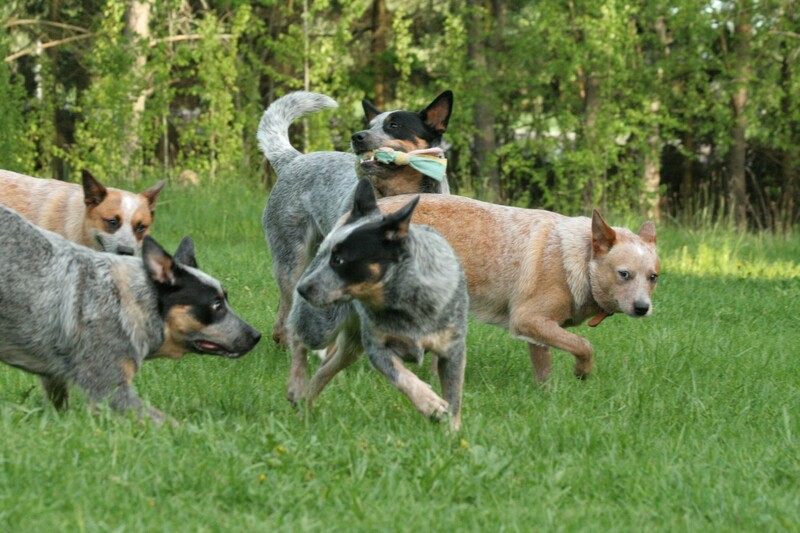 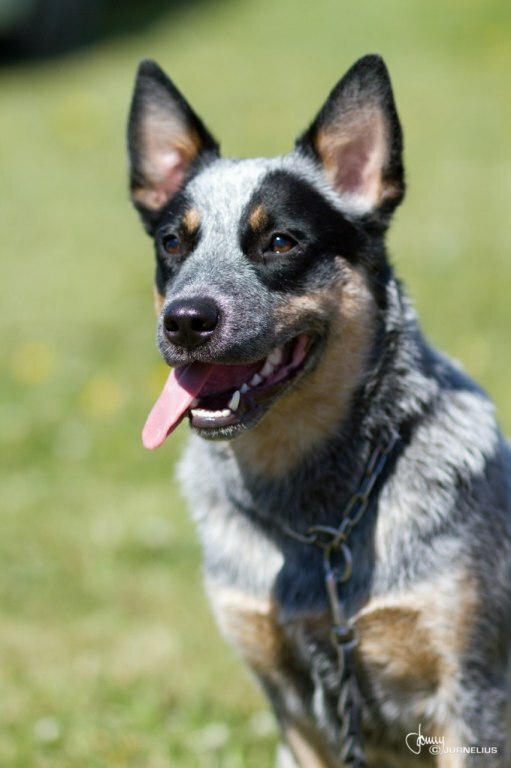 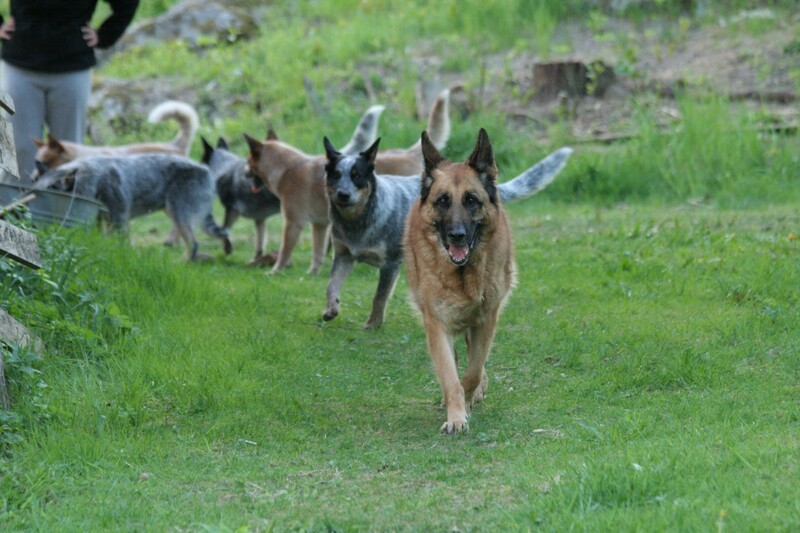 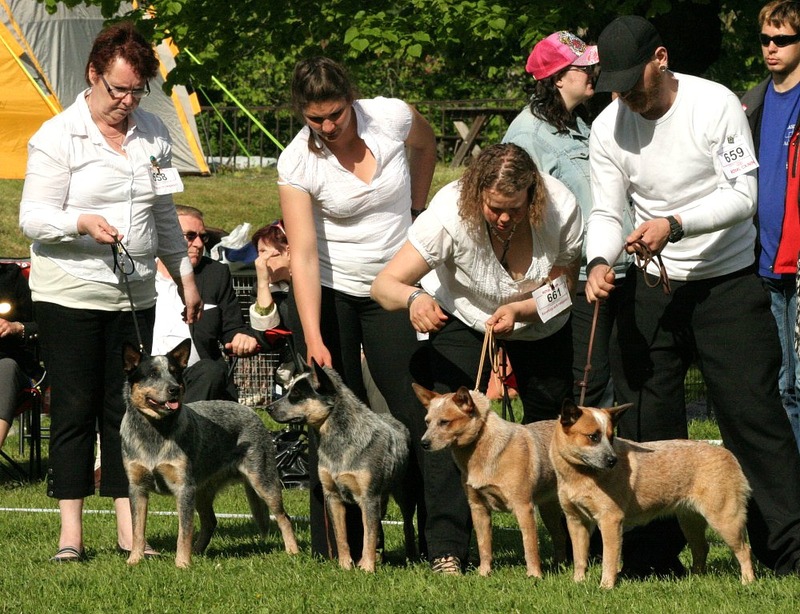 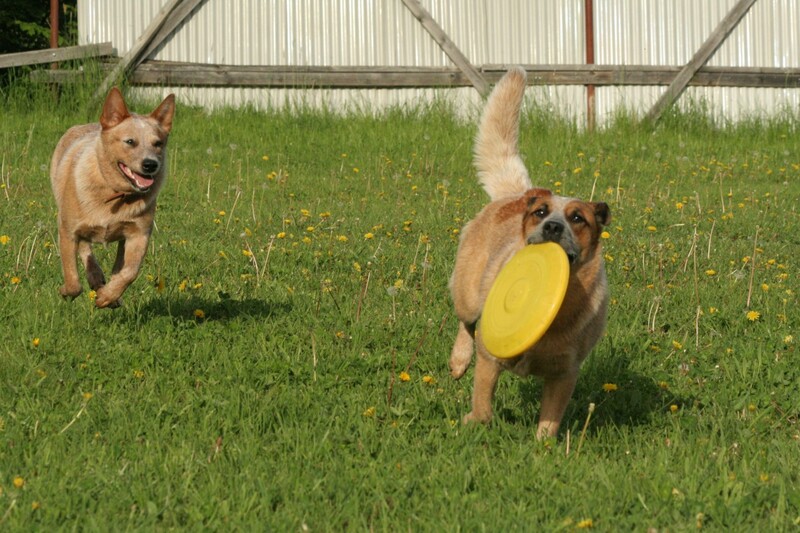 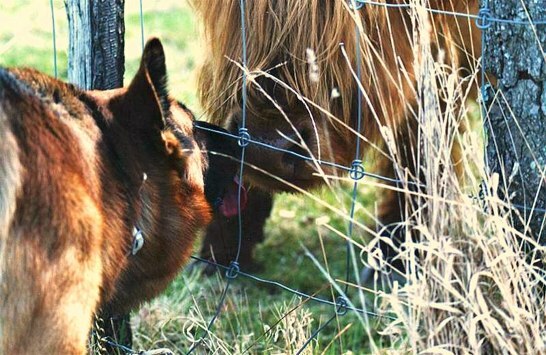 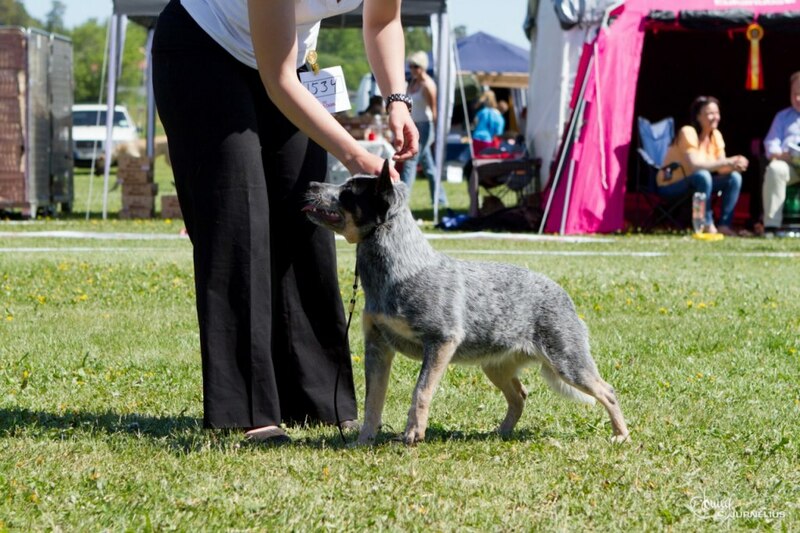 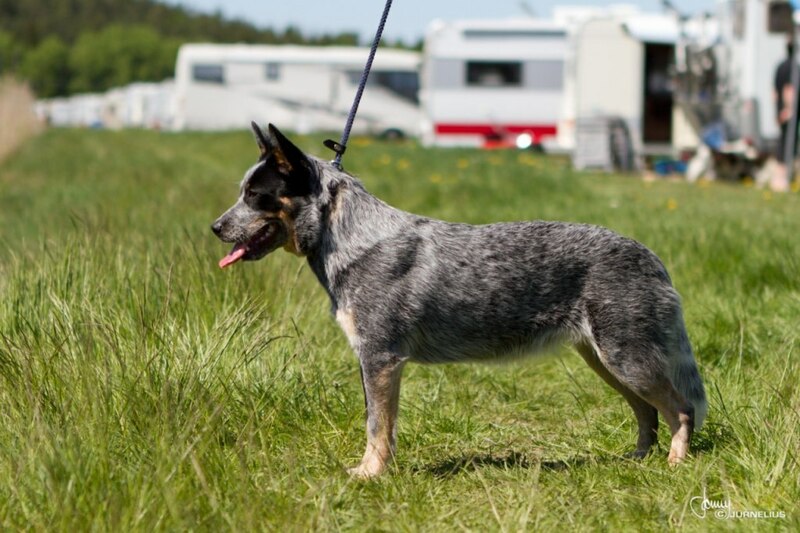 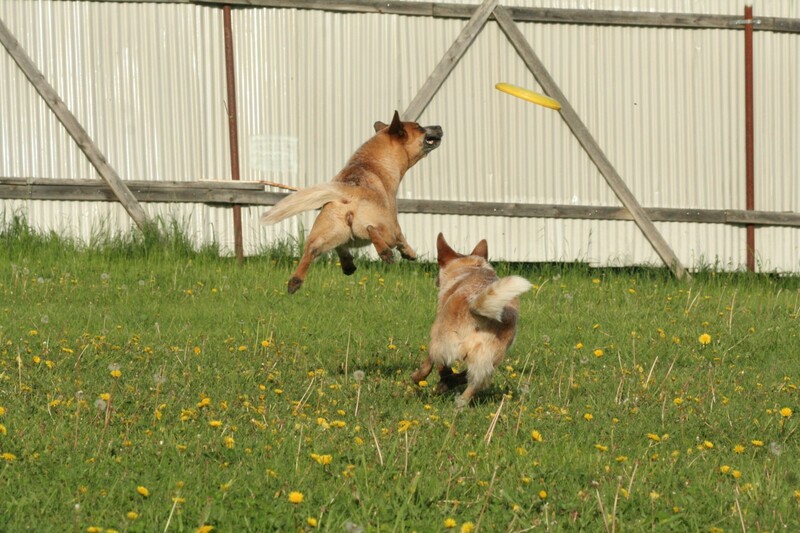 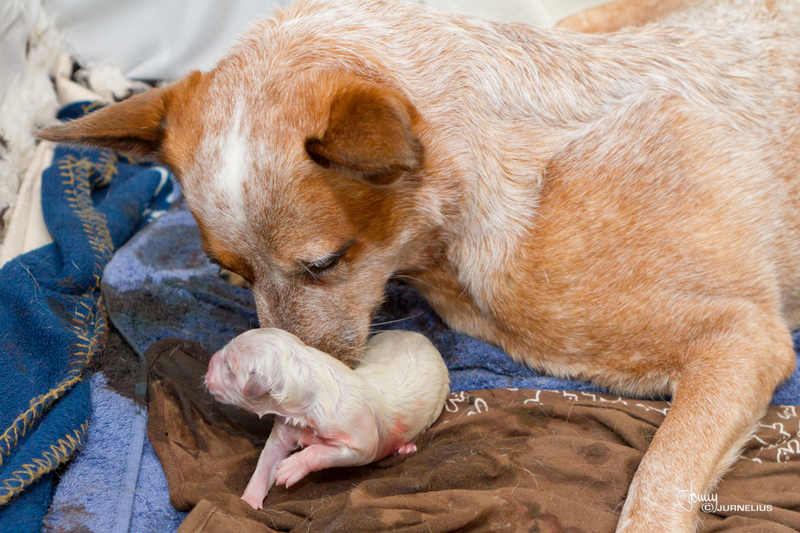 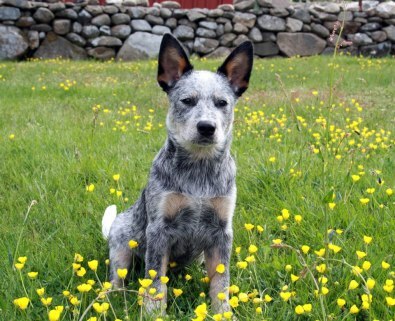 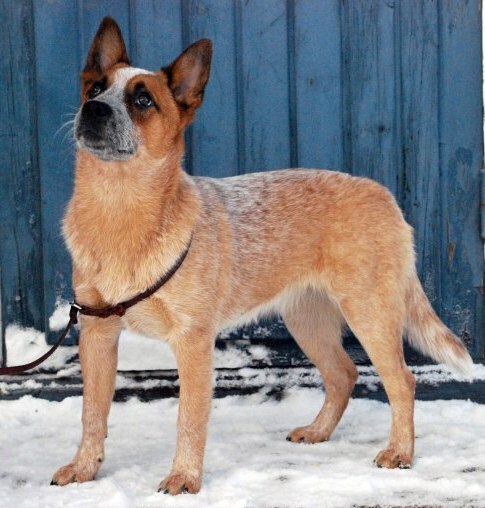 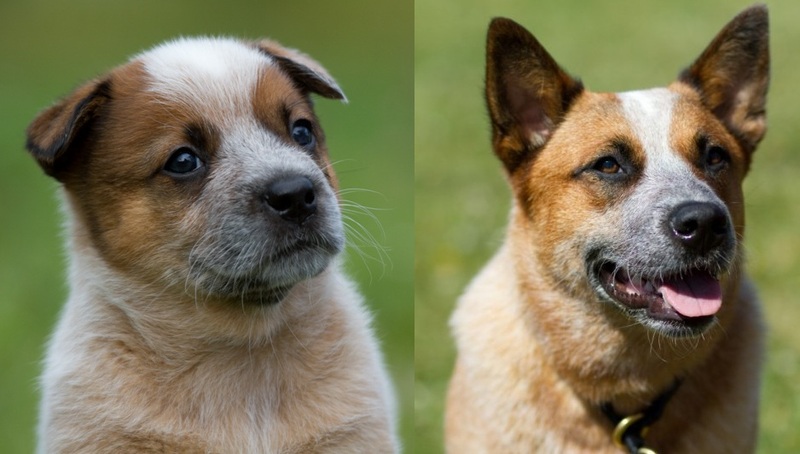 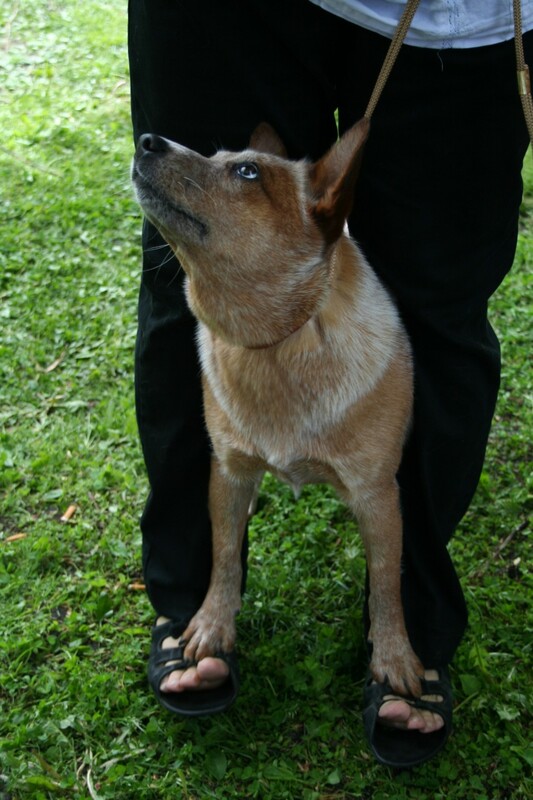 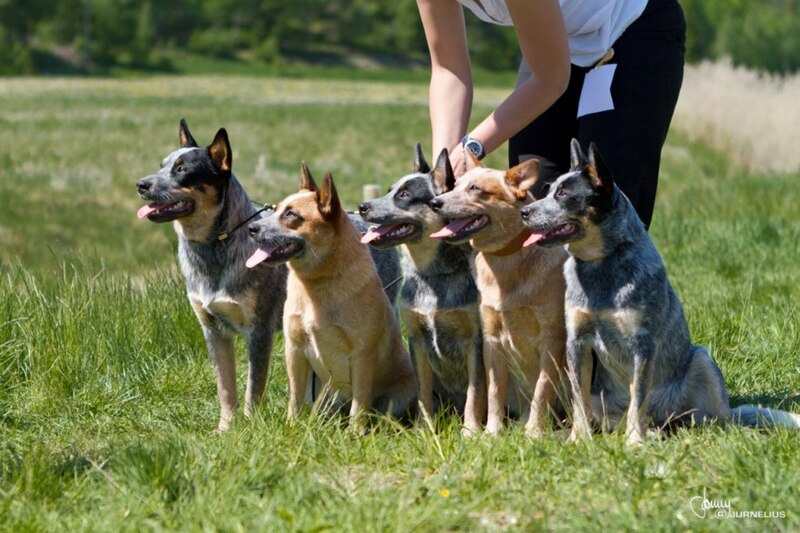 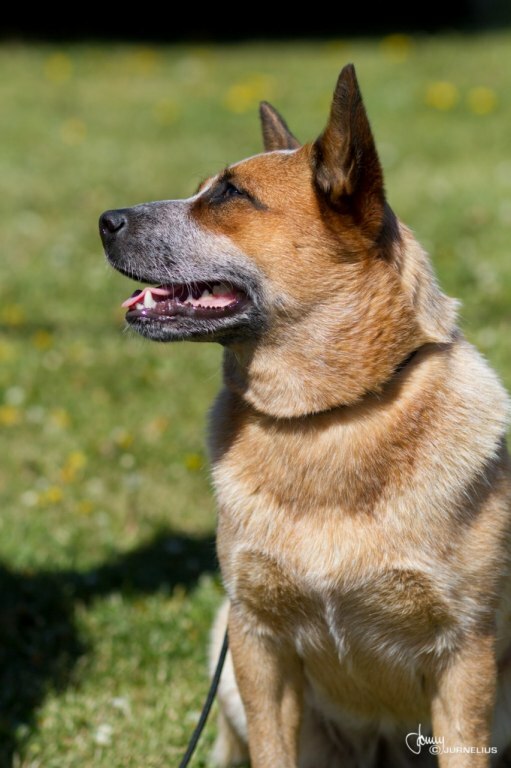 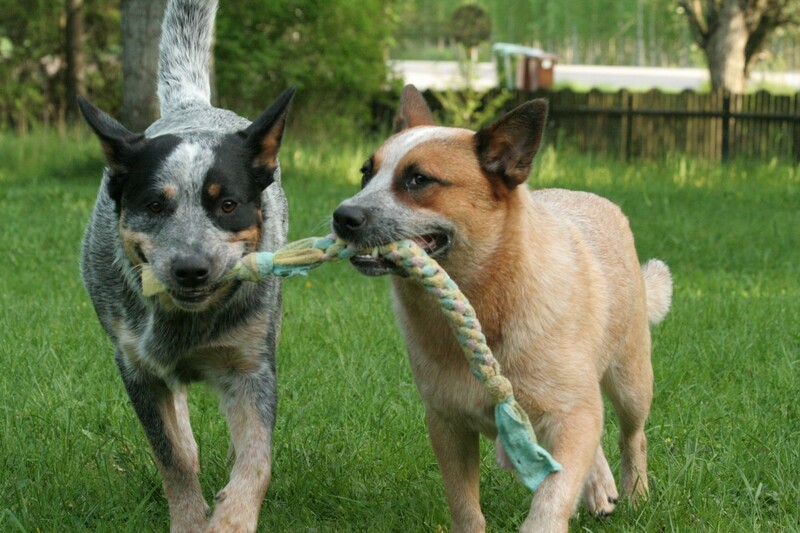 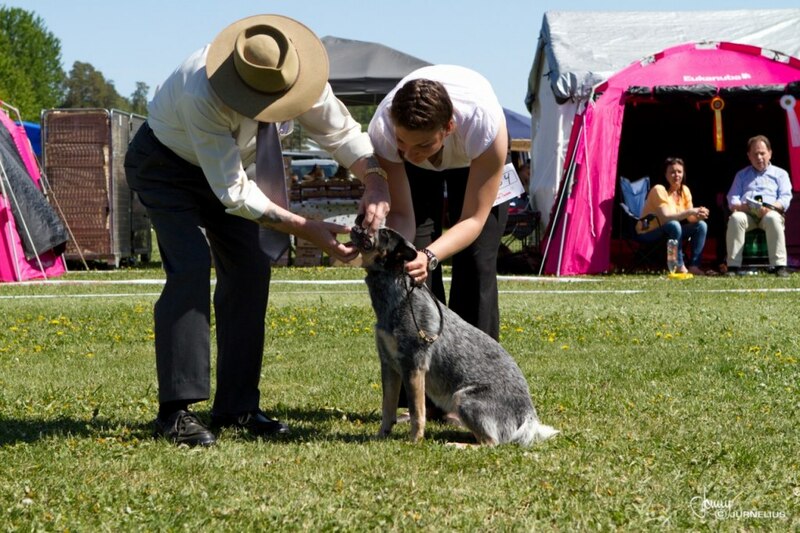 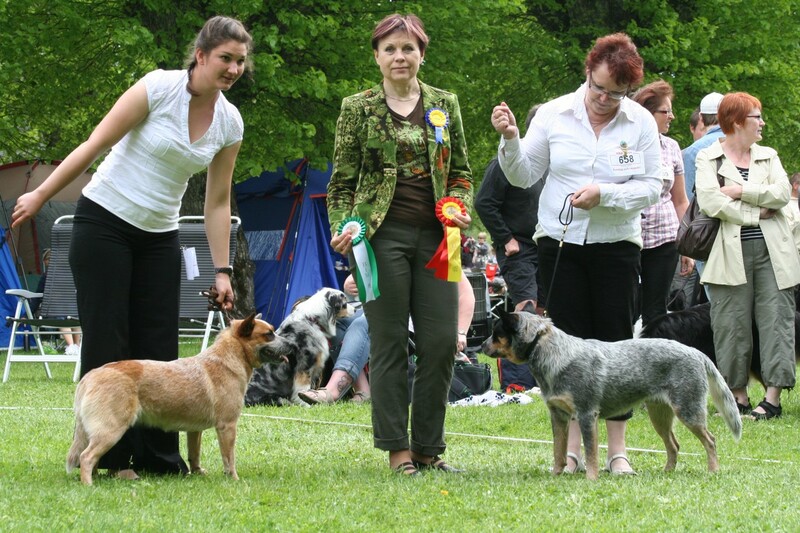 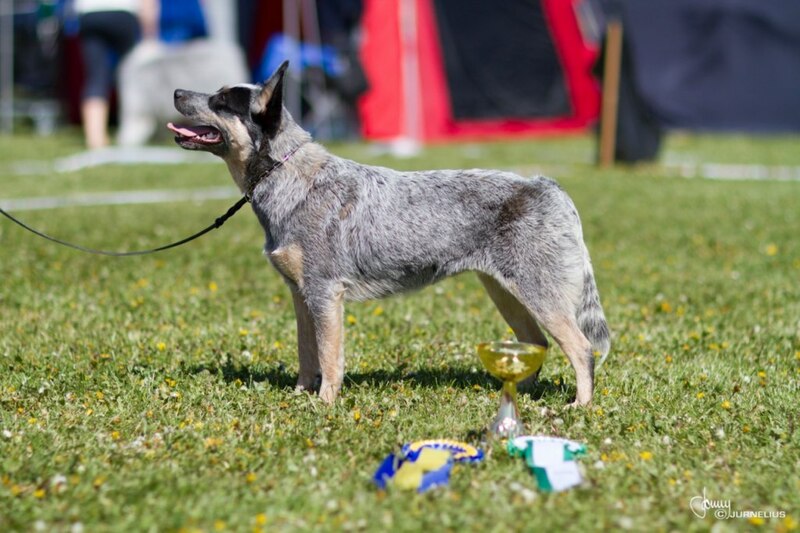 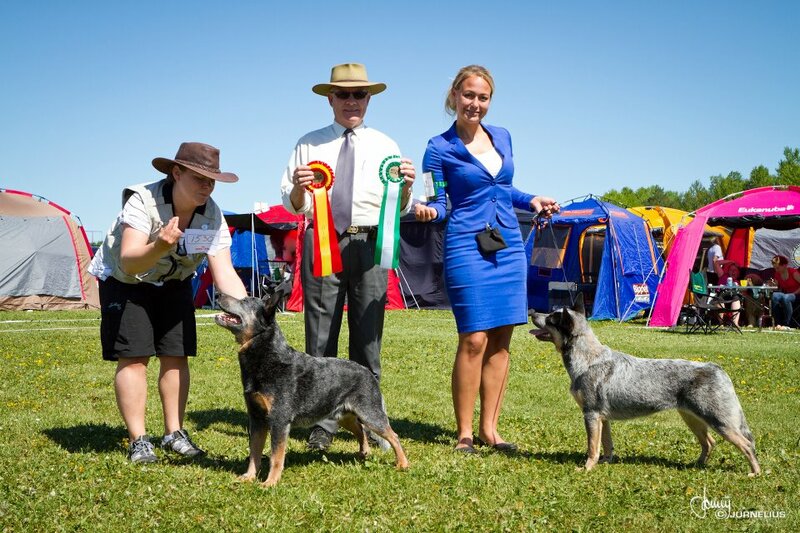 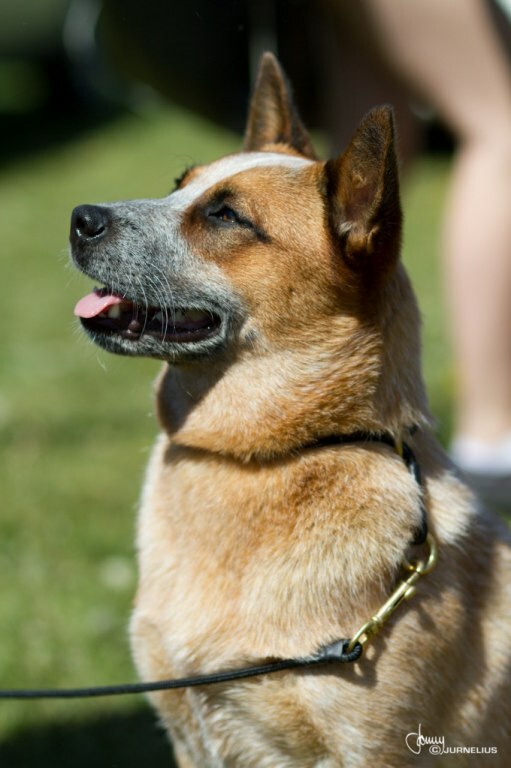 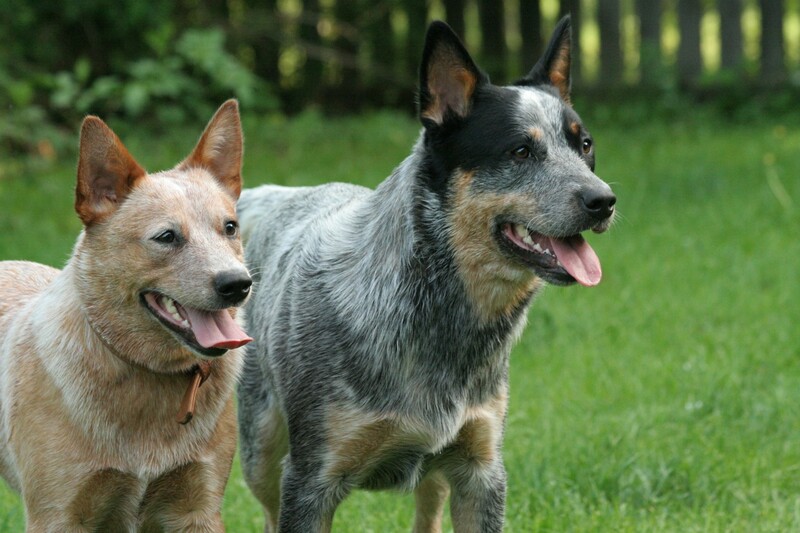 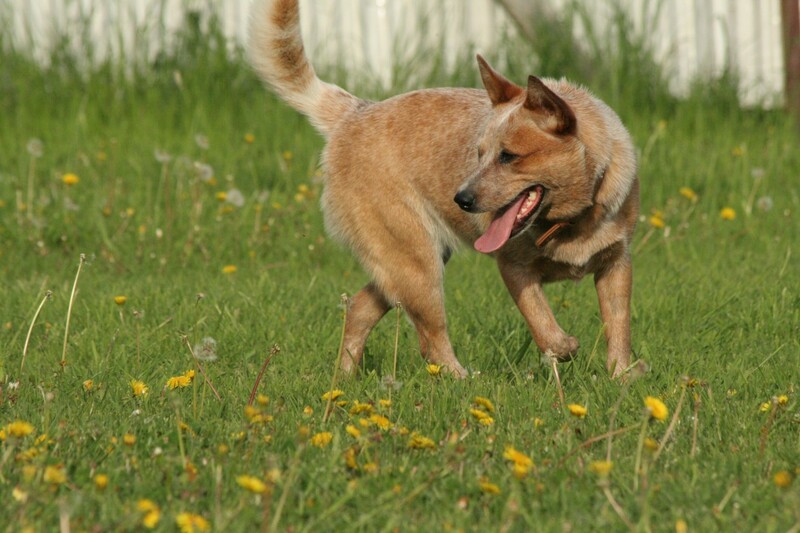 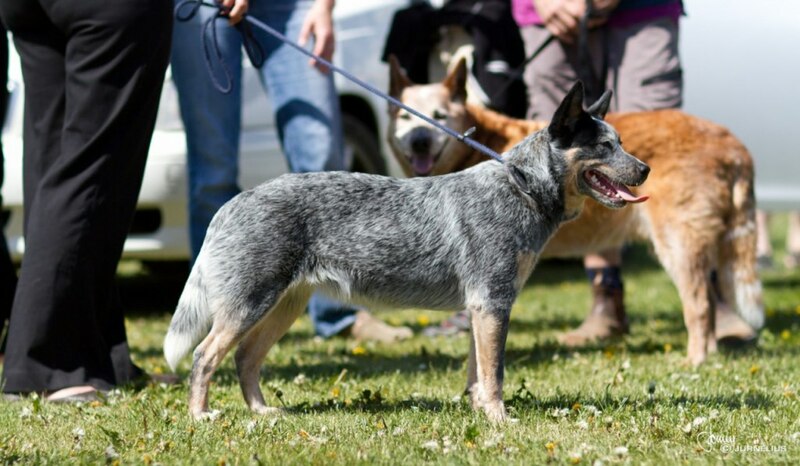 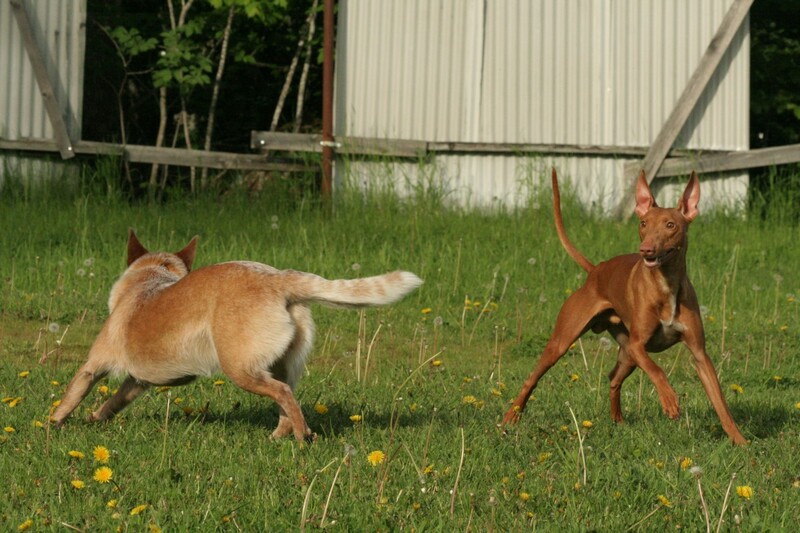 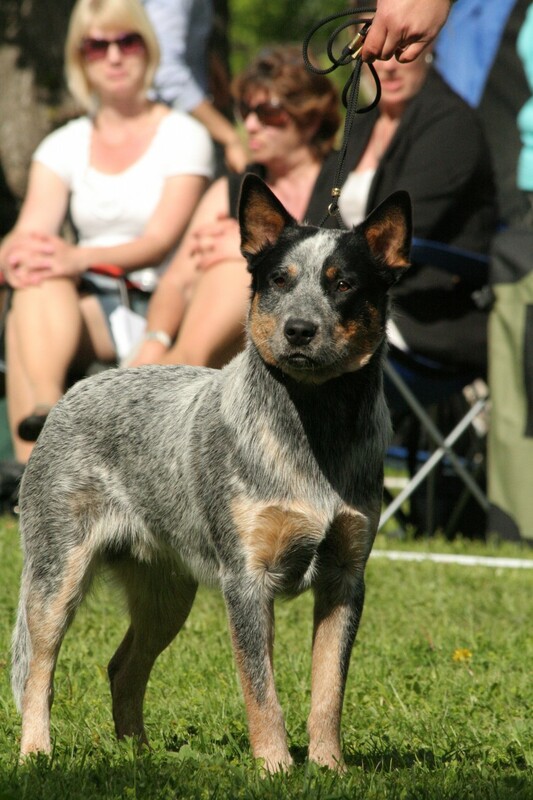 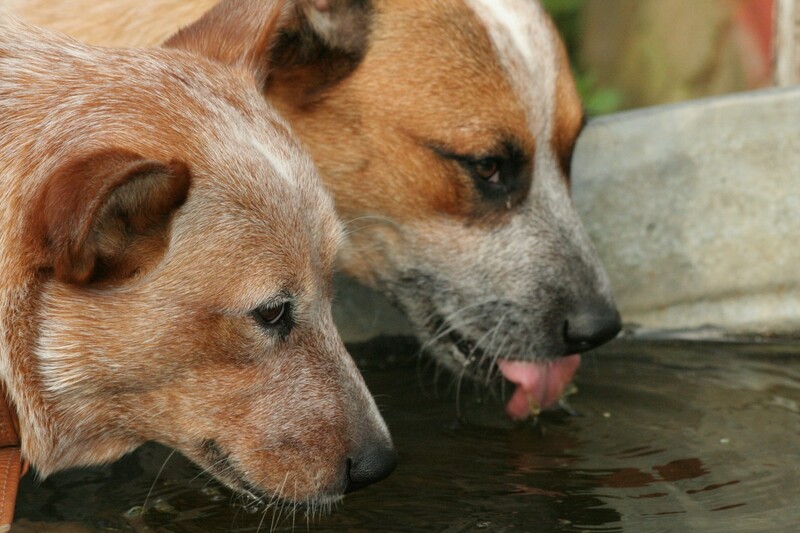 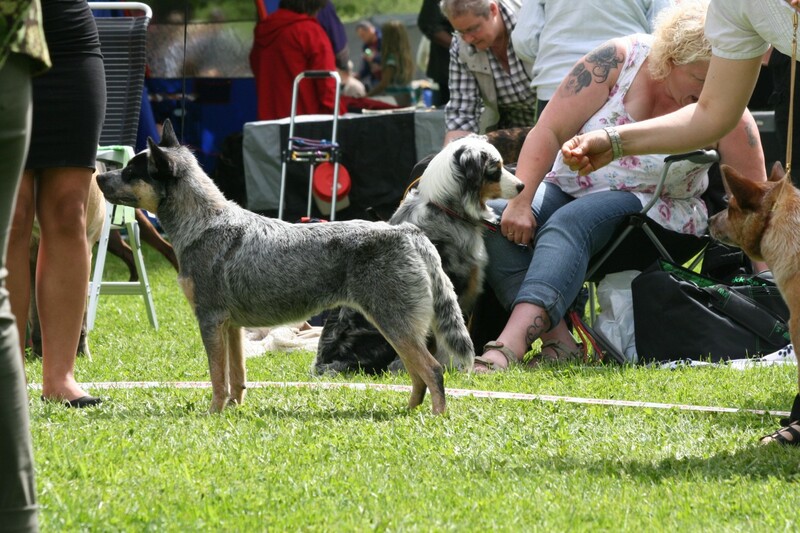 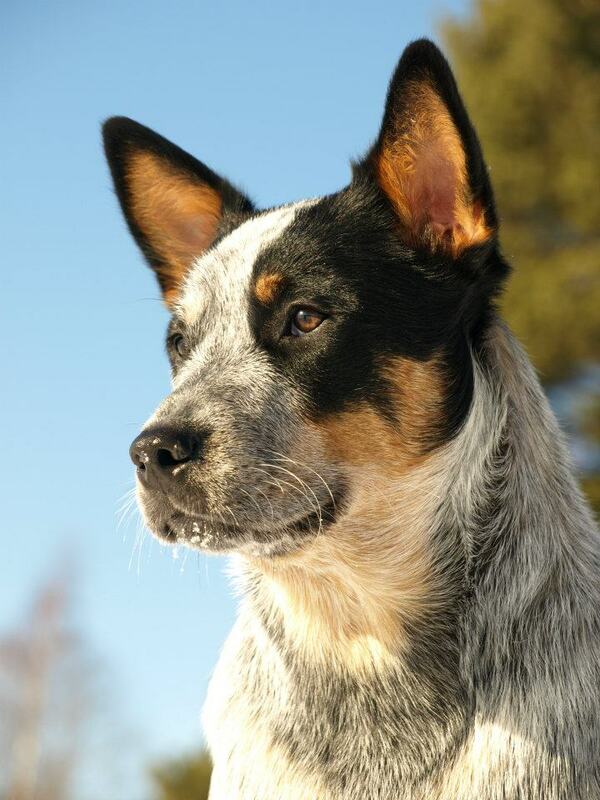 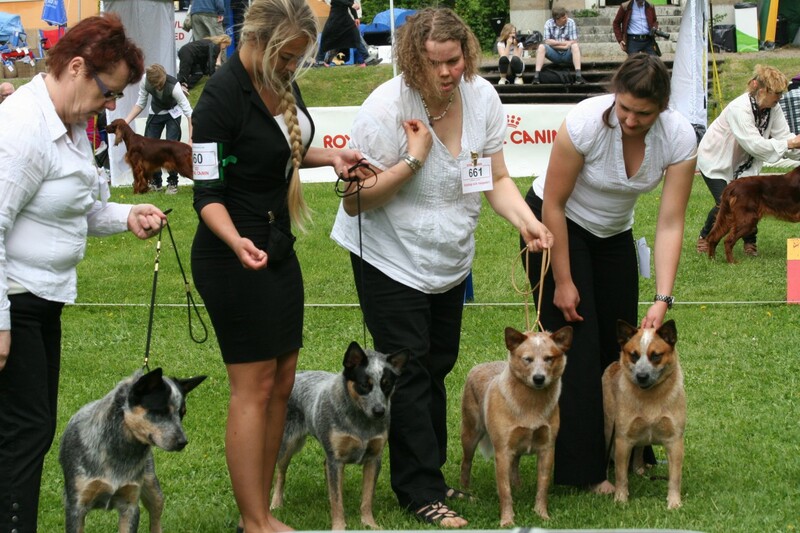 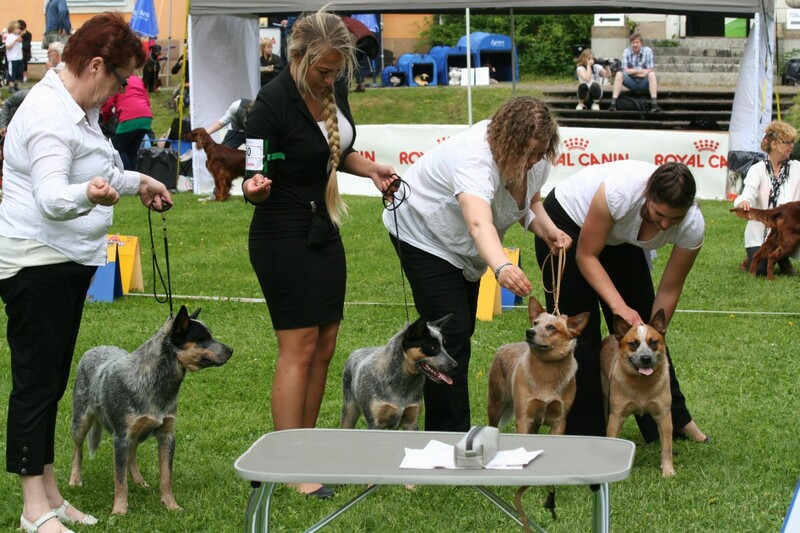 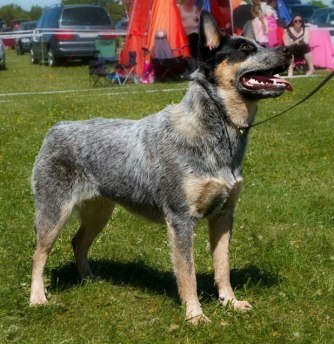 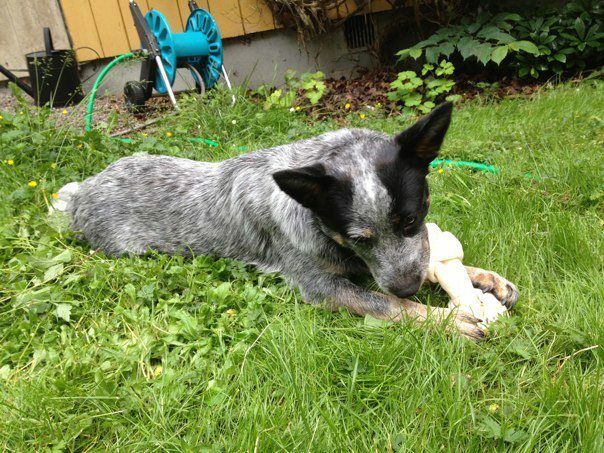 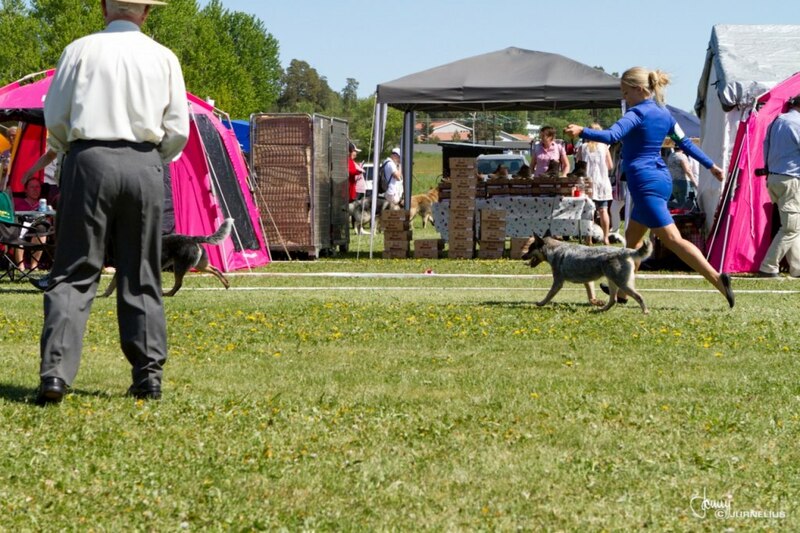 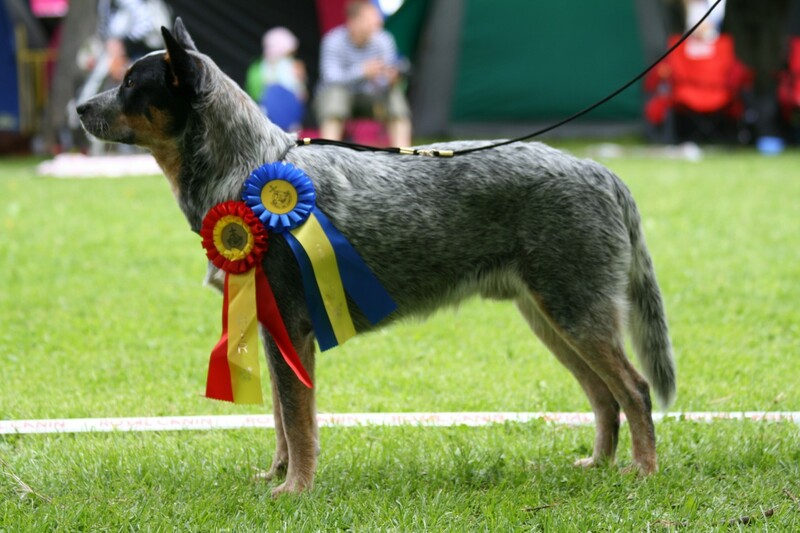 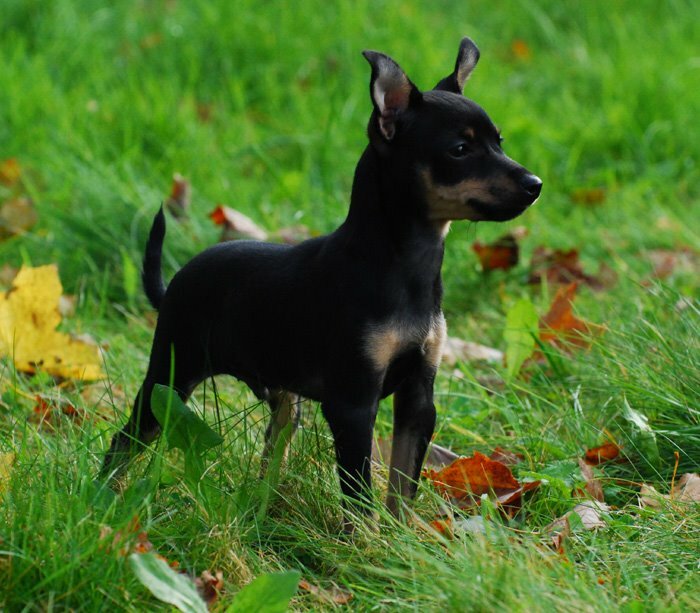 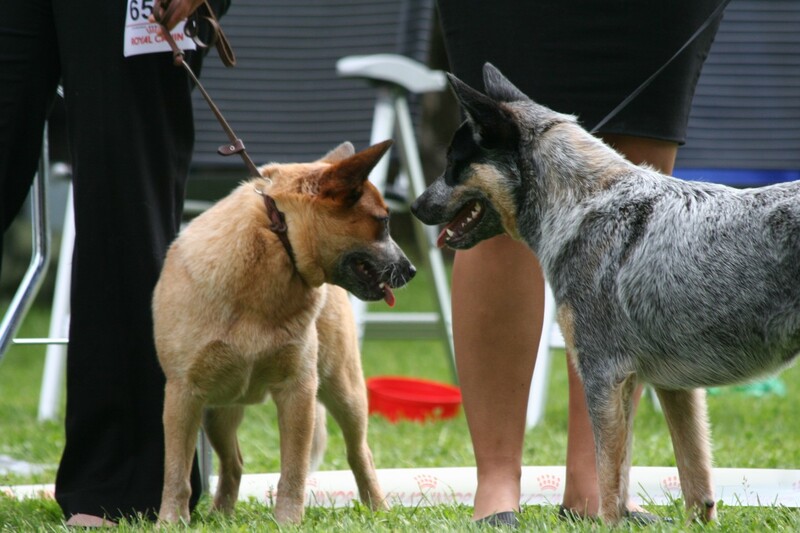 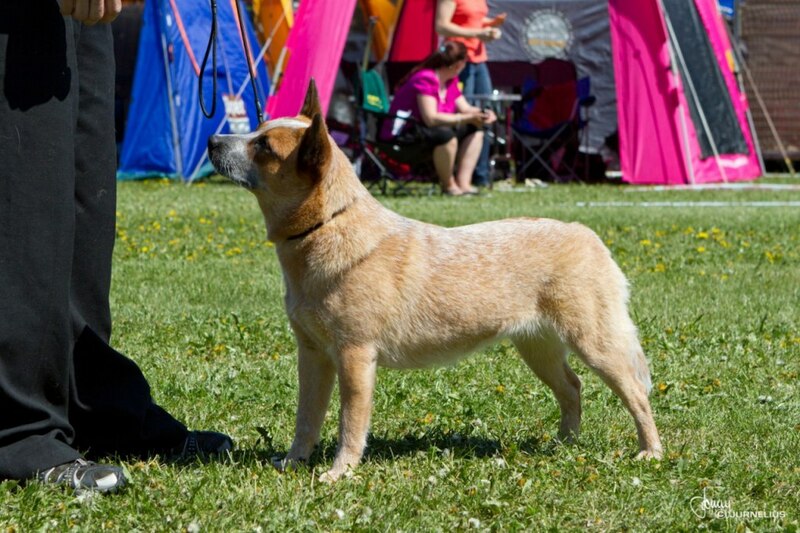 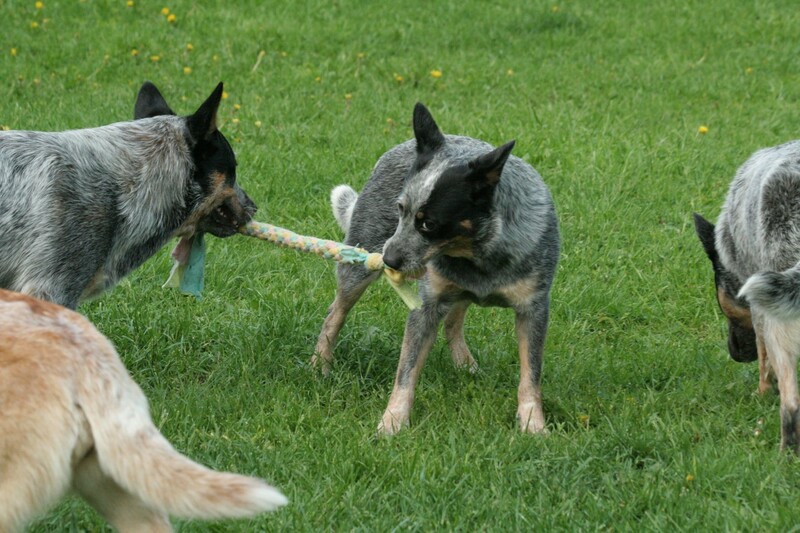 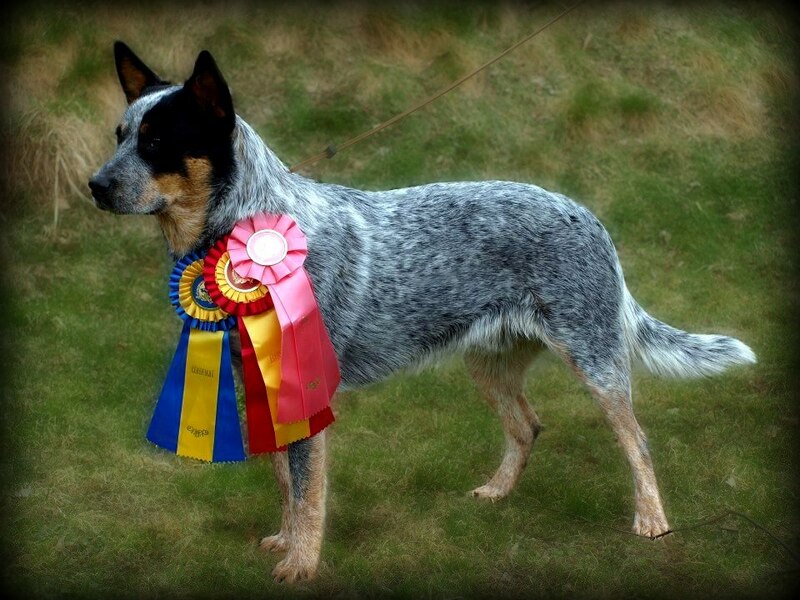 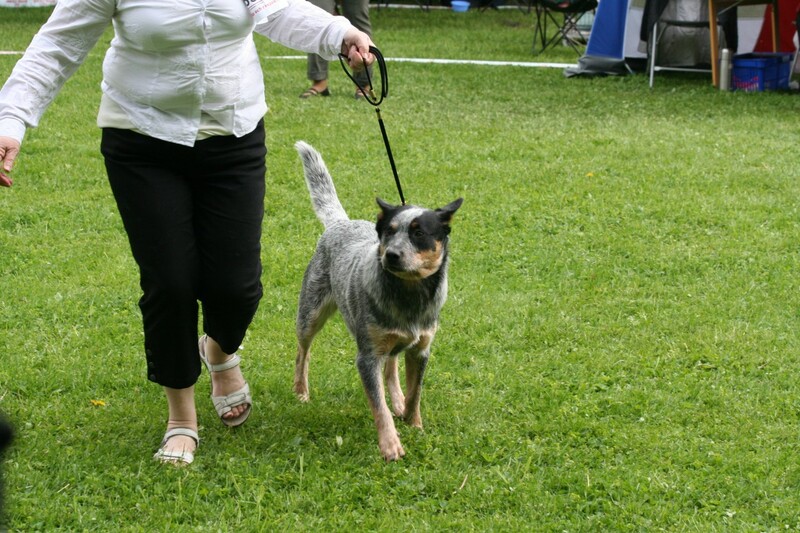 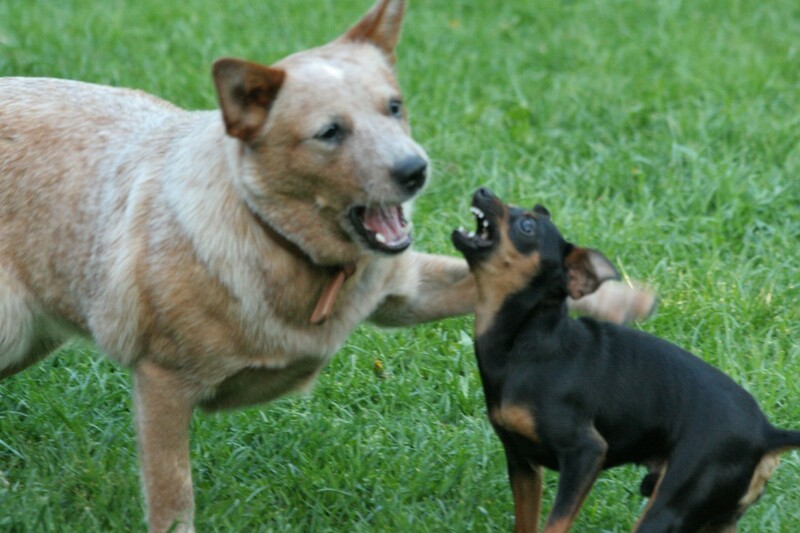 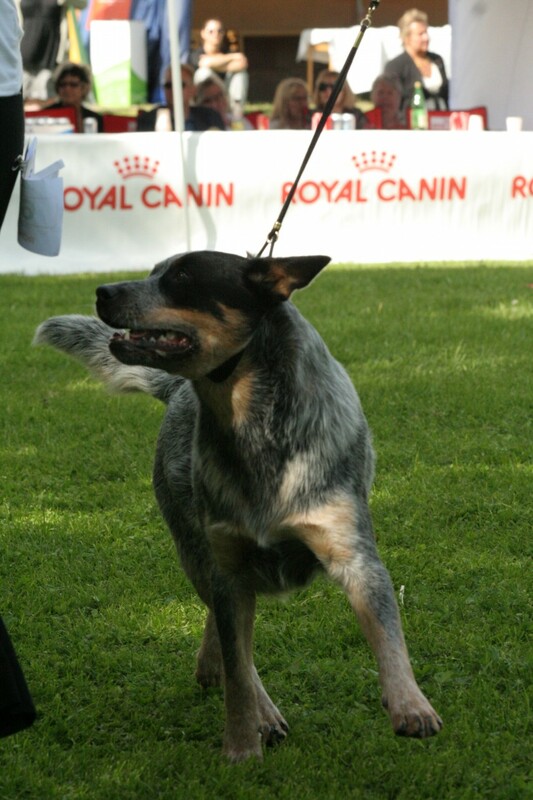 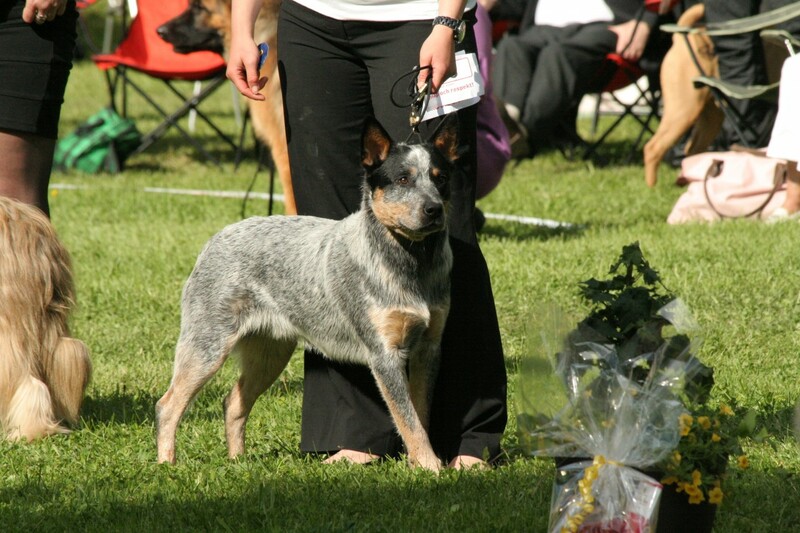 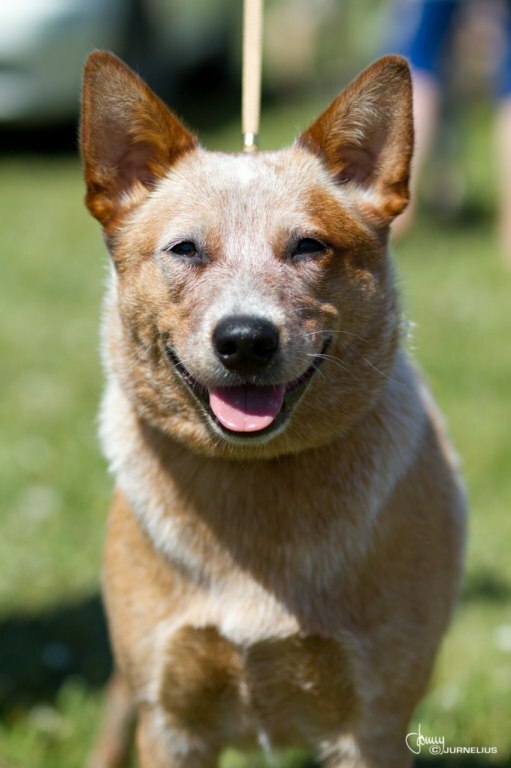 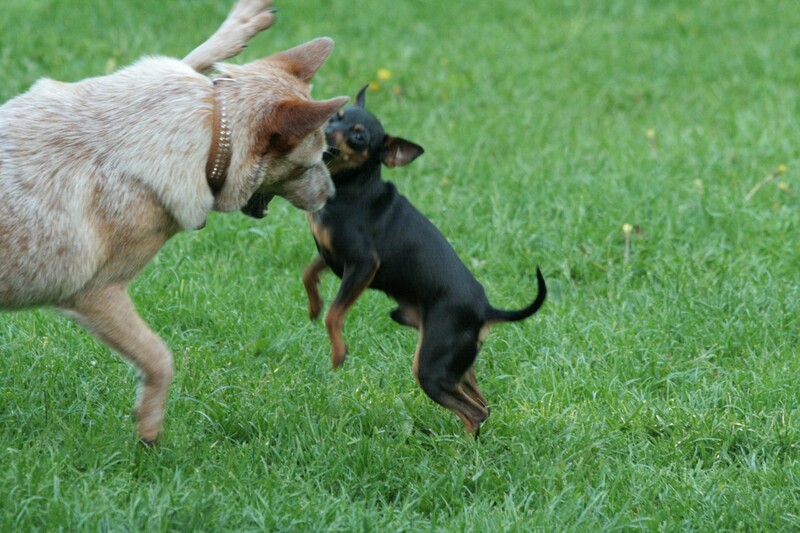 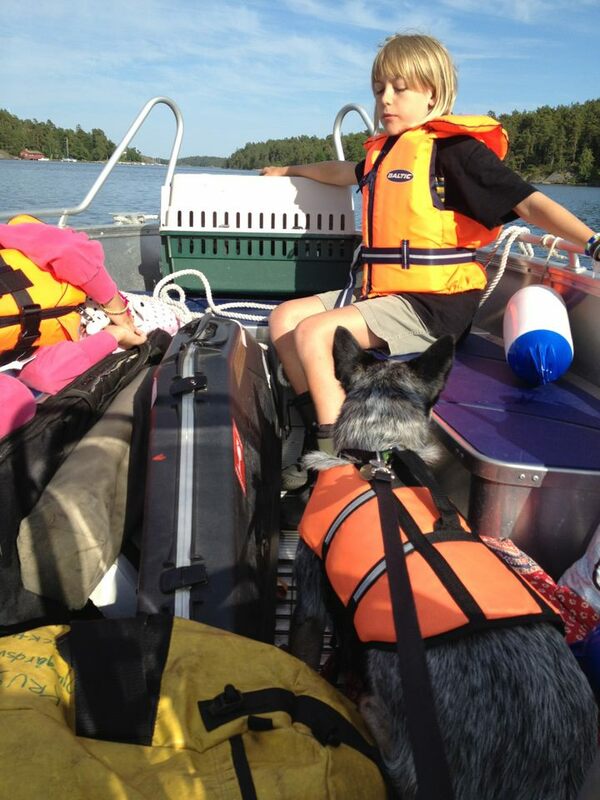 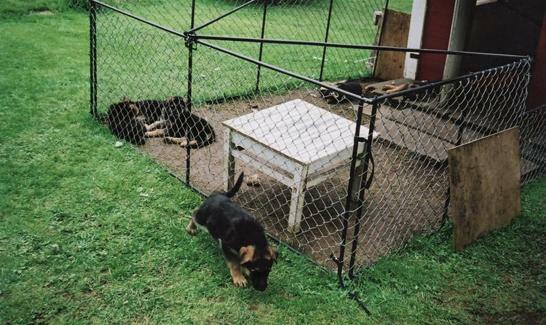 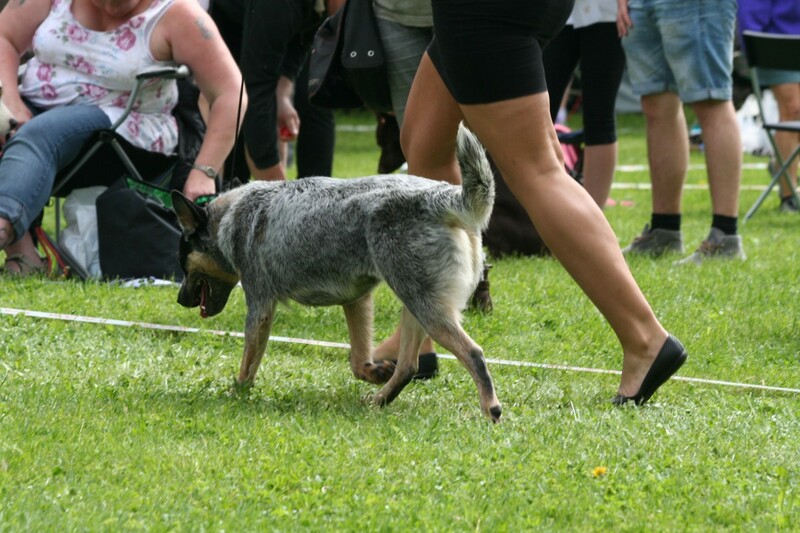 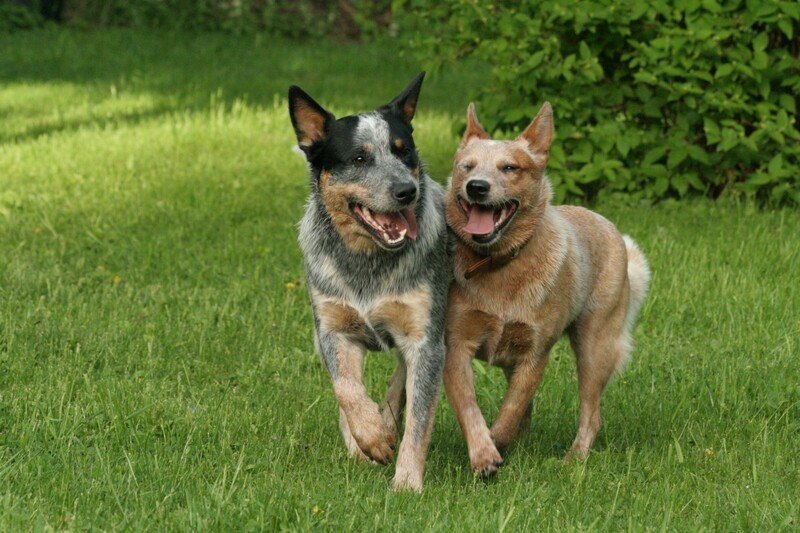 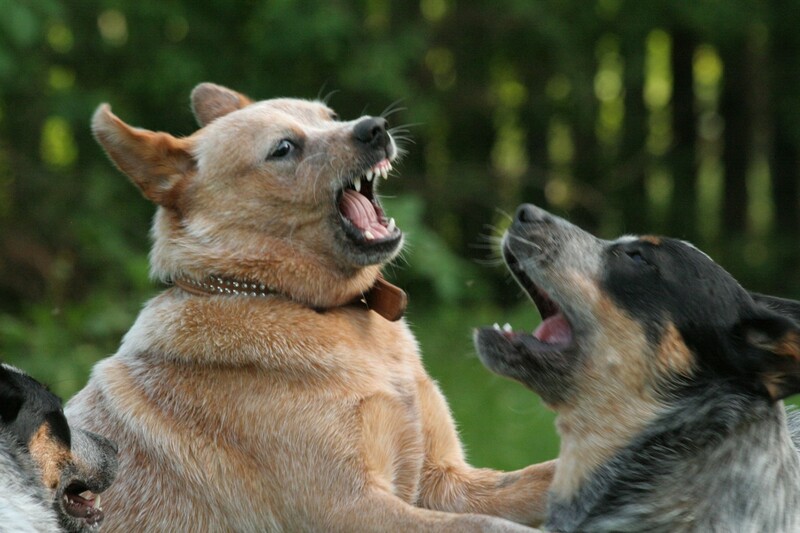 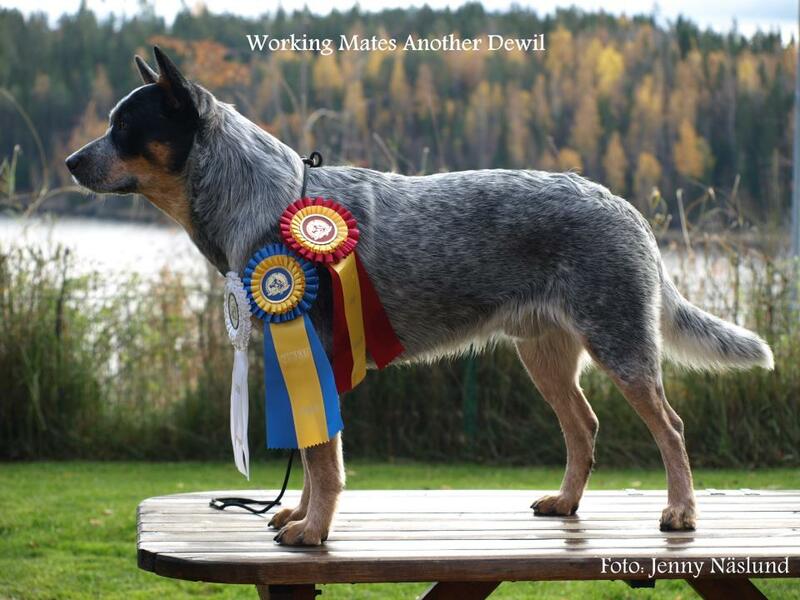 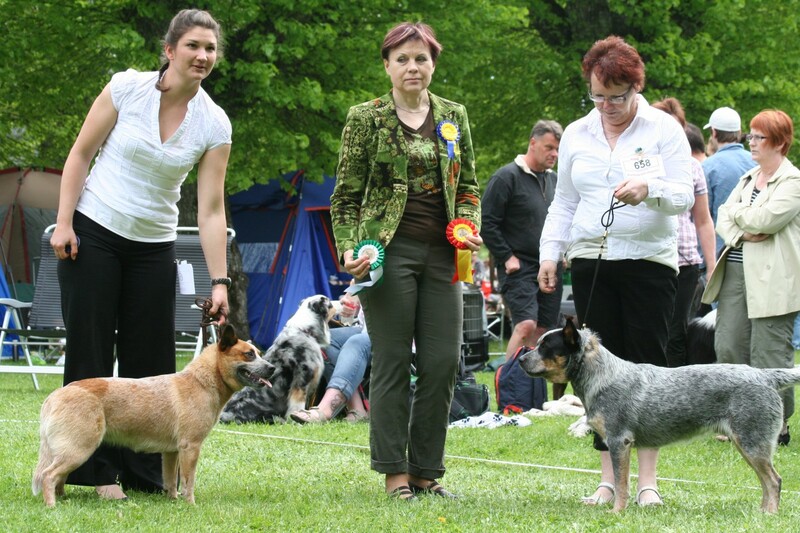 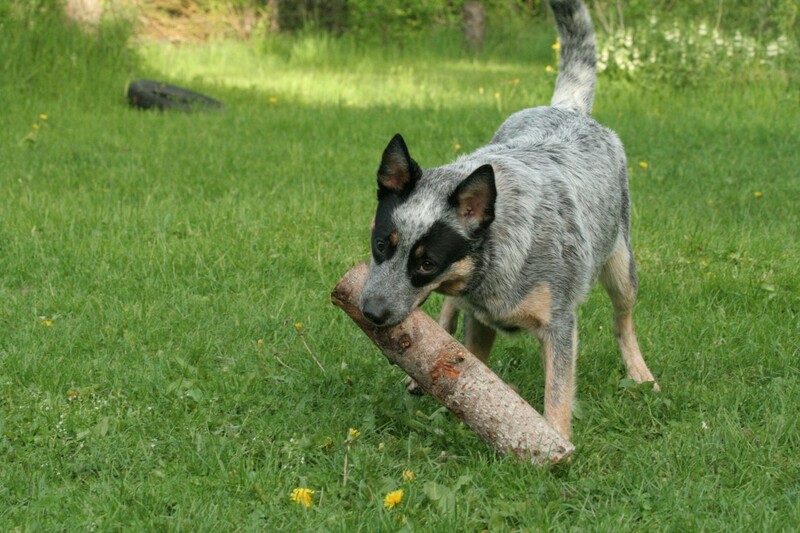 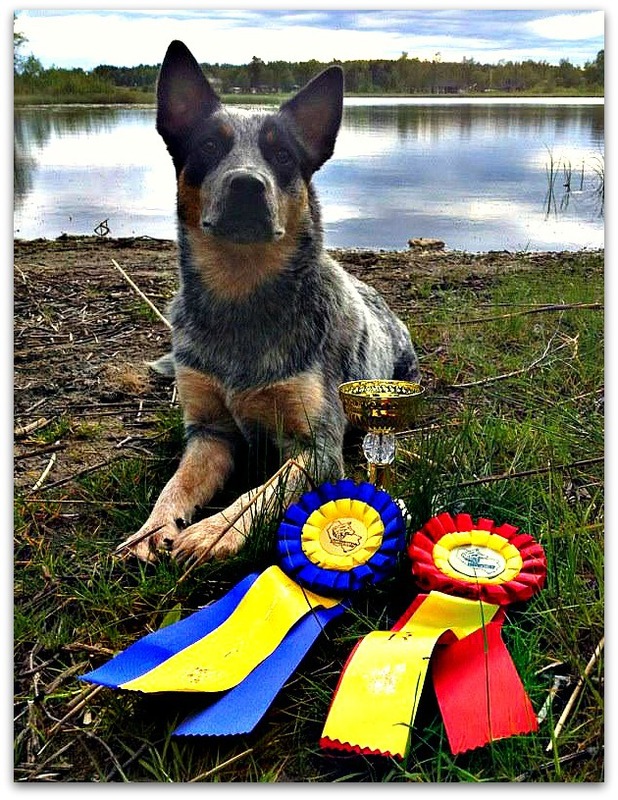 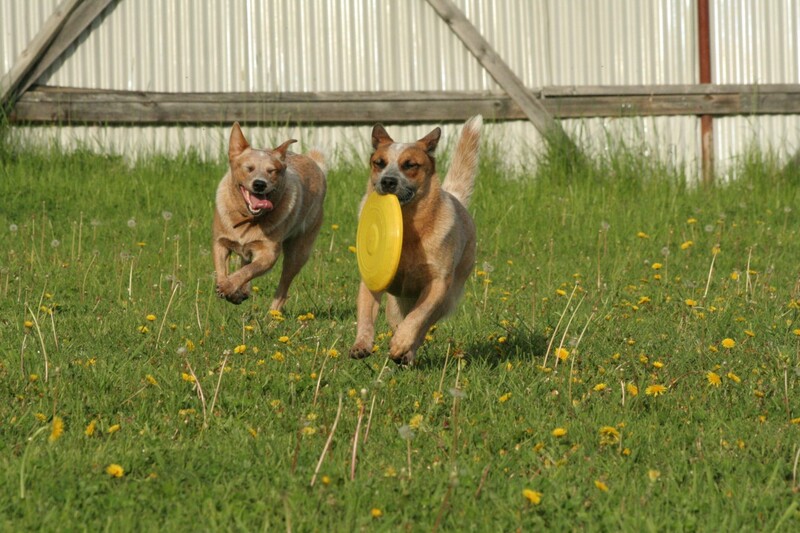 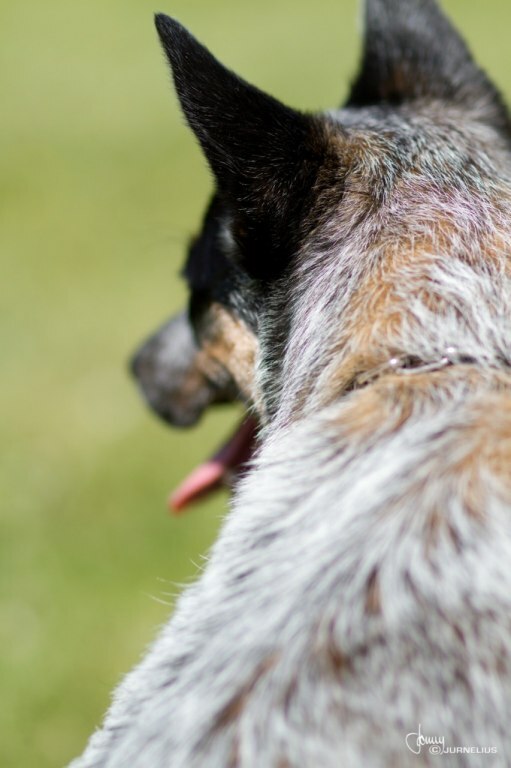 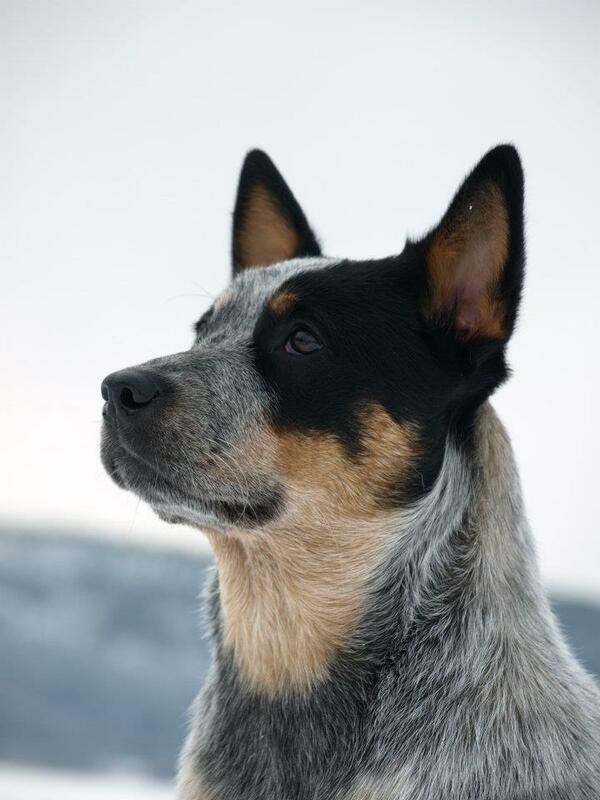 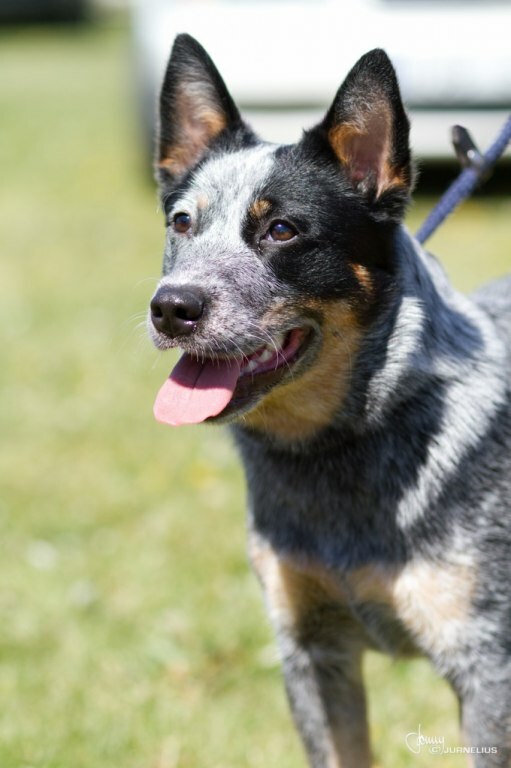 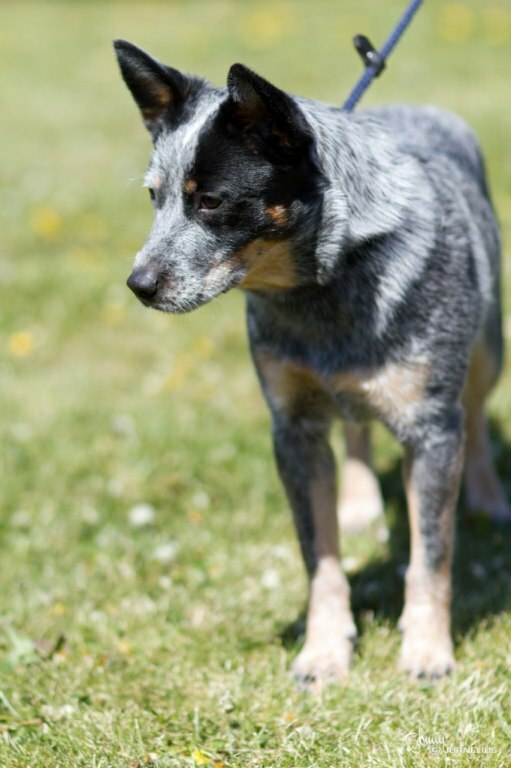 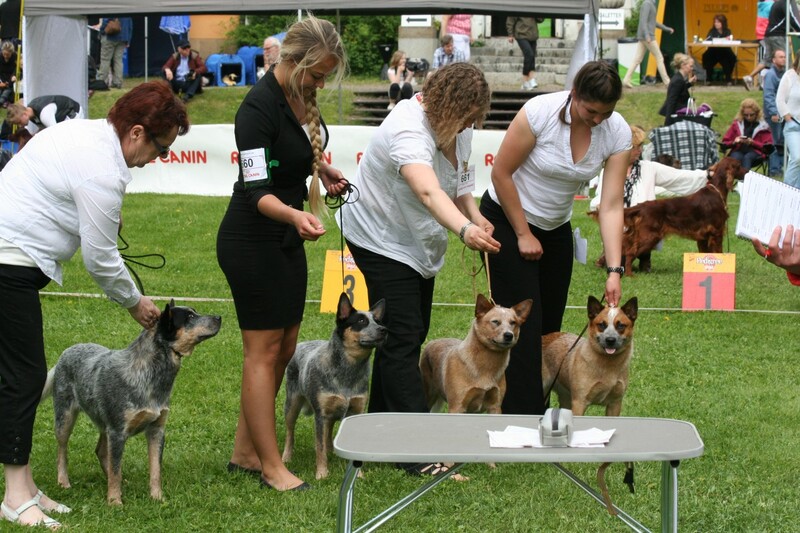 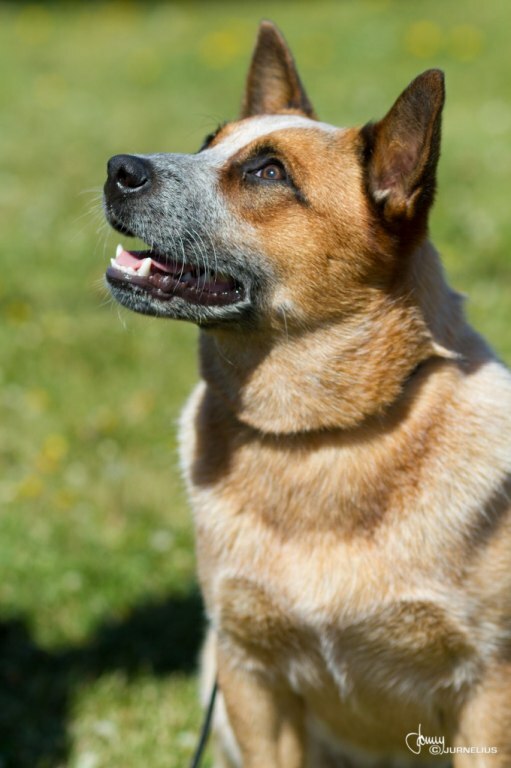 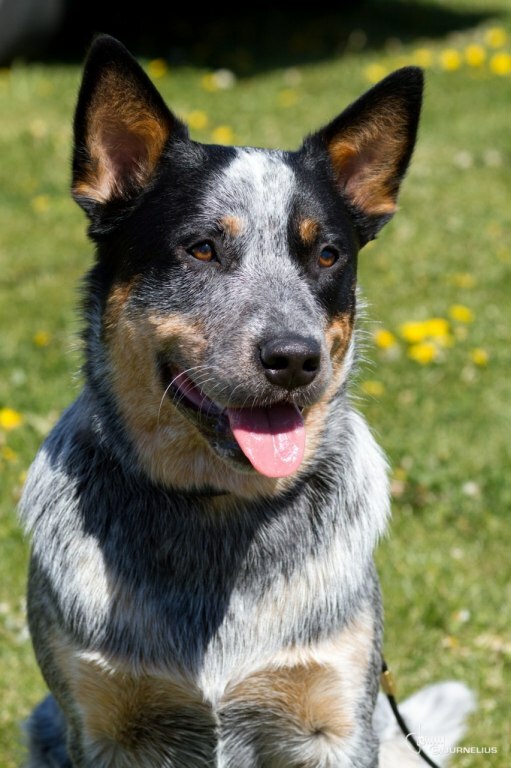 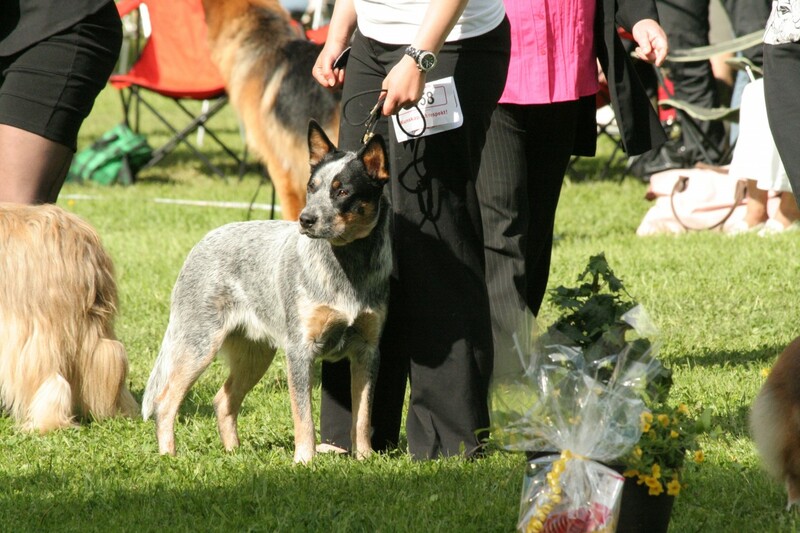 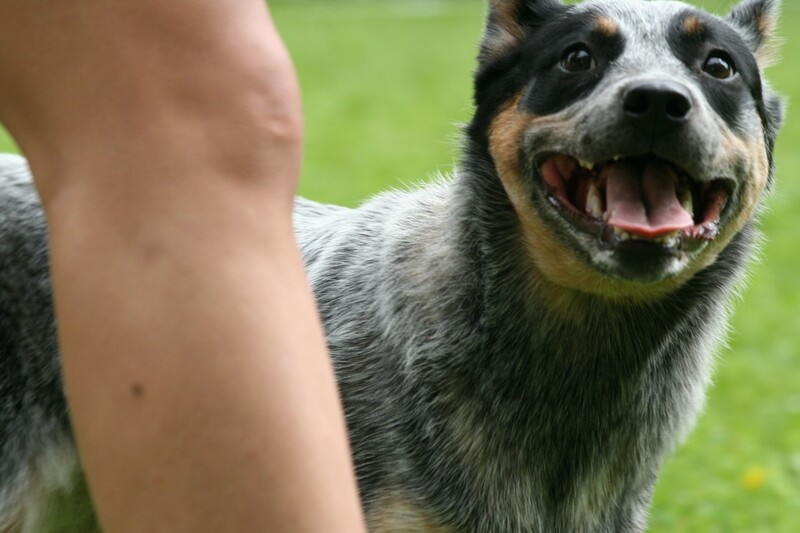 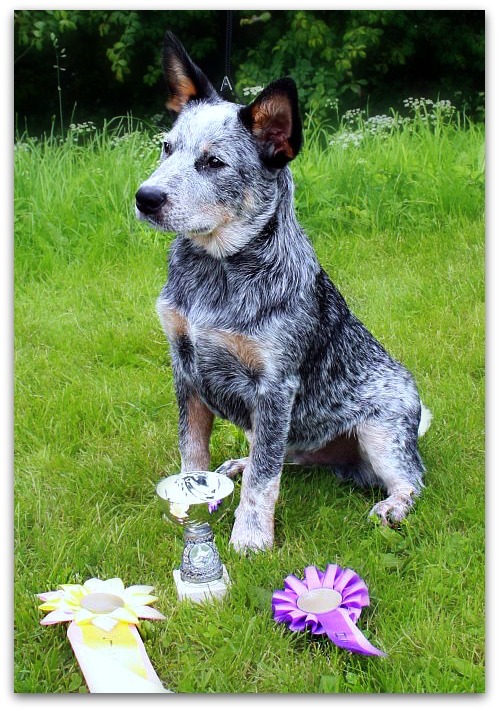 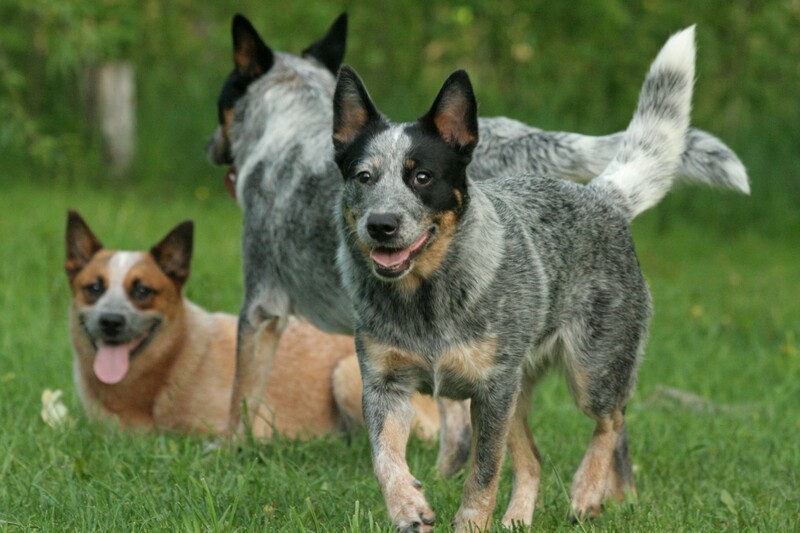 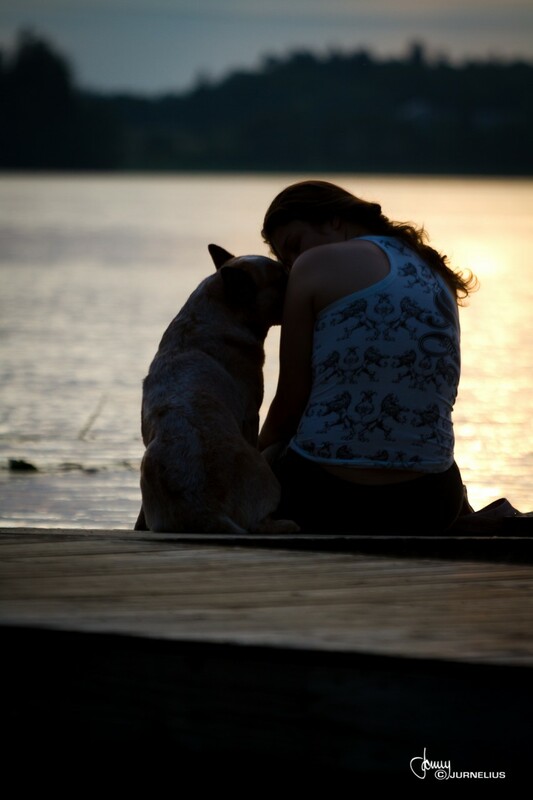 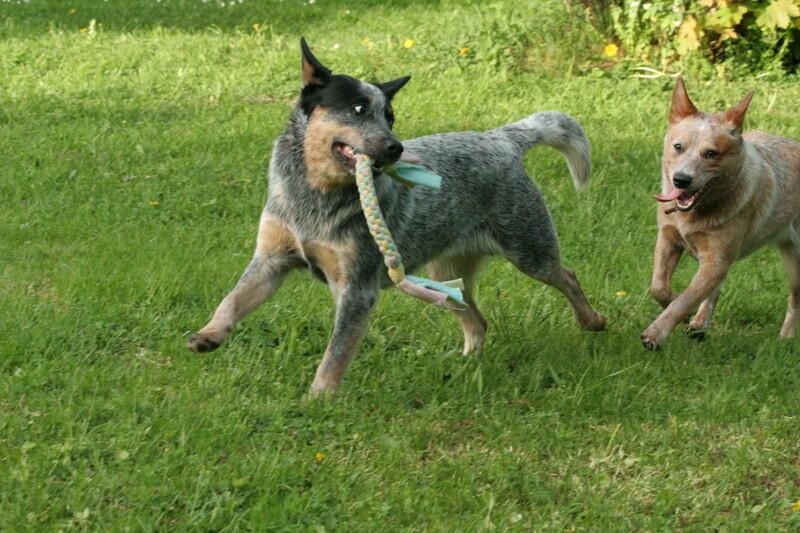 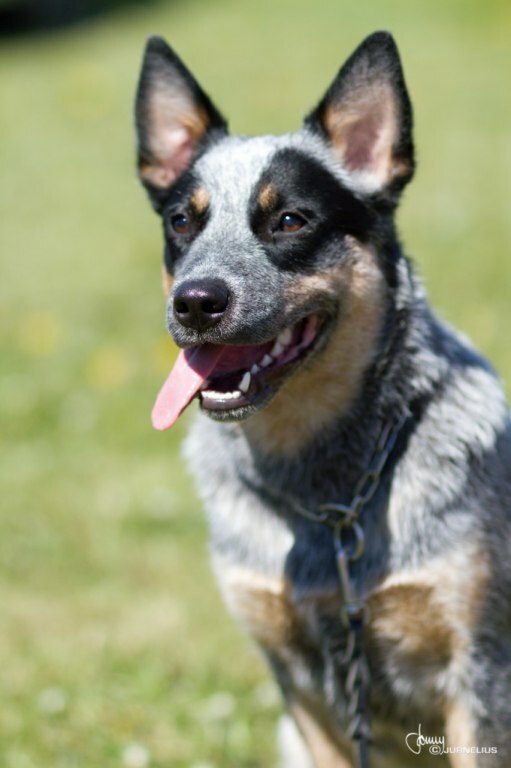 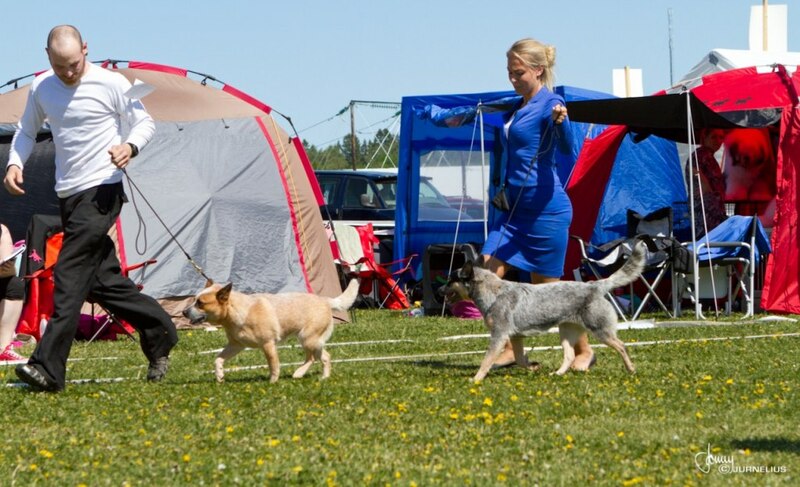 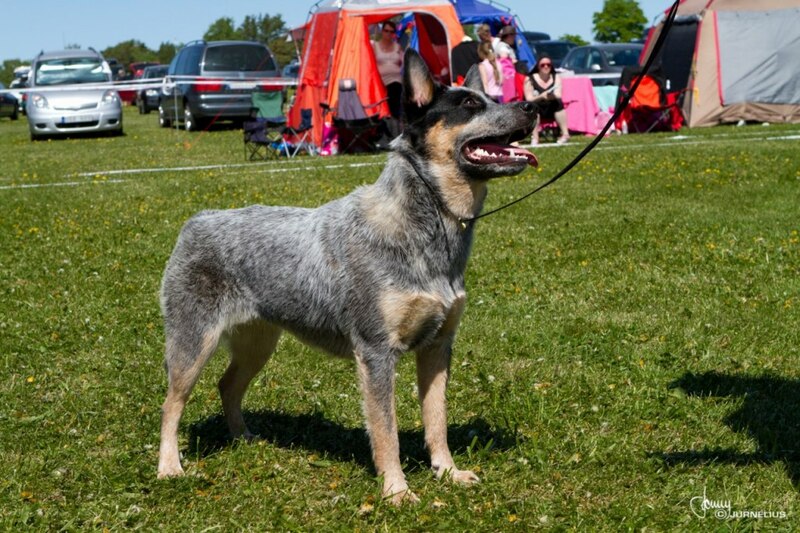 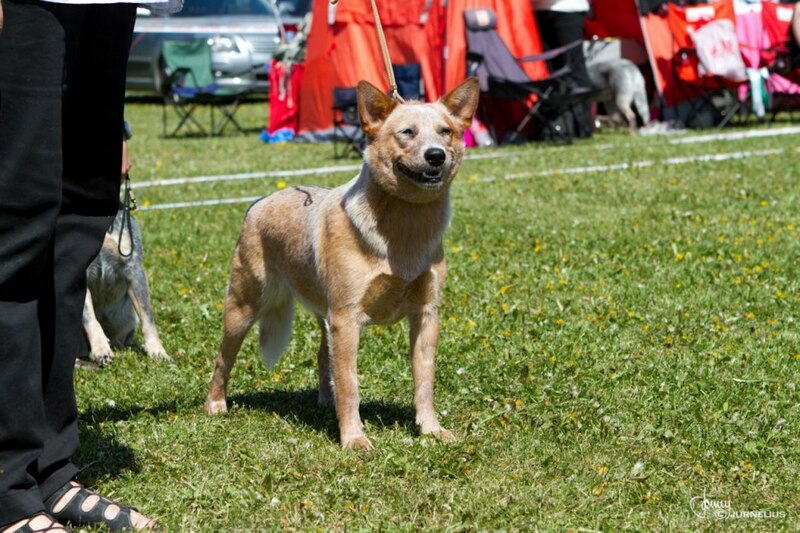 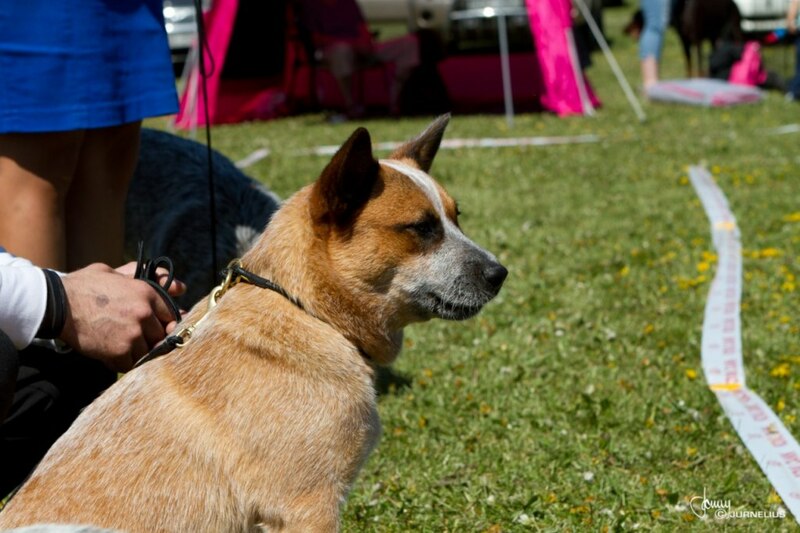 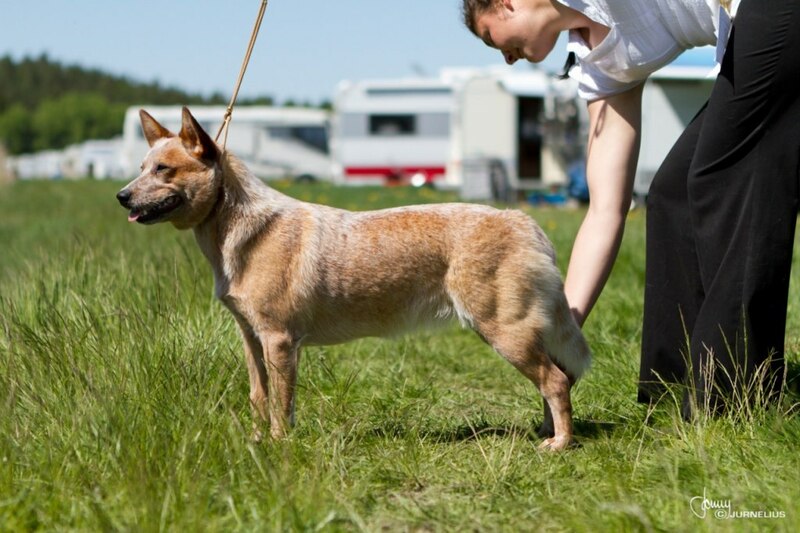 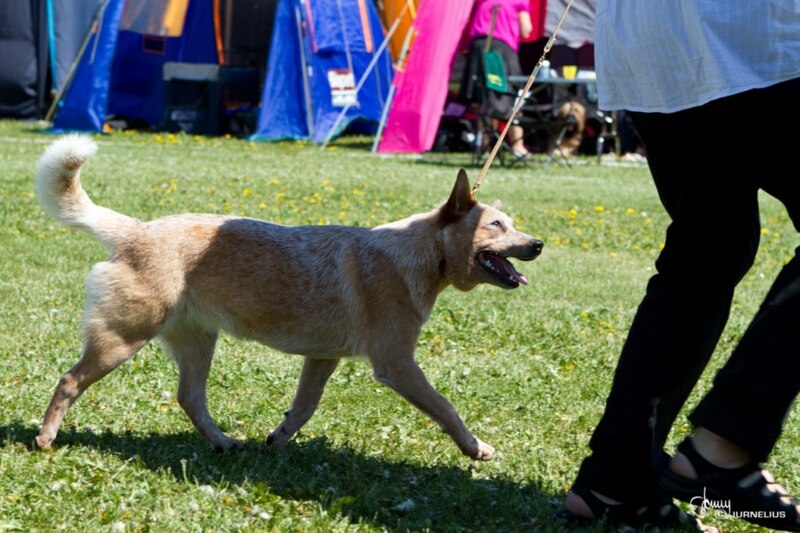 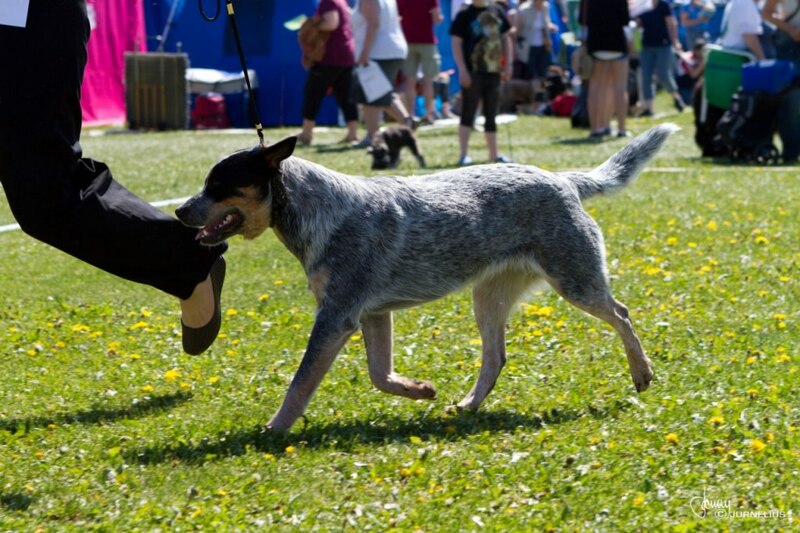 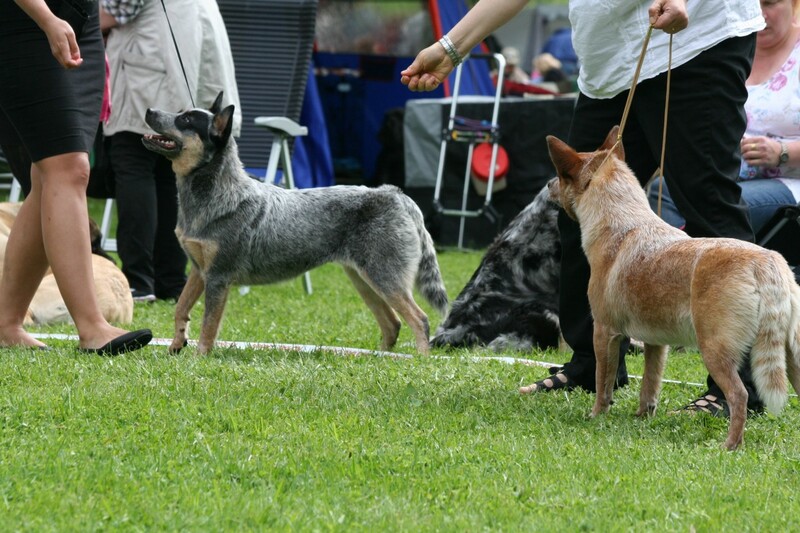 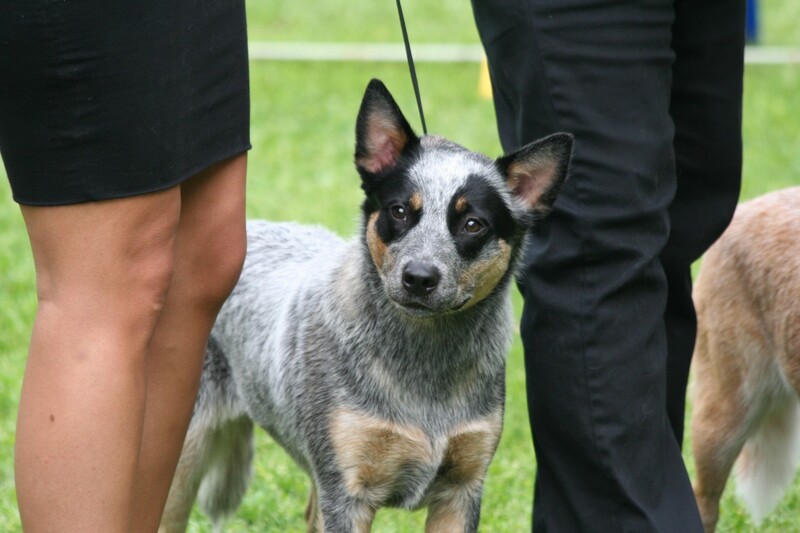 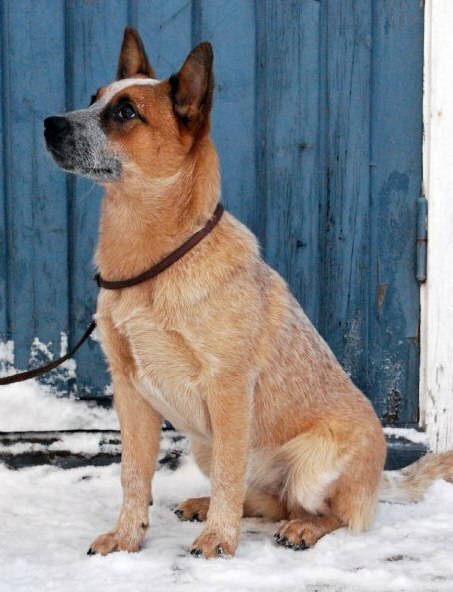 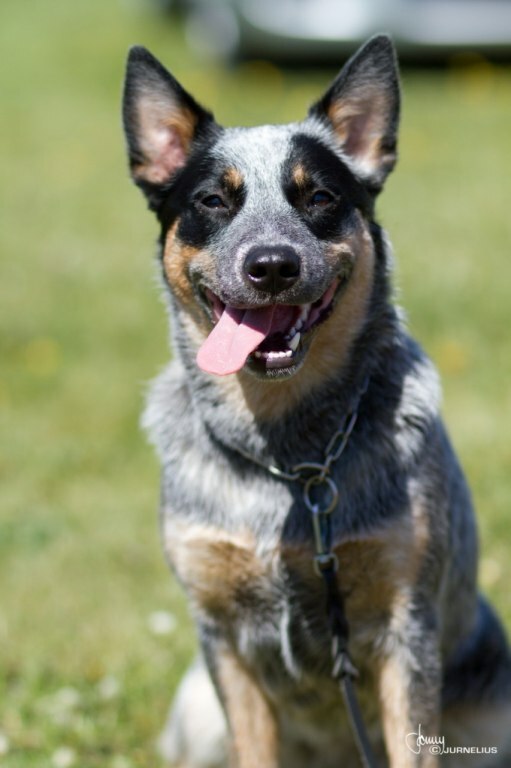 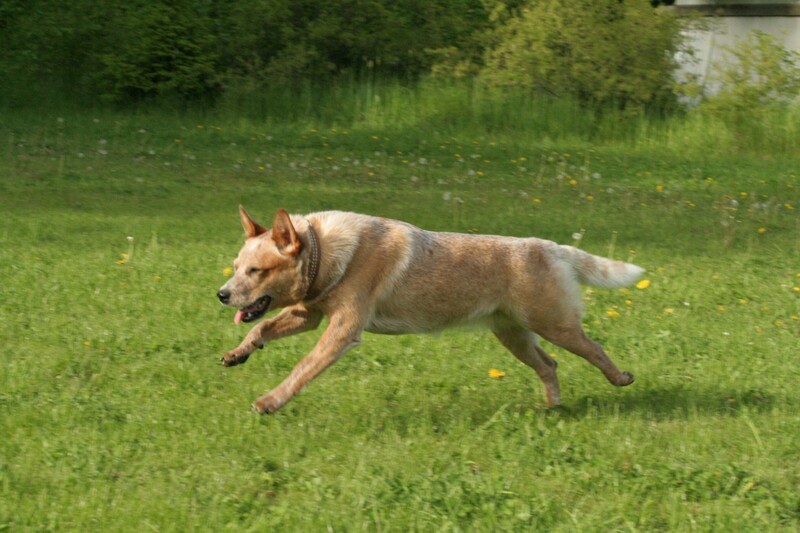 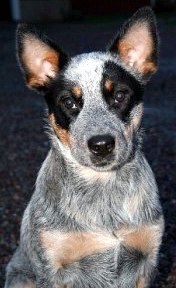 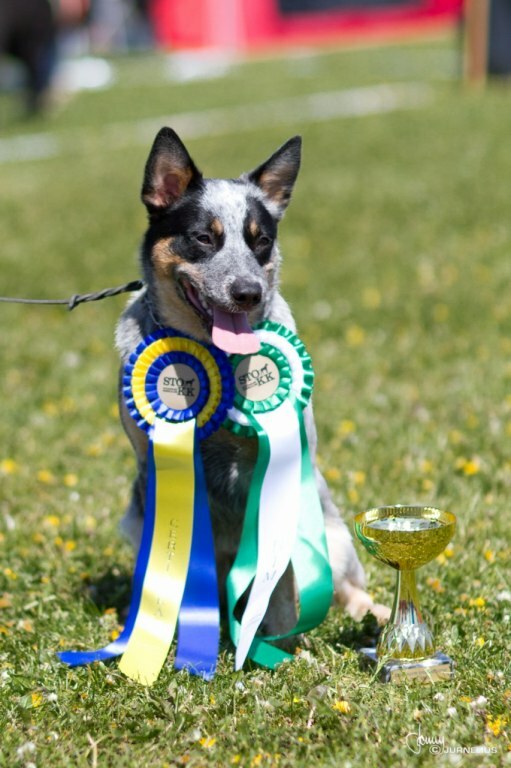 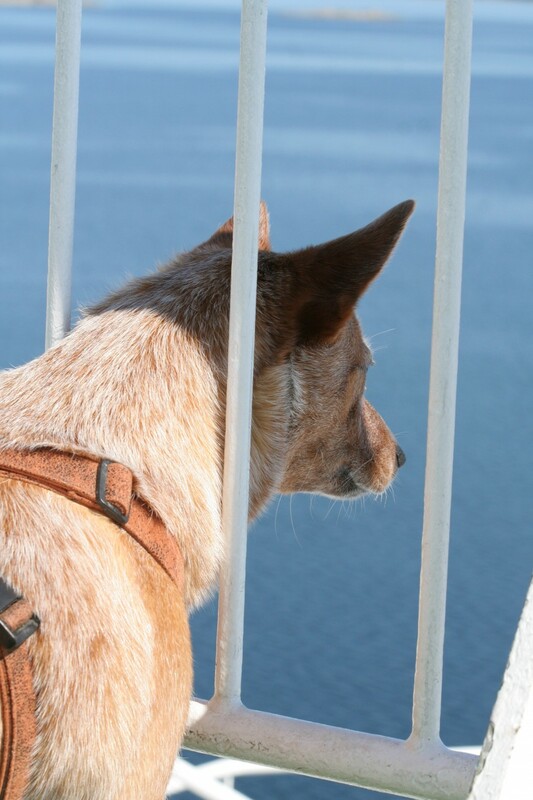 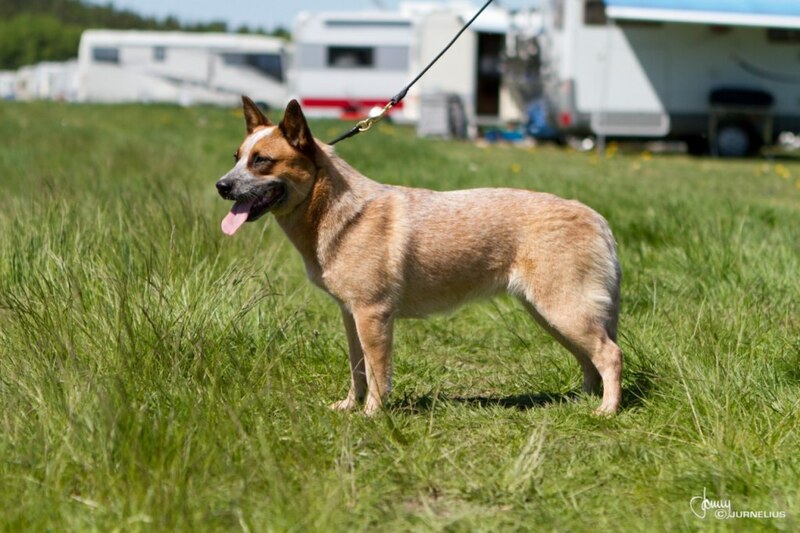 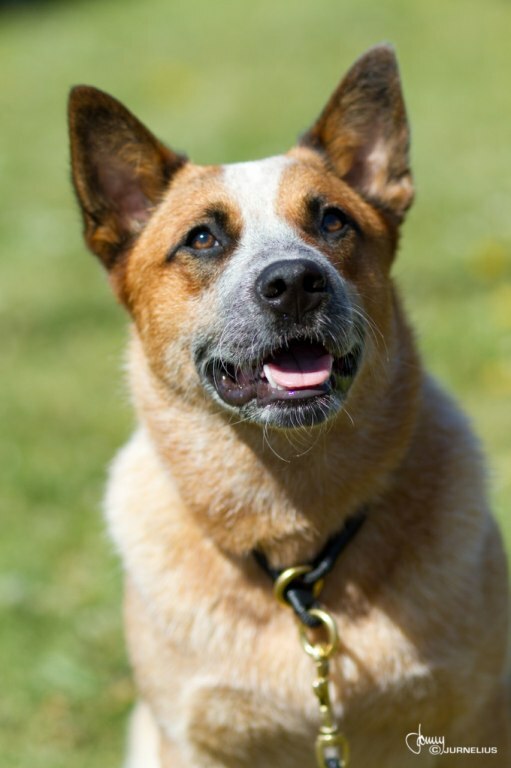 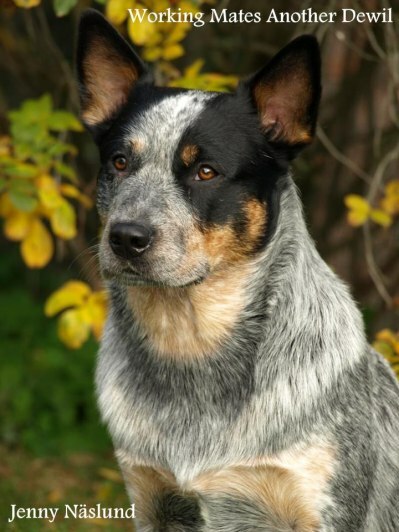 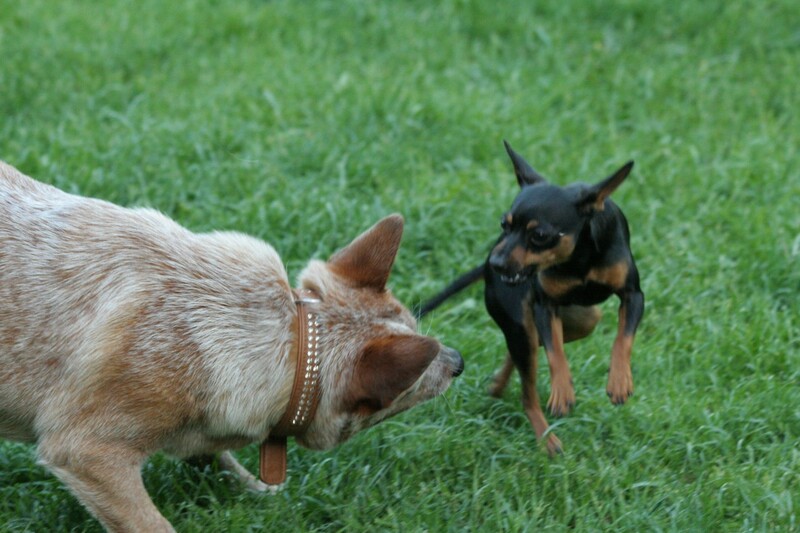 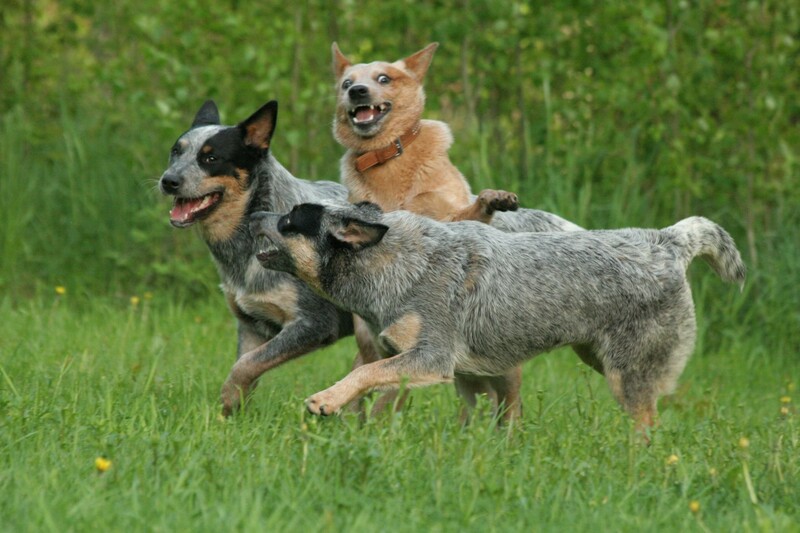 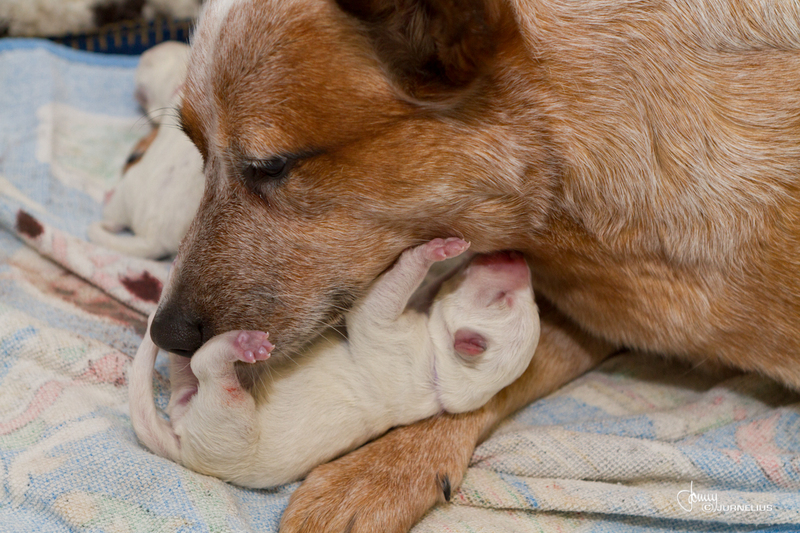 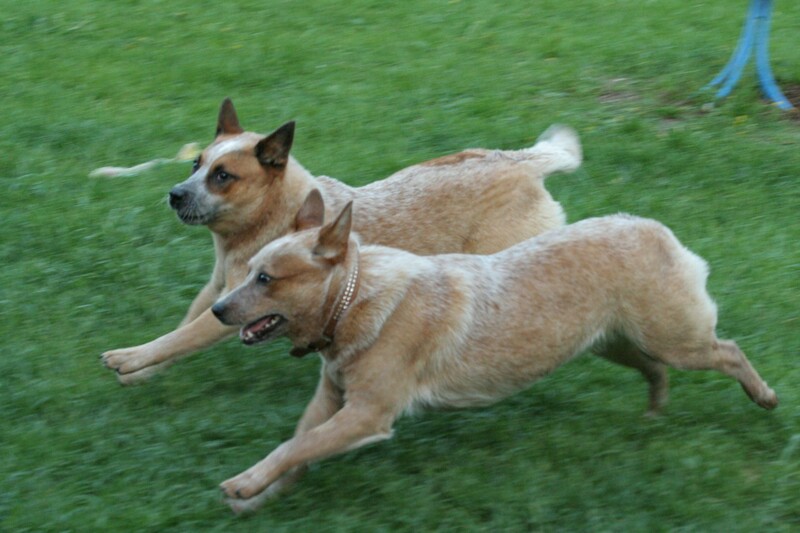 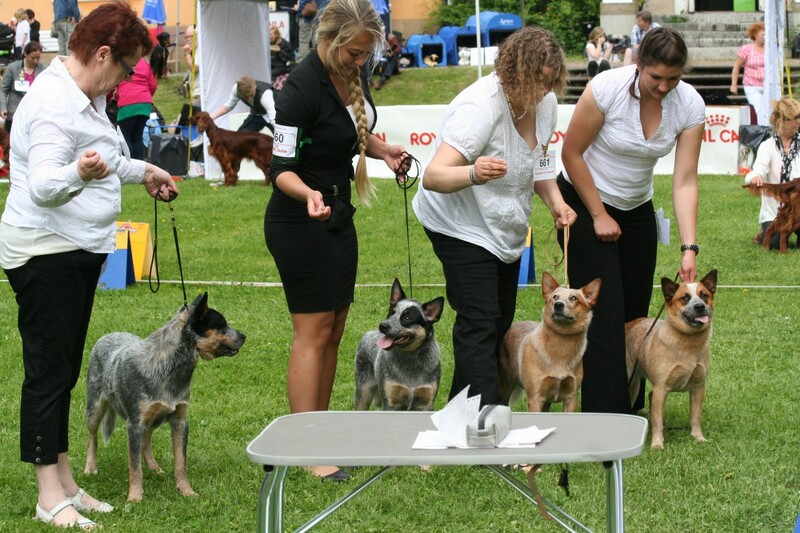 Breeders group: An excellent group, very typical of the breed, All have good balance, good overall body proportions, excellent typical heads, typical ears and ear placement, All dogs displaying typical cattle dog temperament. WM Another Dewil "Junior" became best junior male with CAC and 2:nd best male after the champion male. 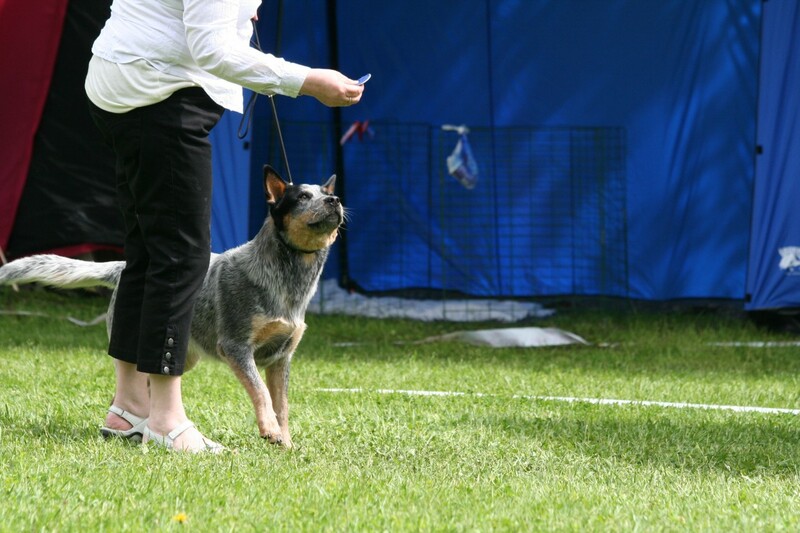 WM Action My Attraction "Storma" became BOS and got a nother CAC. 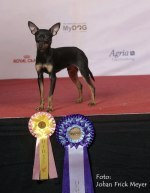 Rockys son Lex Murphy Czech Mate "Primo" was also showed! 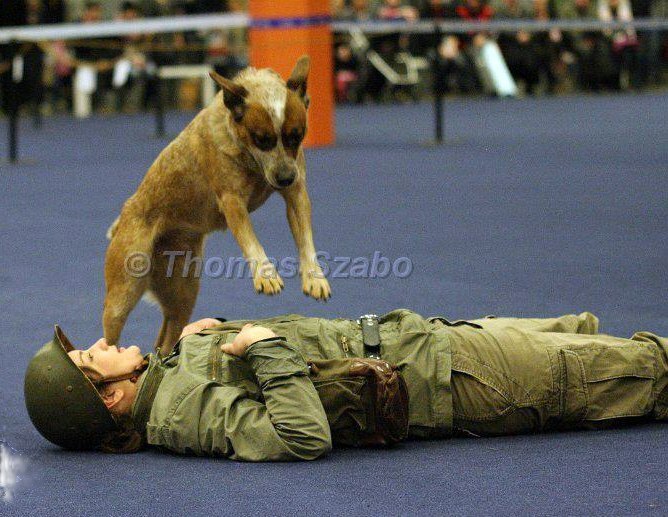 Result: Exc-1, CK, BM-1, CAC, BOS! Comments: Appealing proportions between height and length. 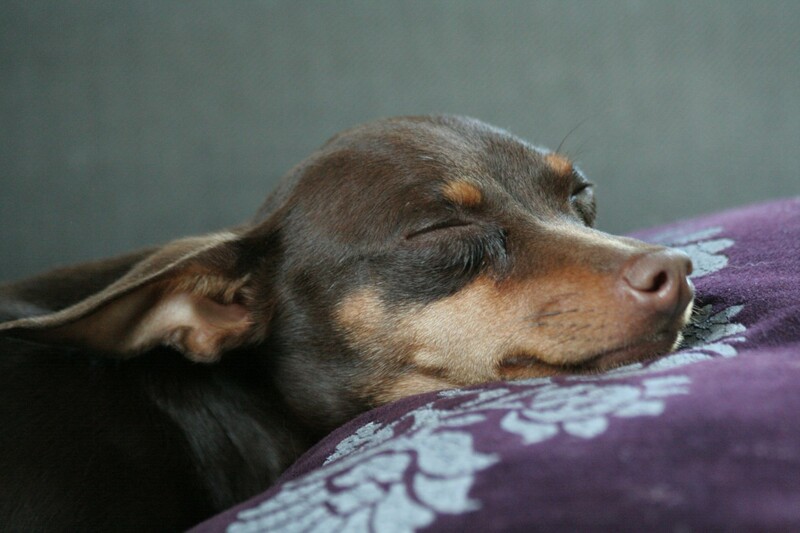 Just right length of nose. 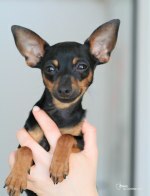 Beautiful pearshape of the head. 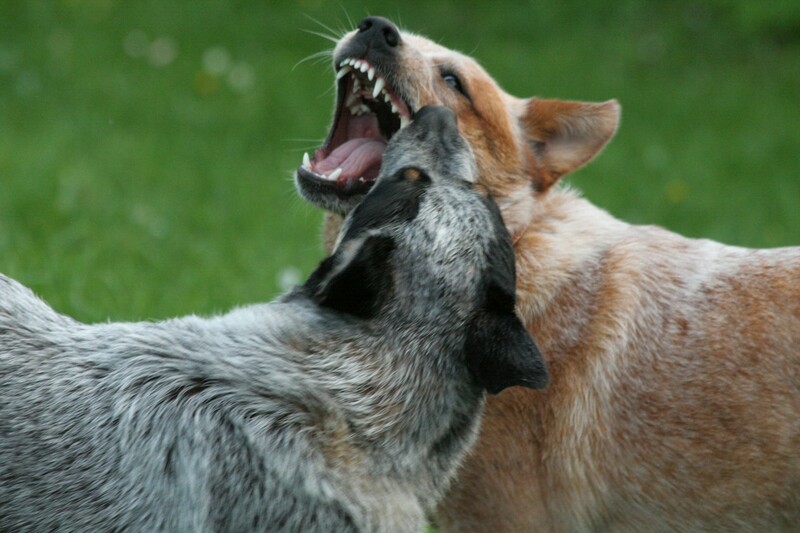 Excellent stop, powerful jaws, excellent bite, strong teeth. 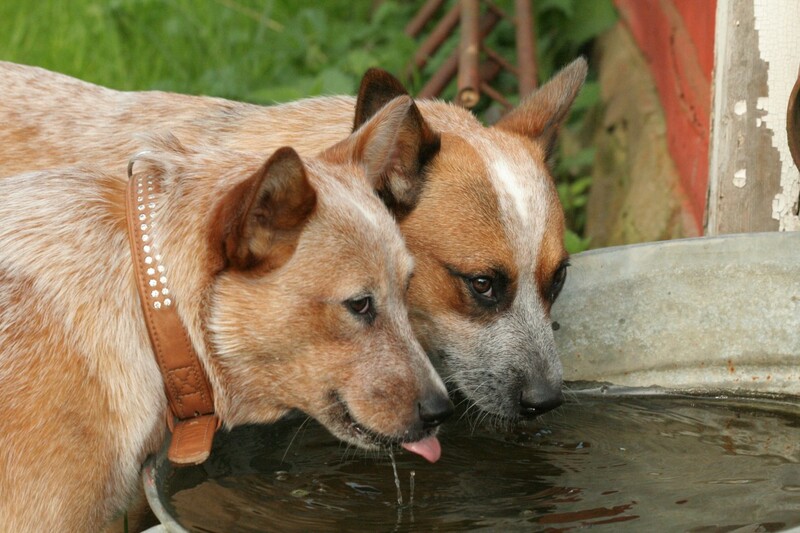 Dry neck, good structure, straight front legs . 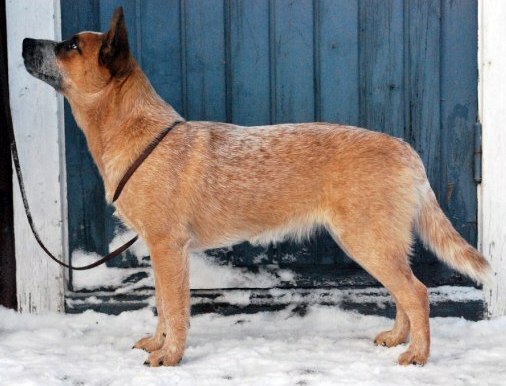 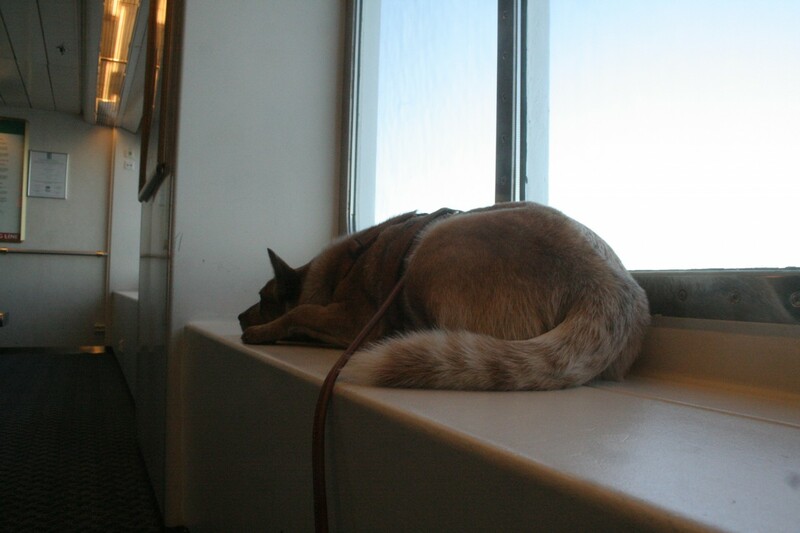 Strong back, excellent angulations, dense coat, collected paws. 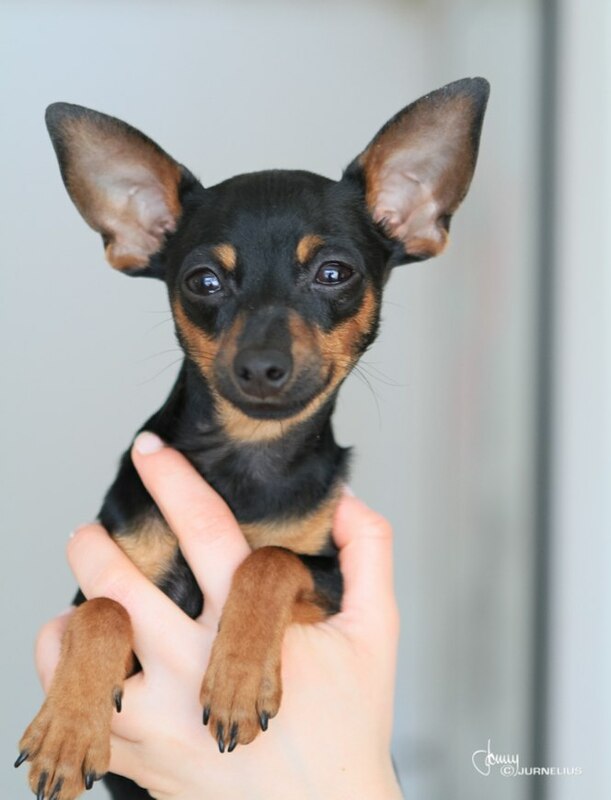 Excellent expression that is enhanced by the placement of the ears. 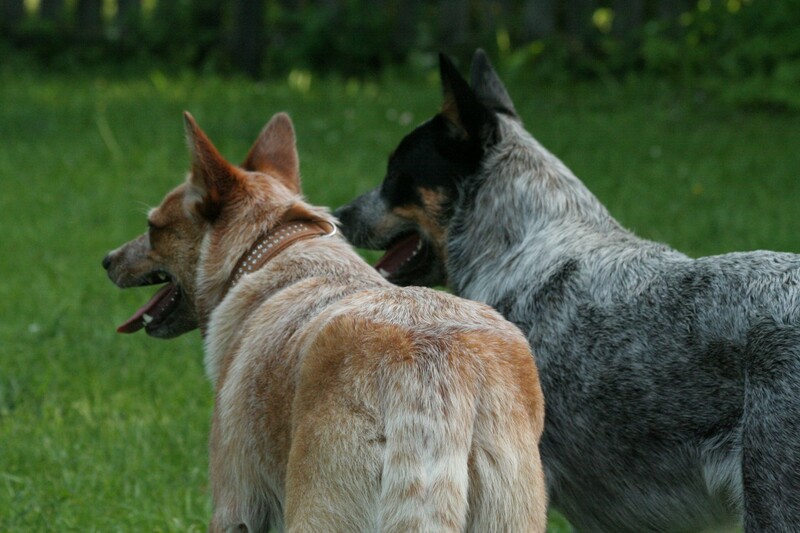 Separated tan markings. 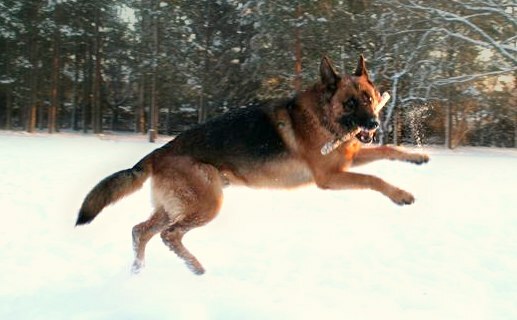 Moves with a good stride, good reach. 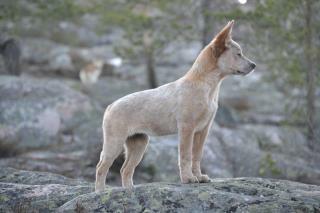 New pictures of the ACD B-Litter, 4 months. 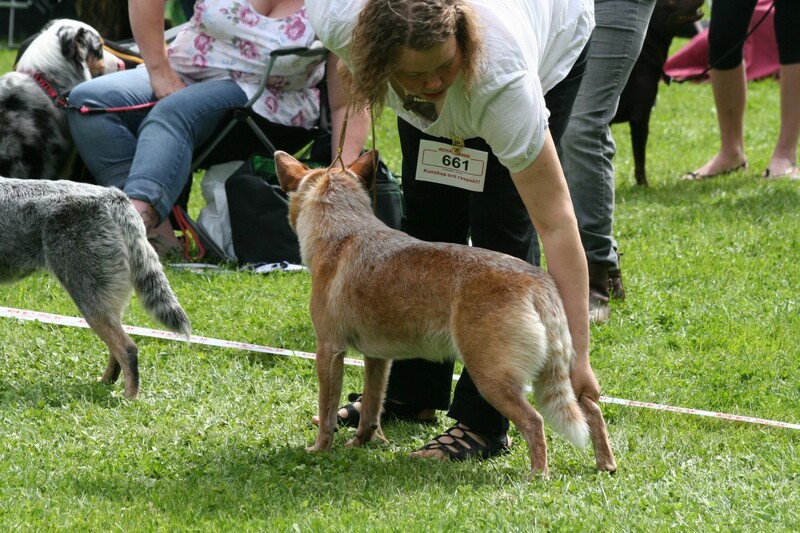 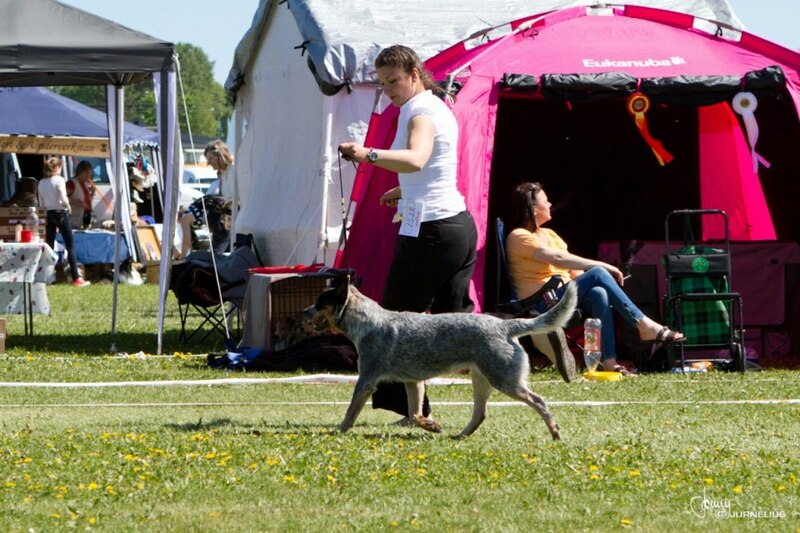 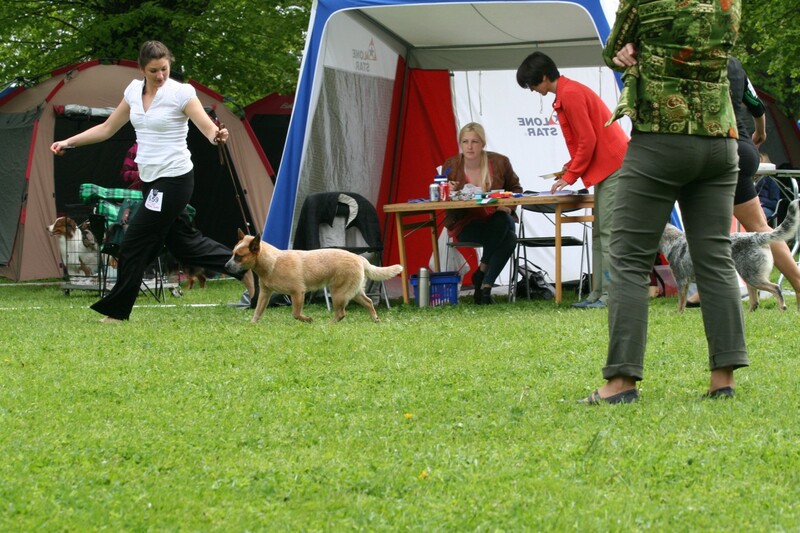 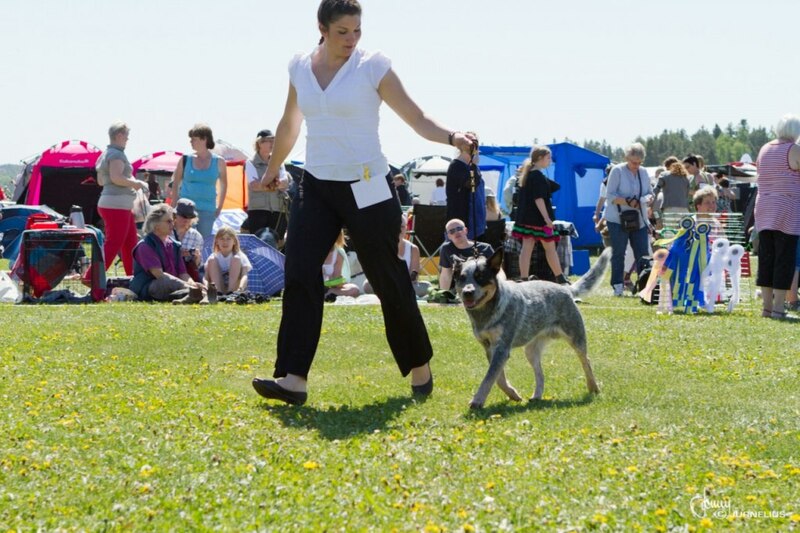 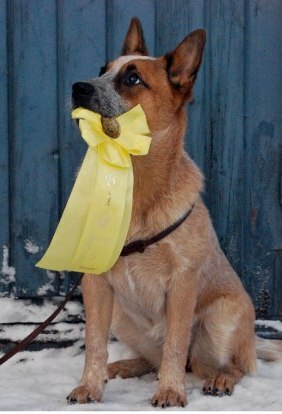 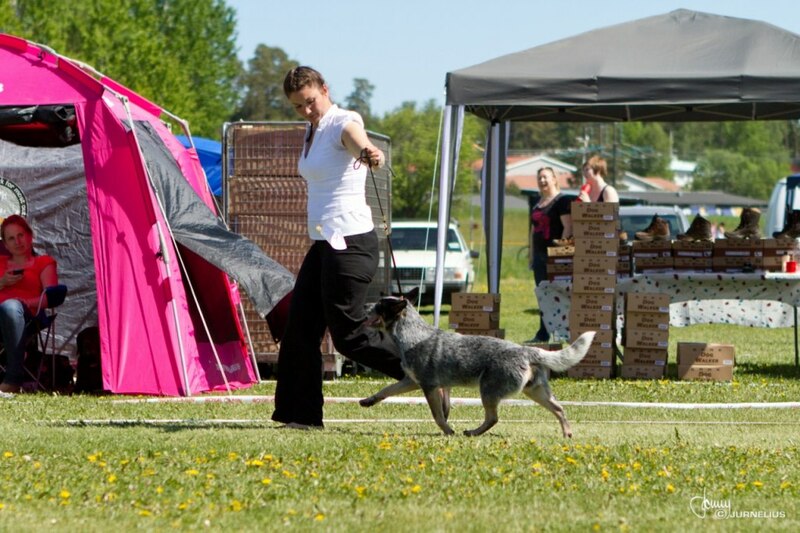 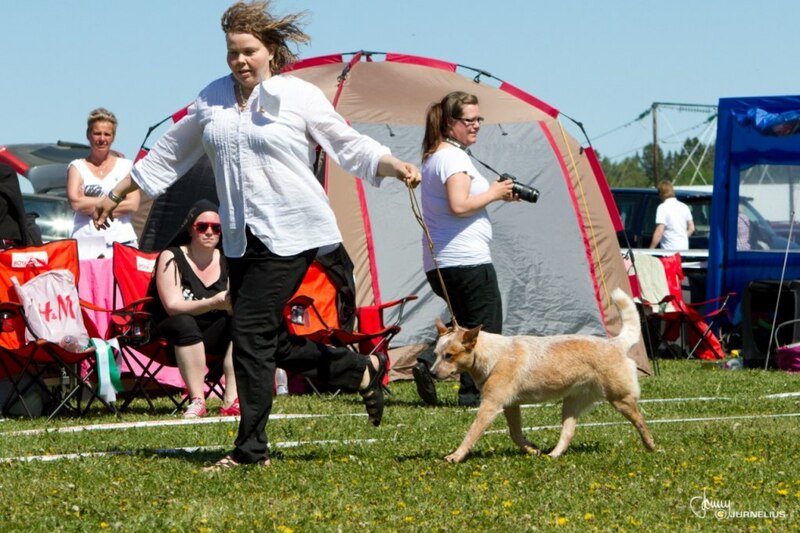 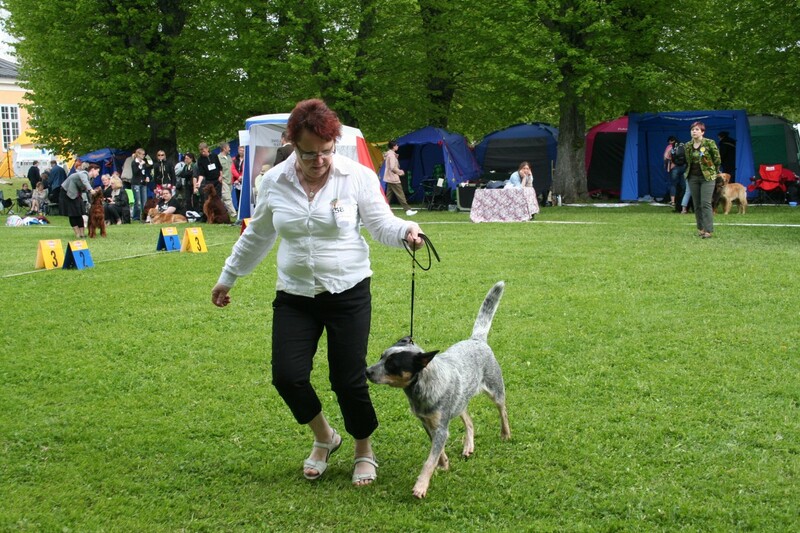 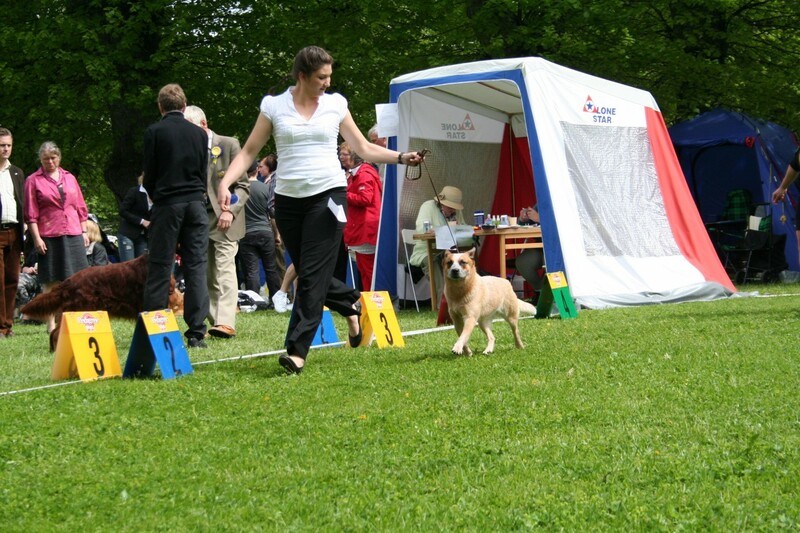 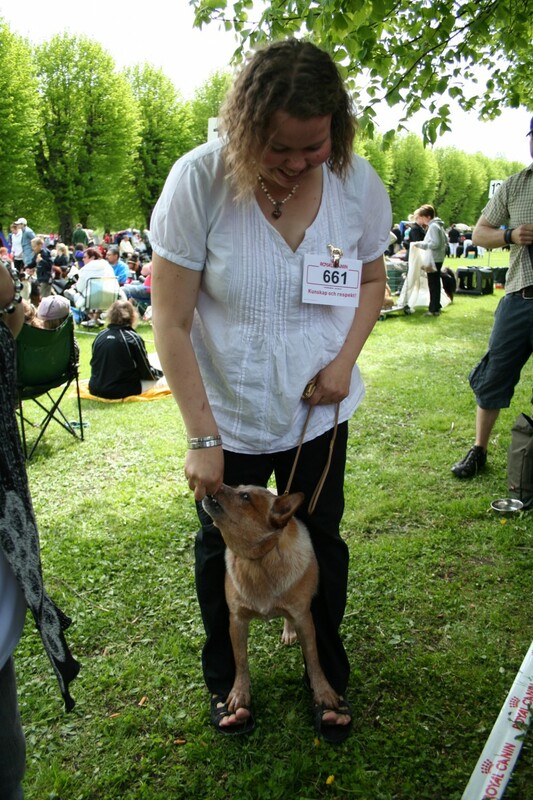 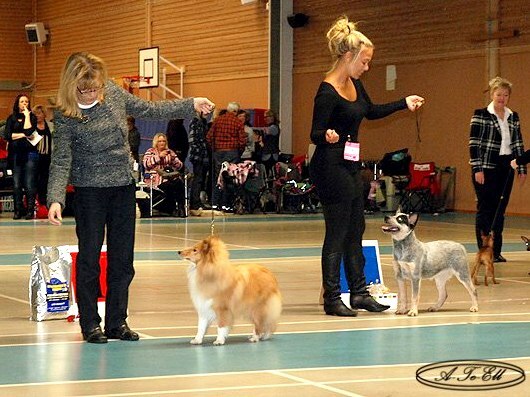 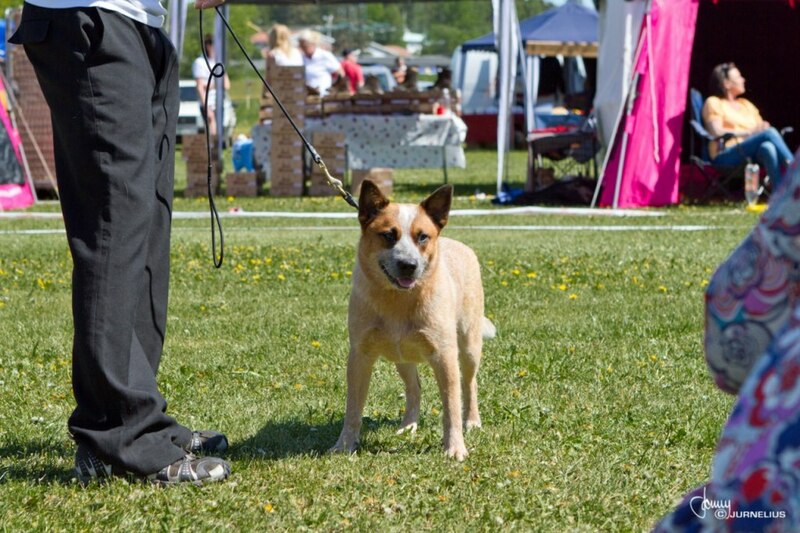 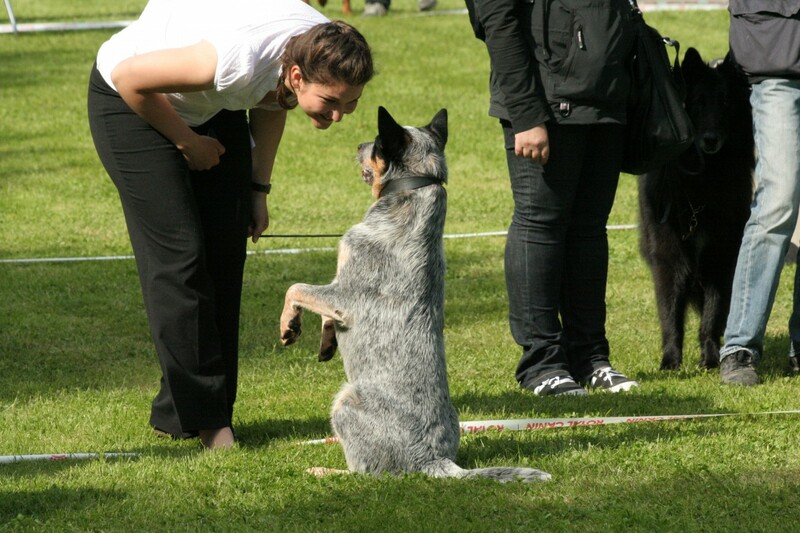 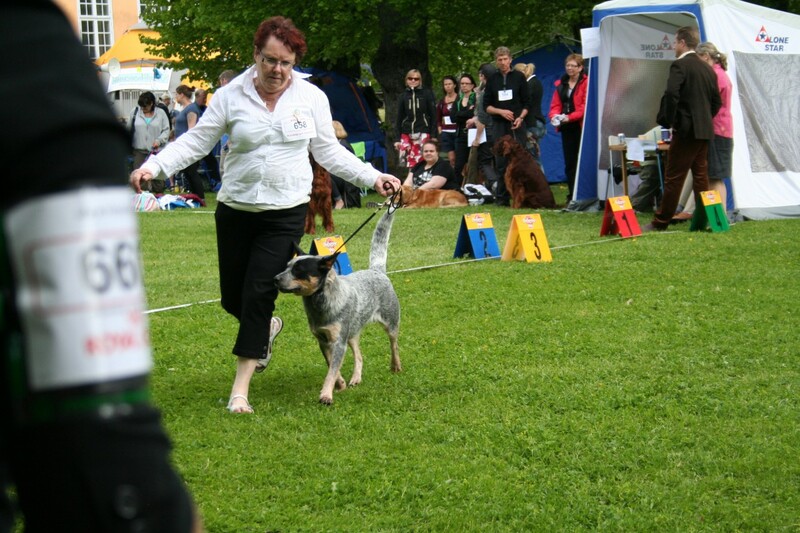 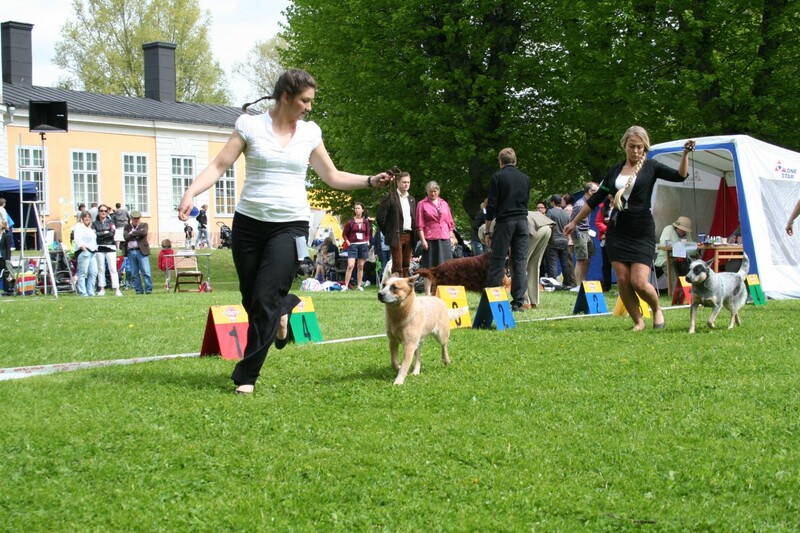 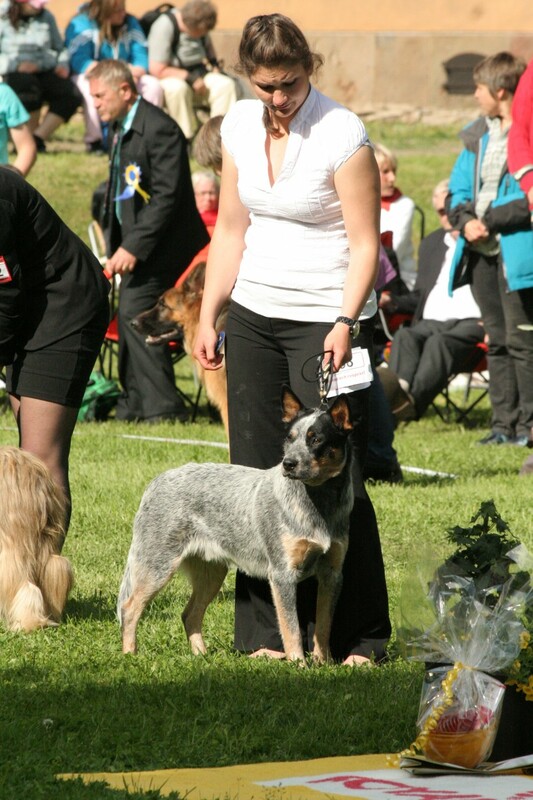 Today Sydney competed with Jenny Jurnelius in Rally obedience at Märsta- Sigtuna BK she got 86 points. 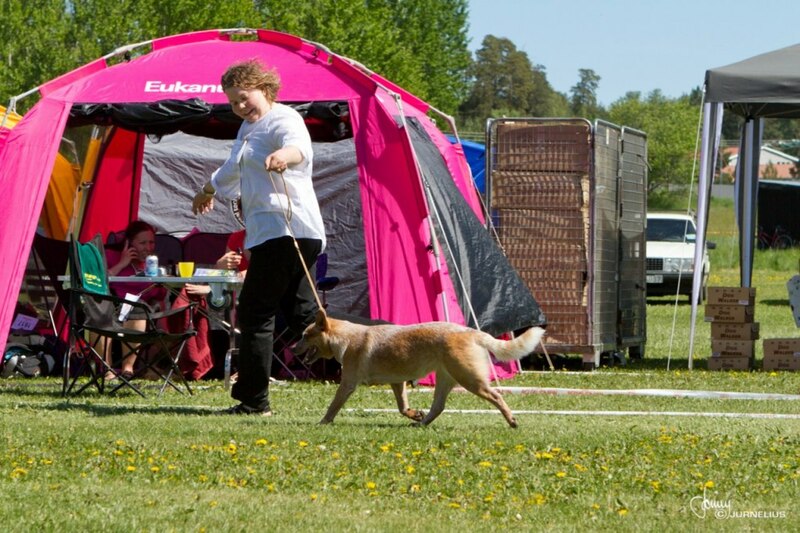 Some new pictures of Working Mates Admire My Fire "Trillian" on a unofficial show in Finland, mostly for the training - 10 months. 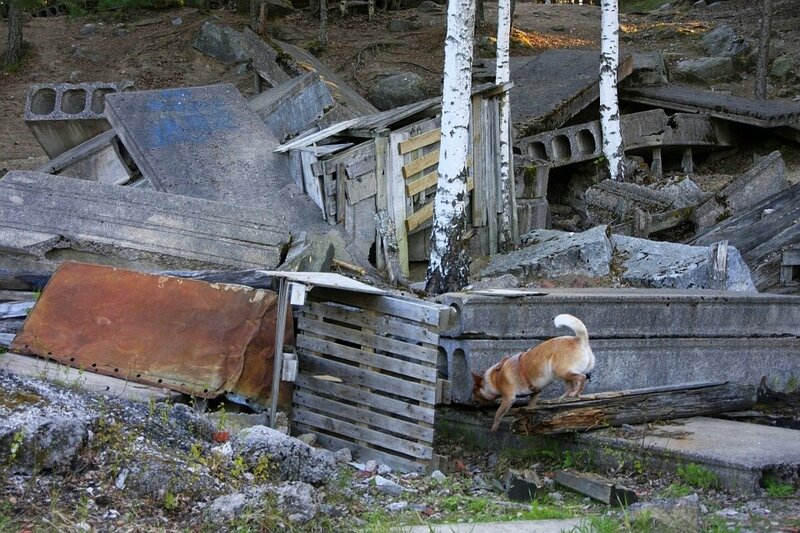 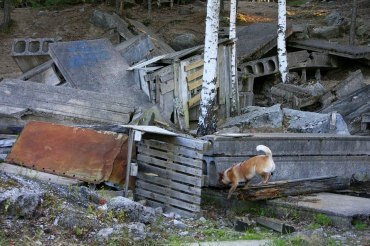 And some search and rescue training pictures from the ruins. 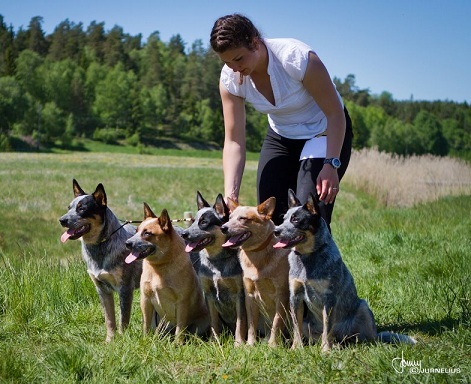 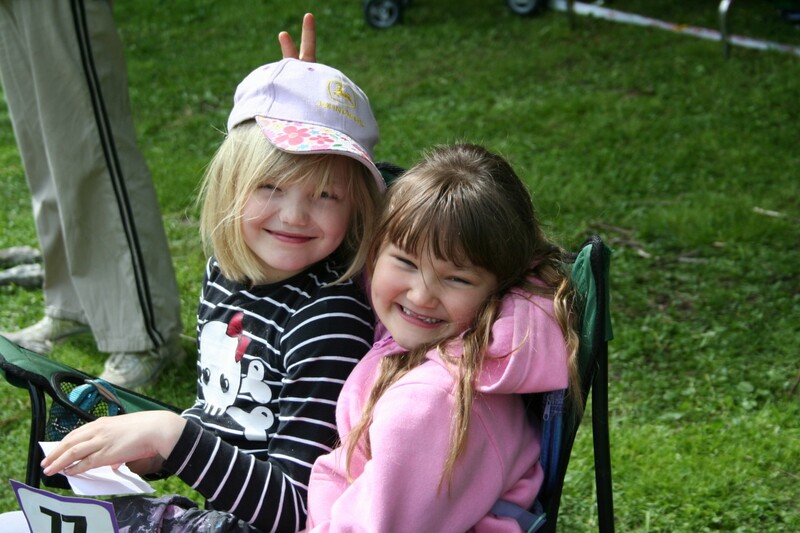 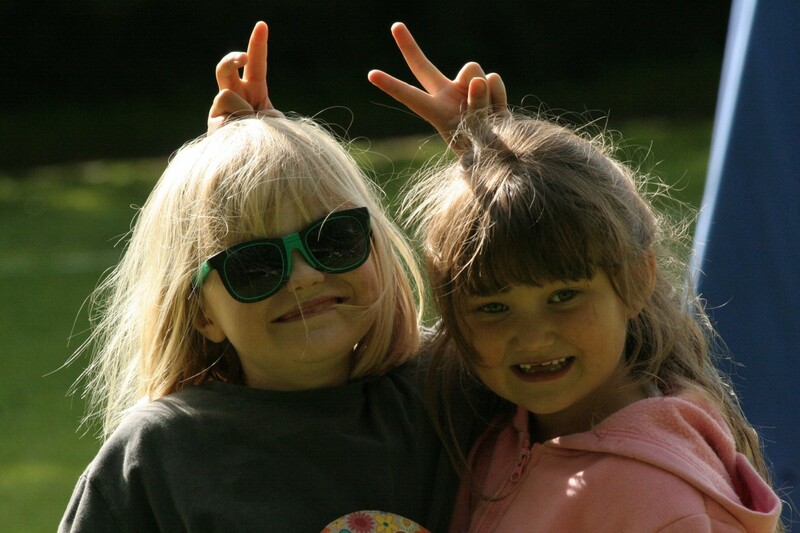 Pictures taken by Hanne Tuulos, click on them to enlarge. 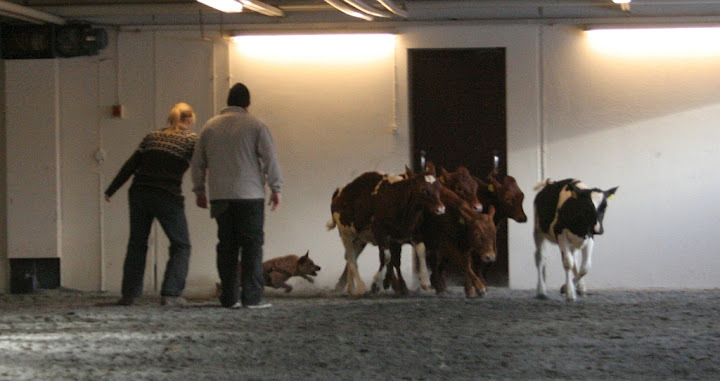 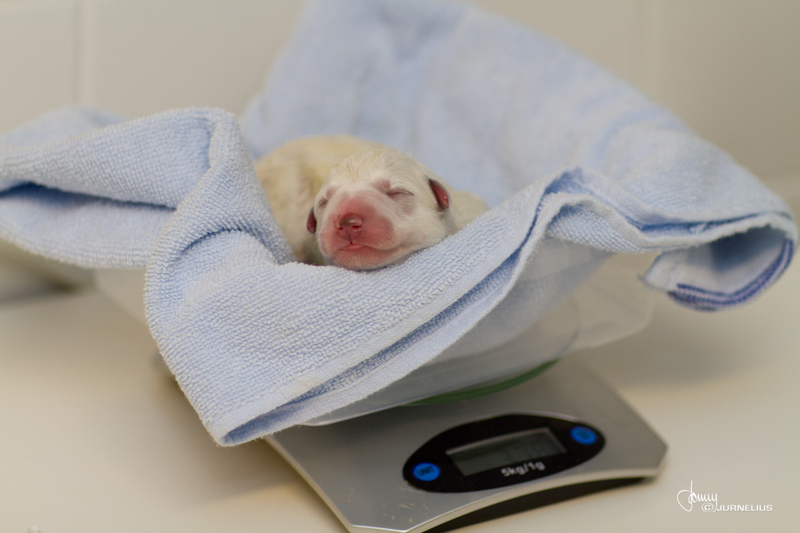 Today the puppies had Hearing/BAER test done. 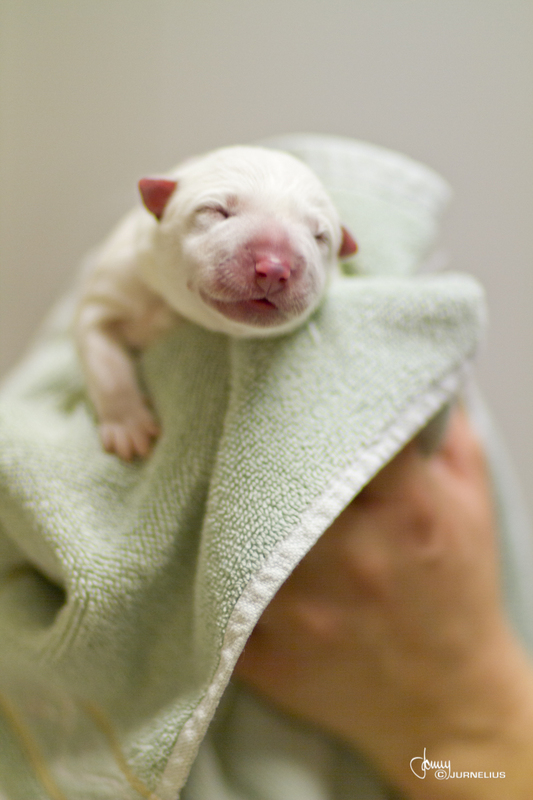 Unfortunately puppie No. 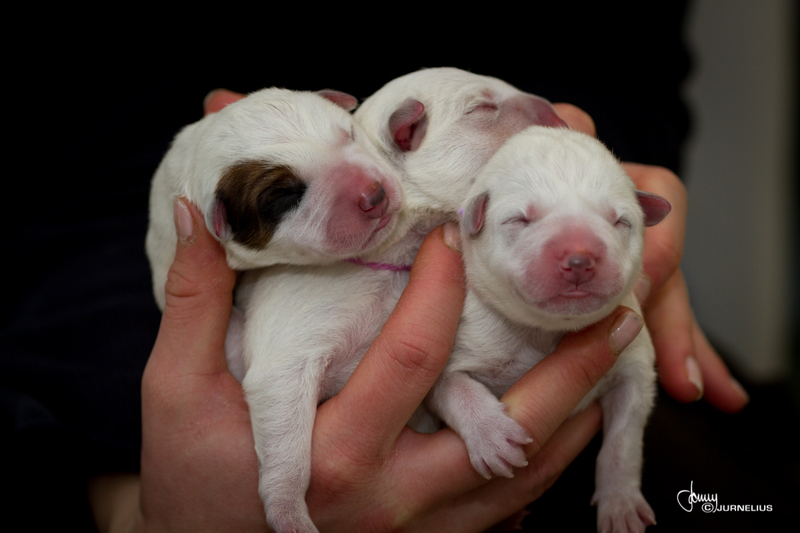 1 "Miss Pink" is deaf which I basically already knew, but now it's official. 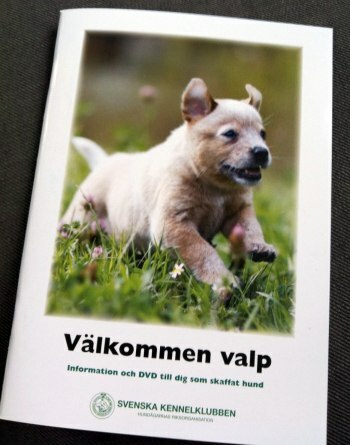 Puppie No. 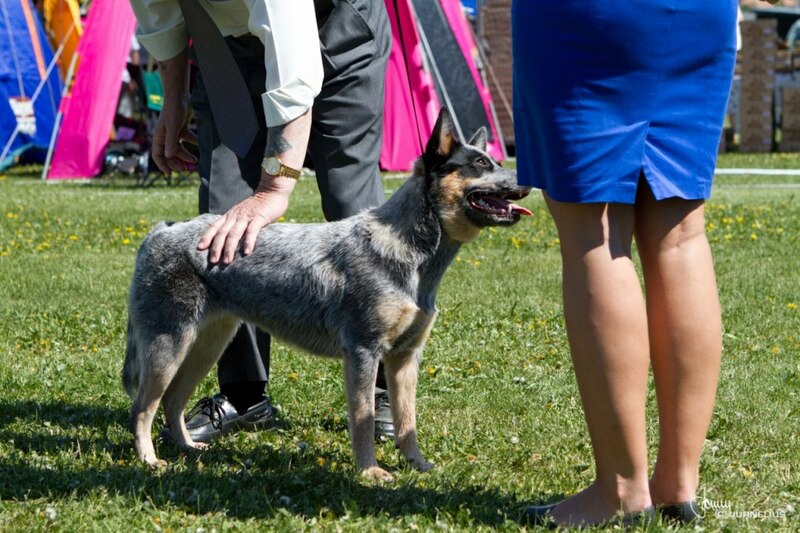 2 "Miss Purple" is deaf on one ear. 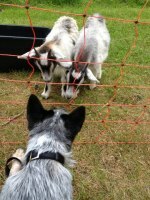 And the rest have bilateral hearing!